March 9 dawned misty and grey, with the temperature just above freezing in Great Bend. By launch time the sun was peeking out, but a strong northwest wind kept the wind chill in the lower 30's. 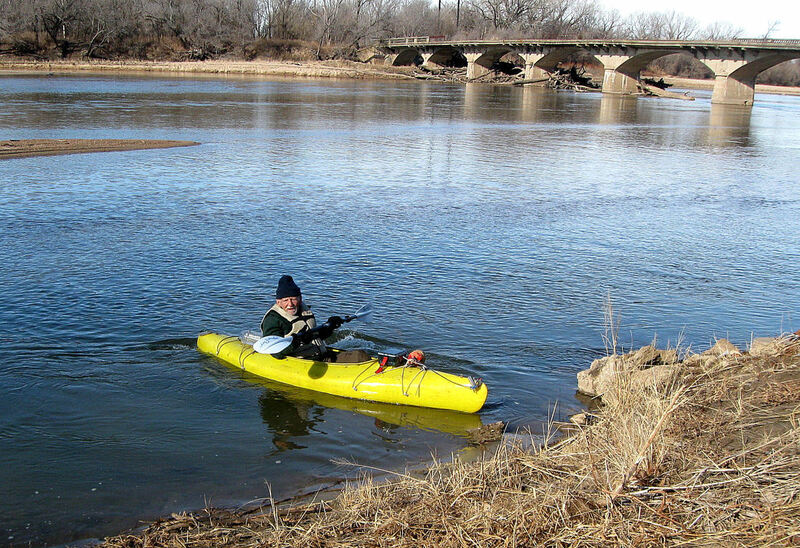 The River was running at 66cfs, so conditions were perfect for a trip to Ellinwood. 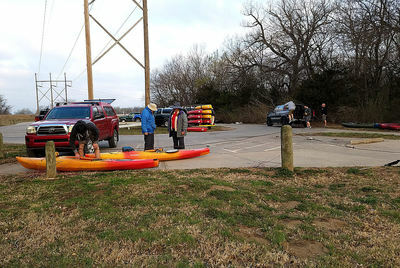 Eight paddlers- from all over Kansas-set out from a nice launch area on the north side of the River. The River was flowing fast, and with the wind generally at our backs we moved quickly without much effort. The challenges included the changing currents, both in the water and the wind, as well as submerged stumps and deadfalls in the thalweig. 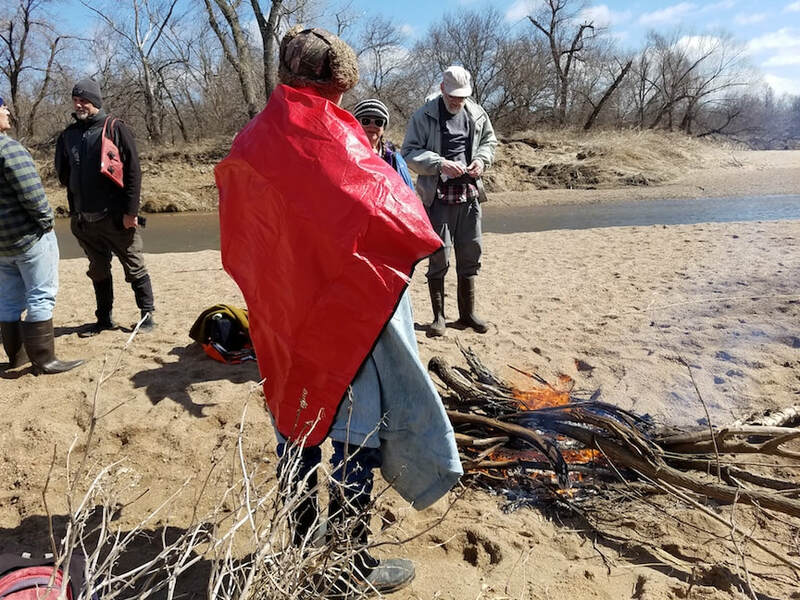 Where trees and water conspired to give us an unwelcome dunking, we were able to practice our cold water rescue protocols and enjoy a nice warming fire on the sand bar. We were running out of dry clothes by the time we reached Ellinwood, but the chill was gone by then. We encountered deer and herons, ducks and geese, and a flock of 10 eagles that flushed as we came around a bend. There was considerable evidence of beavers, though we didn’t spot any. The bones of dead cottonwoods stood with the sleeping trunks hopeful for spring. Less natural were the miles of steel revetment, both cabled caltrops and car chassis, that lined the river bank; as well as the pit sand mine that stockpiled sand in the river. The day-trippers left at Ellinwood, damp, tired and muddy. Three paddlers continued on after a shuttle to Raymond. Night was quickly falling, the River offered a few suitable bars for overnight, but the selection had to be made in the moment; after passing up a choice, there was no chance to return. We settled on a broad, flat, gravely bar with a supply of driftwood and connection to the south bank. The geese settled in as we did, their cries crescendoing as each flight was welcomed. An unwelcome cry was the sound of the emergency siren from Ellinwood. The sky showed no indication of bad weather, but it was unsettling just the same. After a very cold night on the sandbar, we awoke with the geese again conversing as they started the day's flight. Thetents were frosted, and our water bottles had a skim of ice. Another fire, our fifth since leaving Great Bend, warmed our toes and our breakfast. As it was the first morning of Daylight Saving Time, we got a late start by starting on-time. 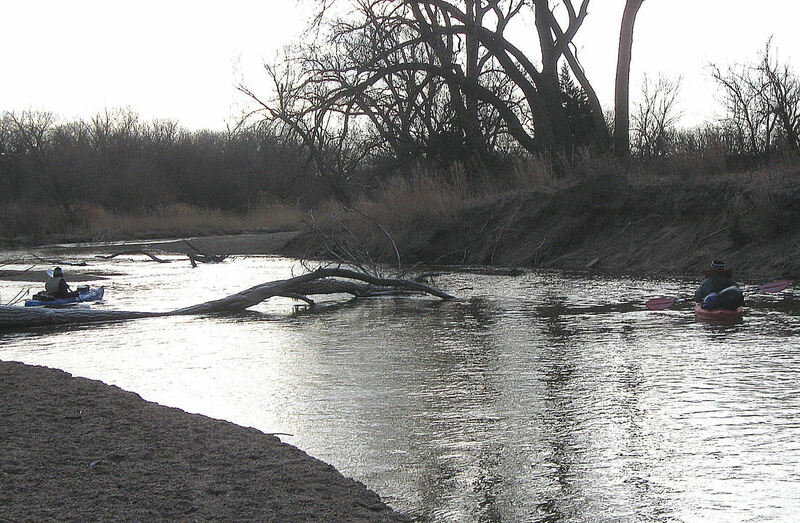 The Ellinwood-Raymond section of The River had the same challenges as we encountered from Great Bend, only moreso. The River flowed faster, the stumps and deadfalls were more frequent, and the capricious currents made paddling more exciting. The day warmed more quickly and by noon we had light breezes and 50°F to enjoy. We saw more herons and Canada geese, many more mallard ducks, more deer. By the end of the day we had done 3 portages and 2 fires, but fortunately no more dunkings. 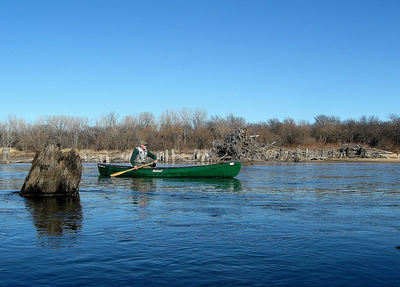 The River felt faster on Sunday, but the gage at Great Bend said otherwise, at take-out the flow was 58cfs. When we returned to Ellinwood to complete the shuttle, we found the cause of the evening siren; a burned-out house along the return to the Ellinwood bridge. 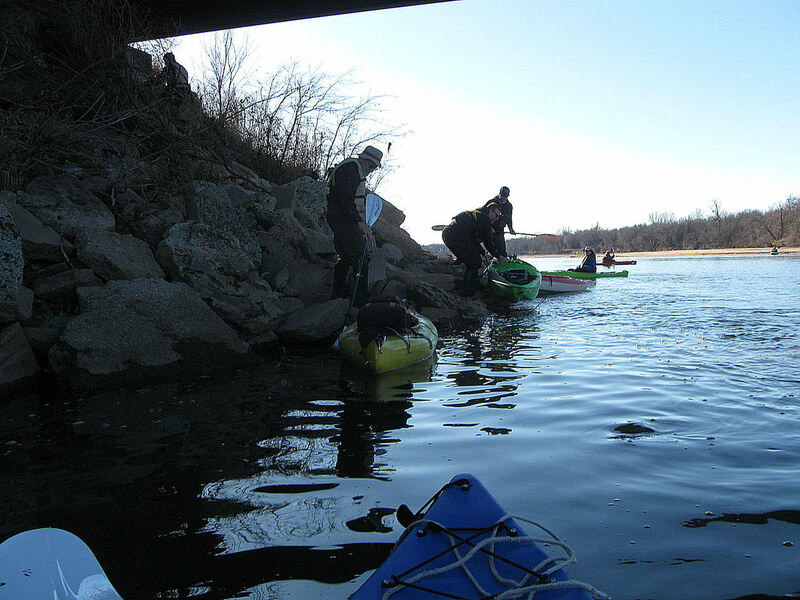 On Saturday morning, 6 kayakers gathered at the Arkansas River bridge west of Mulvane. By the time the morning shuttle was completed, the bright sun had chased the frost out of the surface of the sand at our launch site. We launched in calm winds and a swift current. 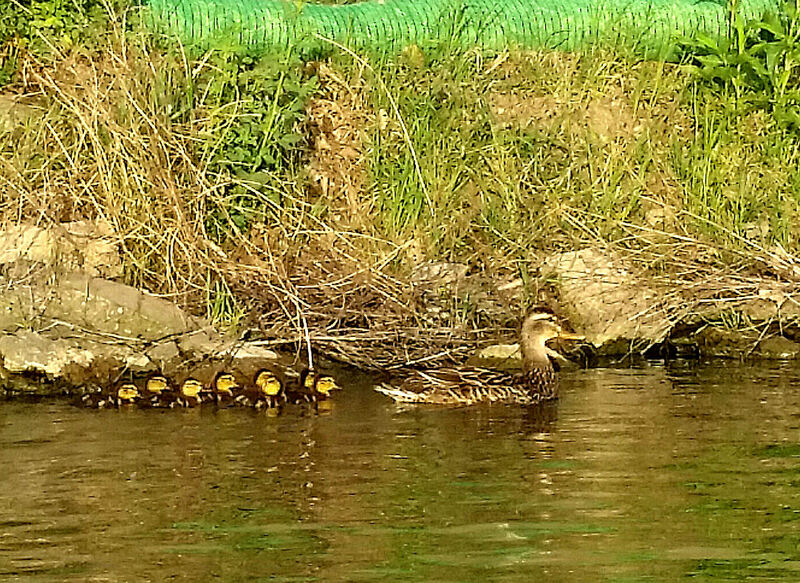 A flock of decoy ducks strained against the current as we passed, and their administrator called out from the bank in fine duck voice at the last of our parade. The majority of the rest of our trip was anxiously overseen by two adult Bald Eagles and one juvenile. A sandbar with an adequate supply of firewood presented itself for our lunch break. We enjoyed the sunshine and gathered what heat we could from our fire as the breeze picked up. Once rested and fed, we proceeded on with the current and wind primarily in our favor. We arrived without incident at our intended destination east of Belle Plaine. With boats and equipment loaded, we bid one another farewell and anticipated our next adventure. Thank you to all who made this trip a success. Hover over individual photos to see captions. Alternatively, click on first photo and move thru gallery using right arrows. Click on photo to enlarge. See our FaceBook page for additional photos posted by participants. Hover over photo for caption. Click on photo to enlarge. 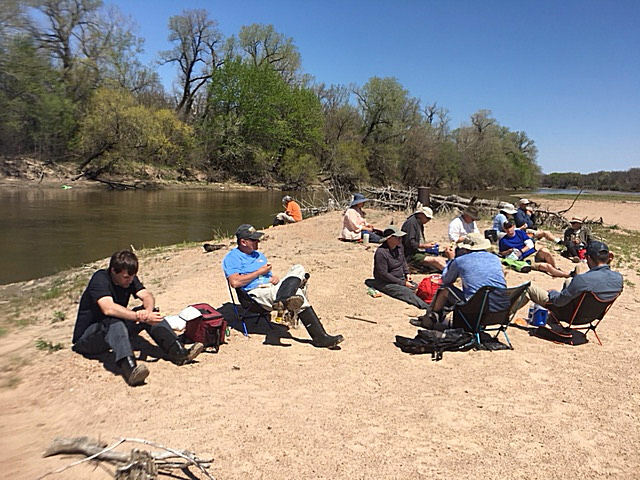 Great weather made this an almost perfect outing on the Old Goat Ranch and the nearby Arkansas River. 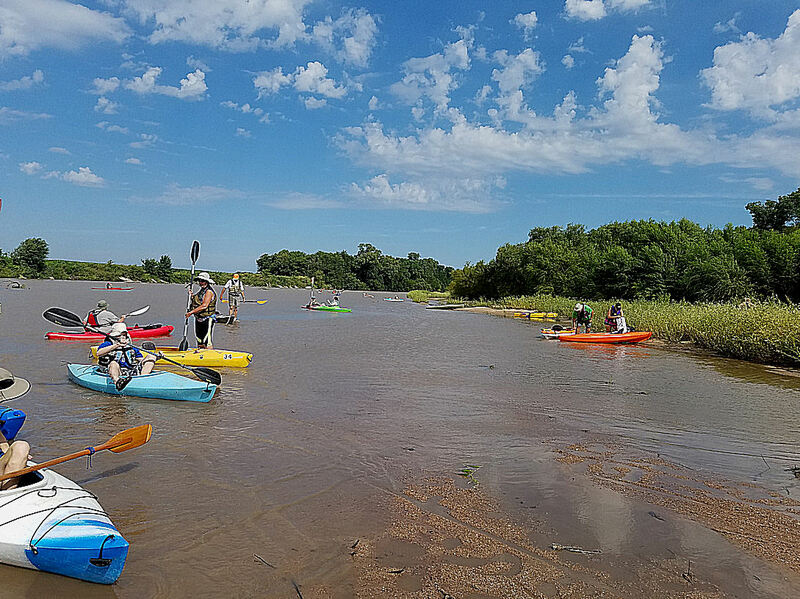 What was missing were a lot of Arkansas River Coalition members and others. Distractions such as holiday shopping, games on the TV and other weekend activities kept many folks away from the outing. 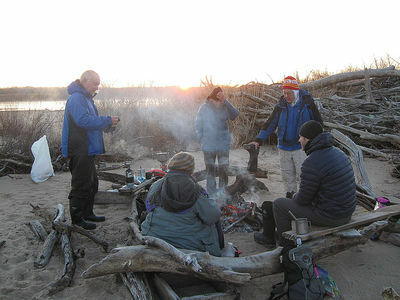 There were nine folks who attending the daytime hiking and campfire cooking activities on Saturday. This included the family shown in the accompanying photo. even more enjoyable mild weather. Thanks to Bill, the Old Goat Ranch owner, for allowing us to enjoy his rural riverside property. 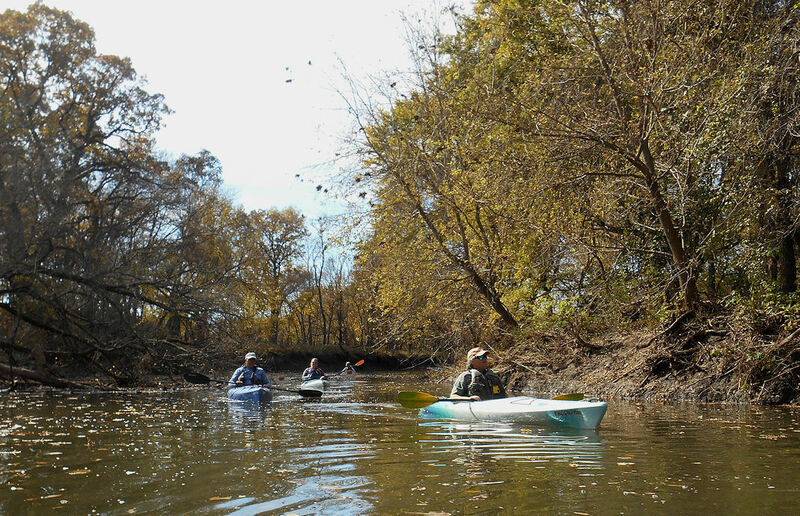 November 17th River Float Canceled! Cold weather and north winds convinced paddlers that they wanted to stay home! Another time! Hover over individual photos to see captions. Alternatively, click on first photo and move thru gallery using right arrows. 35 persons participated in the Sept. Twilight River Float. There were 34 kayaks and 1 canoe carrying 2 persons. 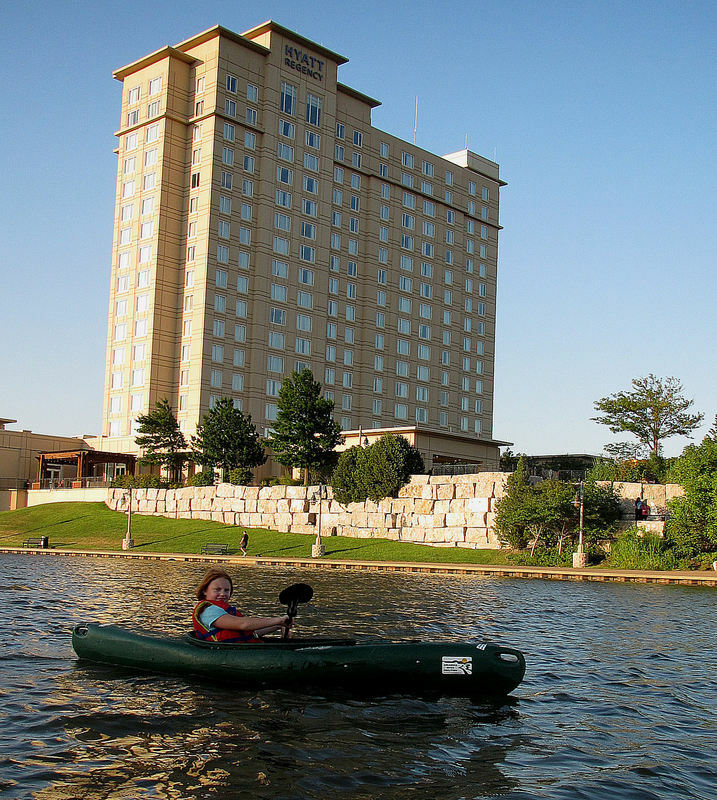 The early evening weather was pleasant and there was plenty of water in the Arkansas River for paddling. We launched boats from a 5-6 foot high, rocky river bank located in northwest Wichita, next to the intersection of N. St. Paul and Amidon streets. En route we paddled by some interesting 'back yards' behind homes located next to the river banks. 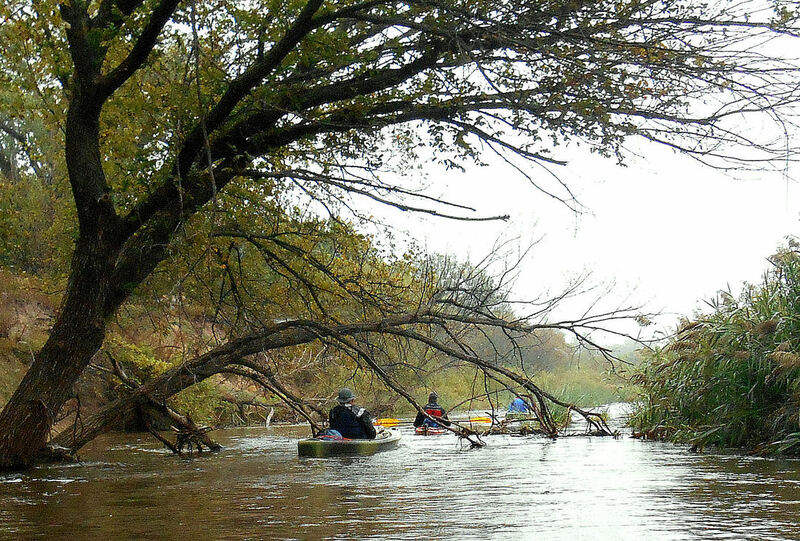 Some paddlers observed a couple of tent encampments in the trees along the river. We paddled under the Amidon/McLean Sts. bridge, the 13th St. bridge, and two large, water pipe bridges. The landing at Cowtown went smoothly for all........well, one person managed to flip his kayak at that unloading point but laughed at the minor mishap. ​Report of the August 25 - 26, 2018 float. 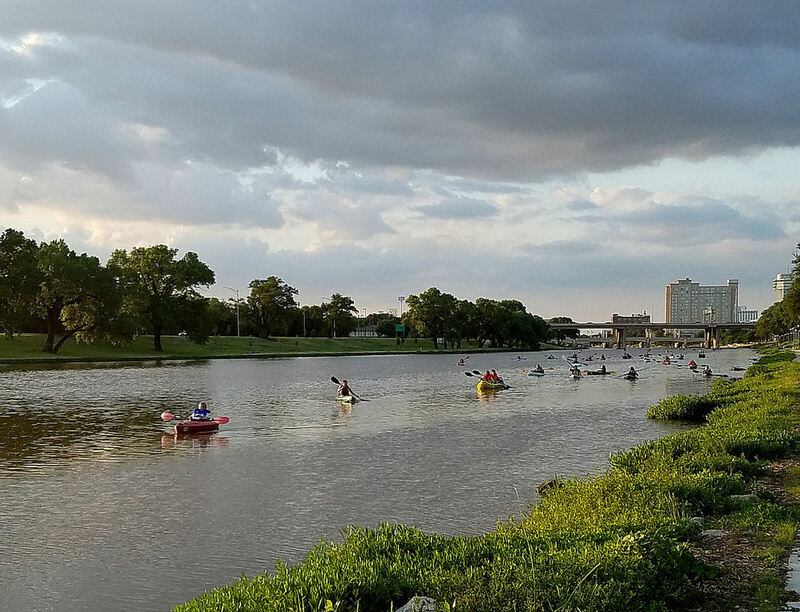 Over 30 persons took advantage of the paddling activity held from 4 to 8 p.m. at the Lincoln Street Dam area on Wednesday, March 15th. The late afternoon weather was sunny with a bit of initial humidity. As the evening progressed the temperature/humidity moderated and the waters were calm (except in the boat passage). 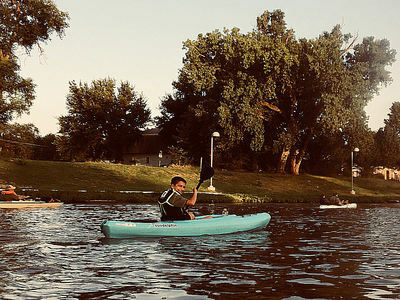 Paddlers had the options of trying several types of kayaks and floats, including various short and long length kayaks, sit-on kayaks and a paddle board. Mike even brought his special home-constructed laminated wood canoe and kayak for persons to test paddle. The other activity involved paddling inflatable rafts and other float-type crafts down the cascading waters of the boat passage located next to the dam. Both Roger and Vince gave rides to individuals down the fast-flowing rapids in their 2-person inflatables. 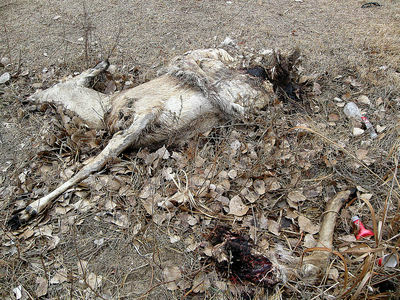 See the accompanying photos and captions for more information. With a bit of float site juggling, the Wednesday Twilight Float was put into action with success. 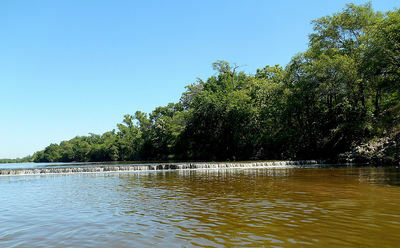 The float was originally to be launched from the riverbank at Herman Hill Park and land at the Chapin Park. With the Arkansas River running quite low up to the weekend before the planned float, Vince moved the float route site to the alternate (and pre-planned) route from the Cowtown ramp to the Lincoln St. ramp. 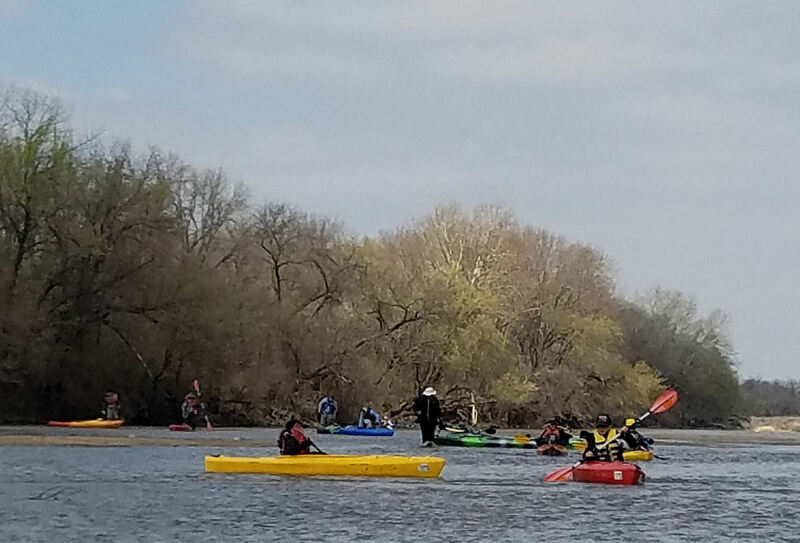 51 paddlers showed up with 48 boats to launch and paddle.......that's an indication a last minute float route location change was successful!......and the weather cooperated and was reasonably comfortable. Among the many boats there was one canoe with the parents and an infant son enjoying the nice evening on the water. A 2-person inflatable paddled by a couple of ladies also joined the parade. A couple of young boys were expertly paddling their small sit-on floaters. By and large the rest of the boats were kayaks of all colors and lengths. 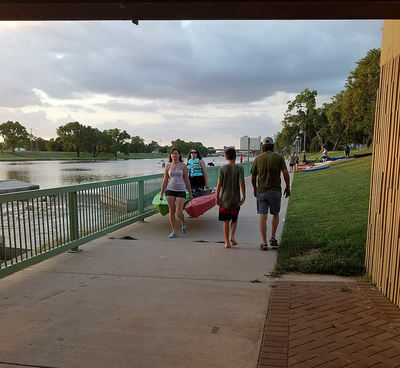 Boats were launched and the many paddlers enjoyed floating under bridges, past the Keeper of the Plains and Exploration Place.....and the downtown area. Landing at the ramp located just above the Lincoln Street bridge and dam went without a hitch at dusk time. Paddlers loaded boats and were on their way home after a successful and enjoyable river float. 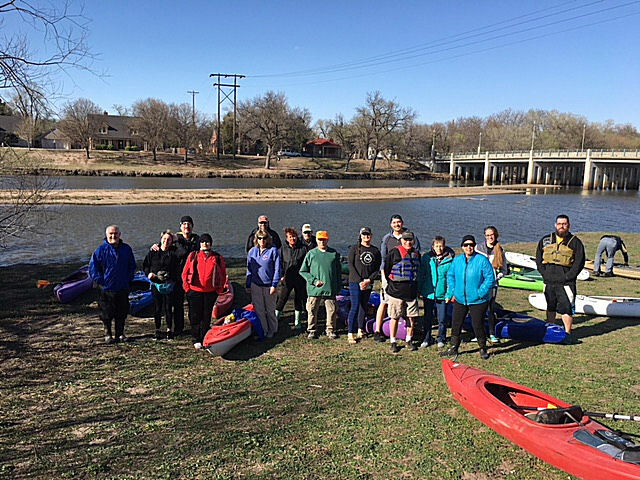 30 hardy paddlers met at the North Woodland Park launch site on the Little Arkansas River early Wednesday evening. 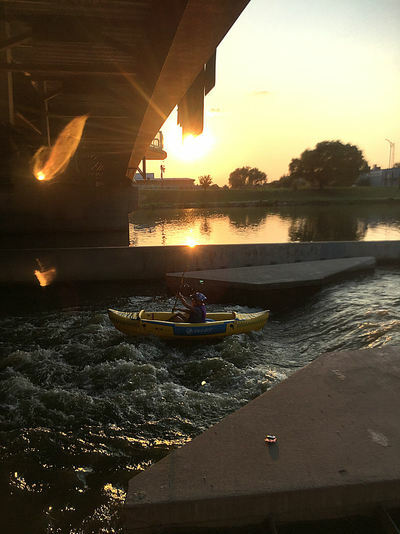 It was a hot evening with a complication: the launch site had a picnic table dumped into the water at the bottom of the ramp........a couple of the early-arrival paddlers were able to wrestle the heavy table out of the way so a normal launch could take place. There were at least 4 youth among the group.........the range of ages of the other paddlers was from from young to retired adults. After running a shuttle the multitude of colorful kayaks was launched into the water and the paddlers quickly found the side of the river that was shaded by trees. 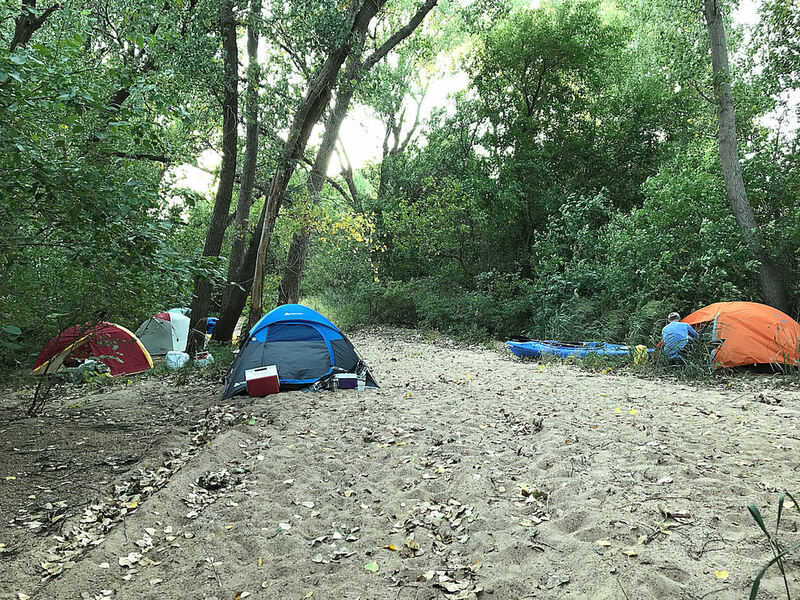 Some of the unusual sightings along the Little Arkansas River included the 'tent camp' on the bank near the launch site for probable homeless persons and at least two other similar 'encampments' under bridges along the river route. 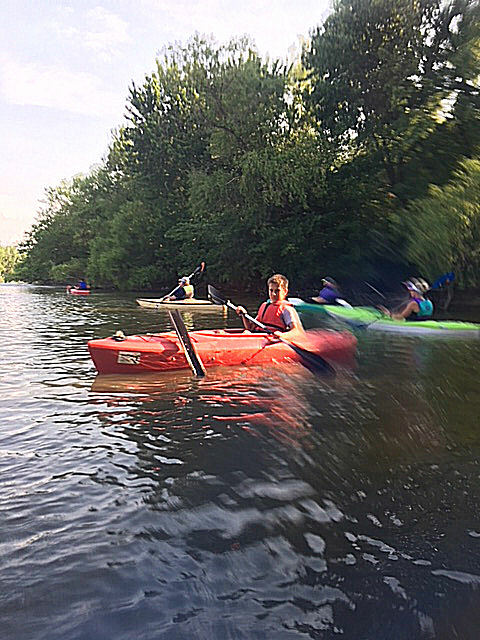 A breeze helped minimize the heat factor as we paddled under several bridges, by Meed Island and past several park and residential areas. Frisbee players were out in force and observed us as we paddled by their riverbank courses. Our landing at the South Riverside Park near the covered tennis courts was accomplished successfully, ending another pleasant summer twilight float. This float involved 17 paddlers joining together on a nice sunny and warm Saturday. 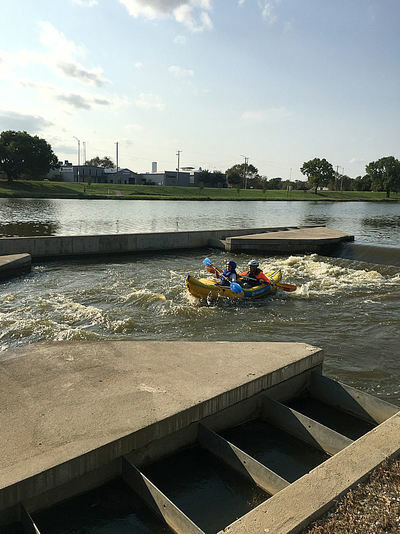 The float route involved a 7+ mile journey from the Garvey Park ramp located in South Wichita to the 71st Street south canoe launch. This was a half day river float on Memorial Day weekend. The water level in the river was lower than normal (about 175-180 CFS). NOTE: Some river hazards are pointed out in the below photos! Be especially cautious of the concrete encased pipeline jutting above the river bed if you are paddling in the area between the 47th Street South river bridge and the 63rd Street South river bridge. 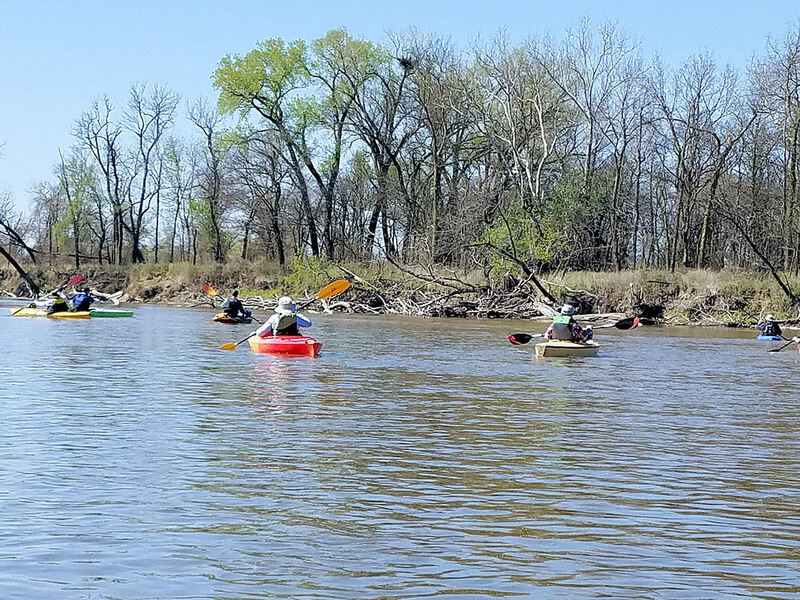 This float brought out 31 paddlers to enjoy a mild, sunny day. We paddled from a launch site located on a sandbar next to Sim Park (just above the red pedestrian bridge). Our landing site was about 3 miles further down the river at the ramp located just above the Lincoln Street Dam. 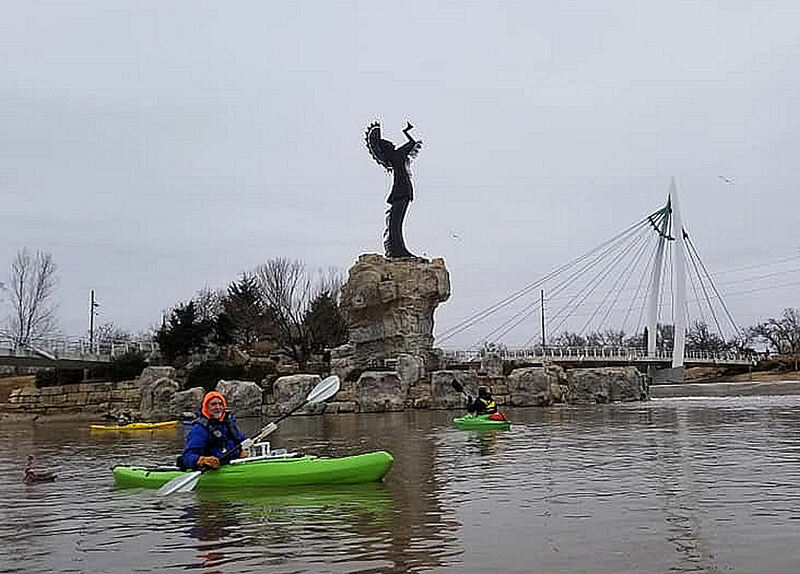 The photos below tell much of the floats' highlights with the Keeper of the Plains being the central attraction. Hover over individual photos to see captions. 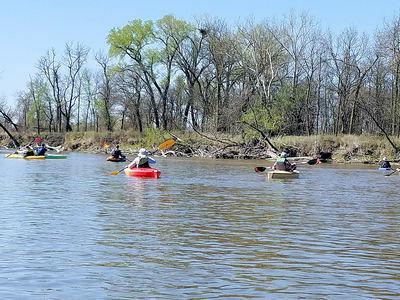 Alternatively, click on first photo and move thru gallery using right arrows..
On Saturday, April 28th, 22 paddlers gathered at the Burley Bend river access site (near Belle Plaine) to launch boats for a river float to Oxford. 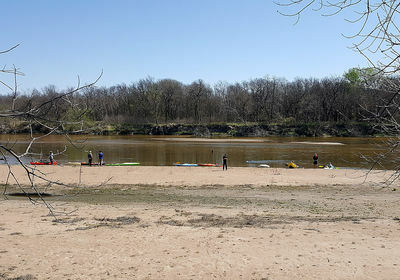 The weather was sunny and warm and the river water was running about 270 cubic feet per second as measured at the Mulvane river gauge. Of the 22 participants, a couple were from Concordia, two from Lindsborg, and one each from McPherson, Winfield, Belle Plaine and Rose Hill. The remaining participants were from their various residences located in Sedgwick County. 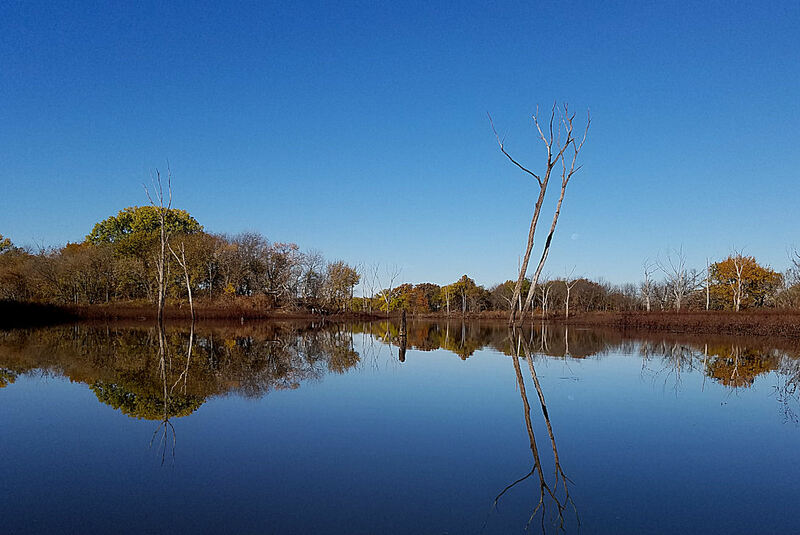 The Burley Bend site located about 4 miles east of Belle Plaine, has an all-weather parking lot located at the southeast corner of the river bridge and is accessible from K-55 highway. Access via vehicle was very good, but the immediate access to sufficient paddling water was a bit of a challenge. A steep pathway cut in the high riverbank led down to a narrow, shallow channel where paddlers had to wade and pull their boats over the sandy bottom to an adequate floating channel. Then the float was 'ON' and the below photos and captions tell the rest of the story. 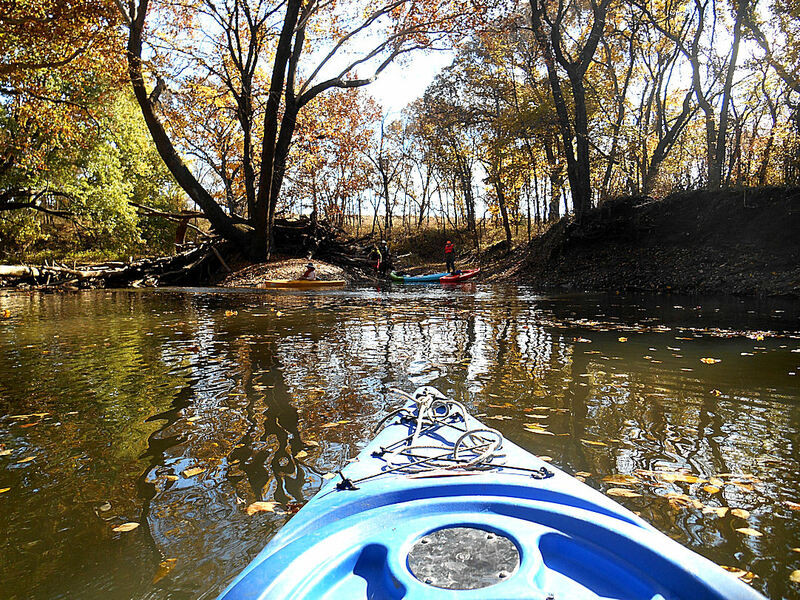 See also Kyra Hollis' photos on the Wichita Kansas Kayak Network page on FaceBook. The weather wasn't so bad: sunny and fairly warm, and a moderate northwest wind blowing. But...it was the Big Arkansas River that wasn't cooperating! 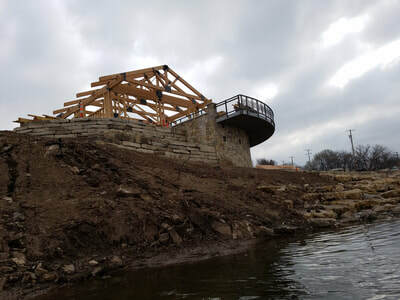 The City of Wichita partially lowered the Lincoln Street Dam the morning of April 18th, causing our fine launch site at Cowtown to have an unuseable water level......and the landing site located just above the Lincoln Street Dam had a bunch of muddy rocks exposed in front of the concrete ramp. On a Saturday, nine paddlers, not deterred by a fairly cold and cloudy day, began their river float. Later in the day the weather improved with some warming---the wind was not a factor. 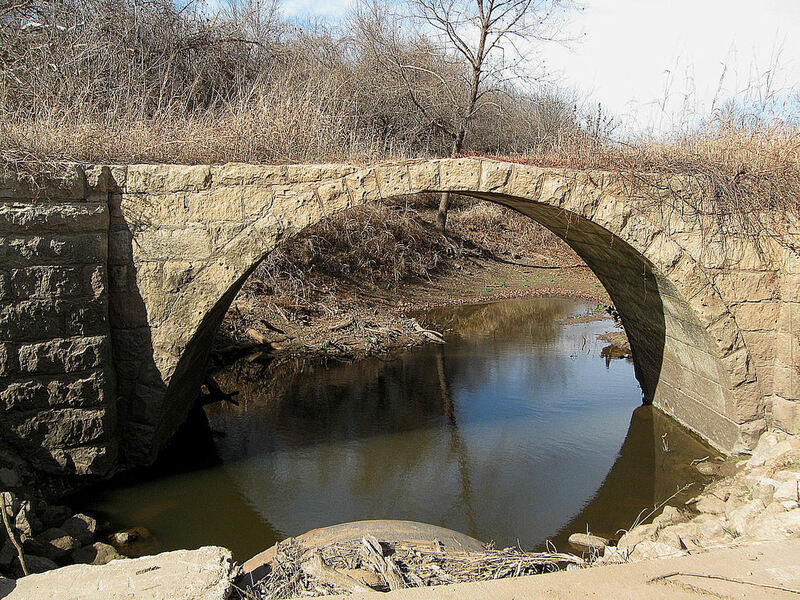 The launch site was beside the county road bridge across the Arkansas River located south of Alden. This site is one of the premier boat launch points along the total river's course. A local landowner takes pride in keeping the parking and launch area cleaned and maintained. The river was running at a minimal level of around 80 cubic feet per second (CFS), but was adequate for this float. Some overhanging trees, usually at sharp bends in the river, provided some maneuvering challenges for the paddlers. After a short lunch stop on a sandbar, with a campfire to enhance the setting (and to warm the paddlers), we continued on the 8-mile route, landing at the K-14/96 bridge located south of Sterling. 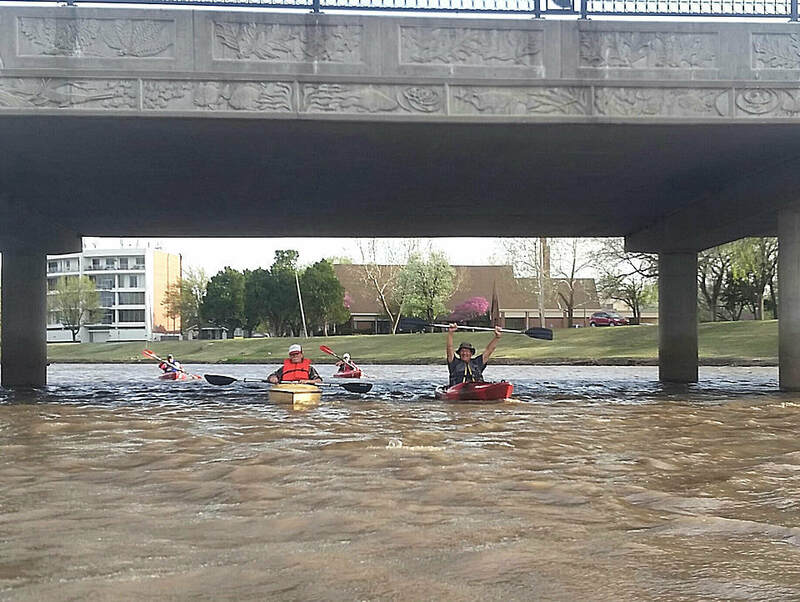 The day-only paddlers exited the river at that K-14/96 bridge location. 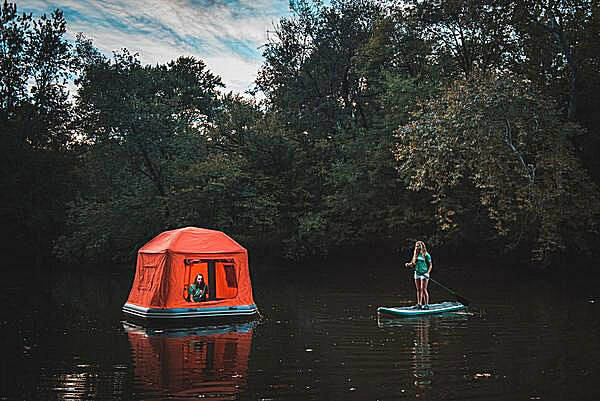 After a shuttle run, and with the sun taking over from the earlier cloudy conditions, the remaining four campers continued down the river. 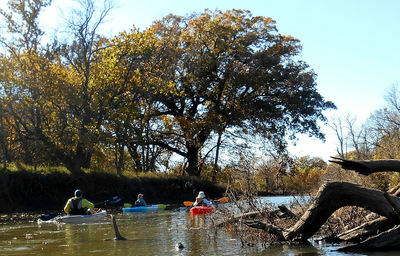 Many bounding deer and a big flock of wild turkeys were spotted by the paddlers on this section of the river. 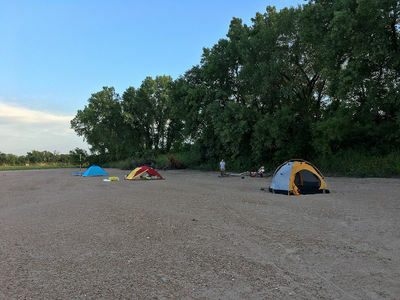 A sandbar with sufficient firewood and level areas for pitching tents was located and inhabited for the night. 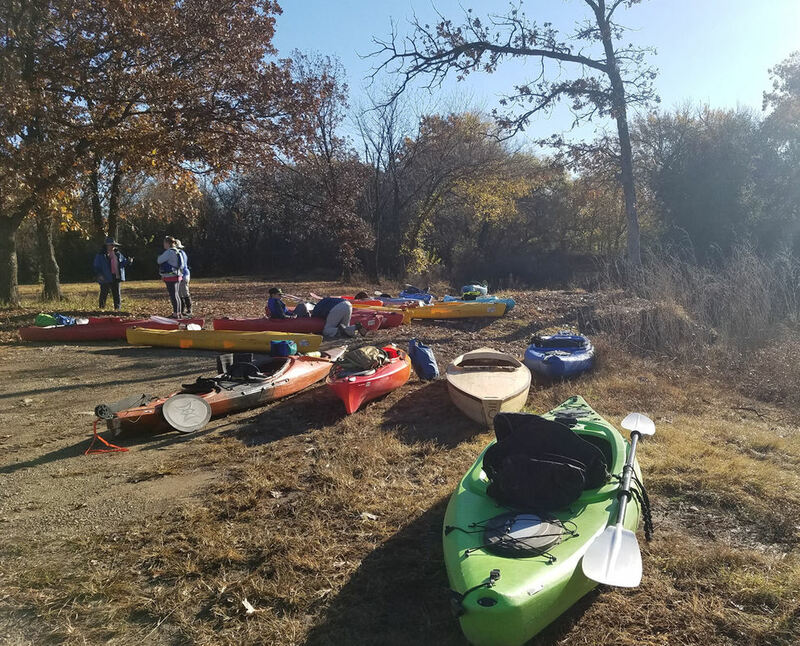 After a cold night, followed by the campers warming themselves around the campfire in the early morning, they packed their gear and loaded their kayaks. 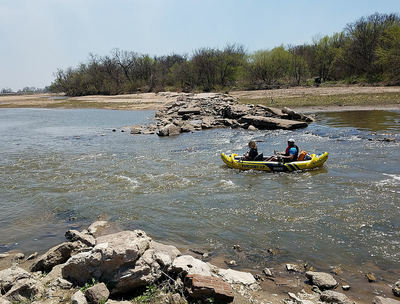 Other than a necessary portage around a low, fallen tree over the water course, the paddlers continued their journey uneventfully down to the landing site at the K-14/96 river bridge located west of Nickerson. 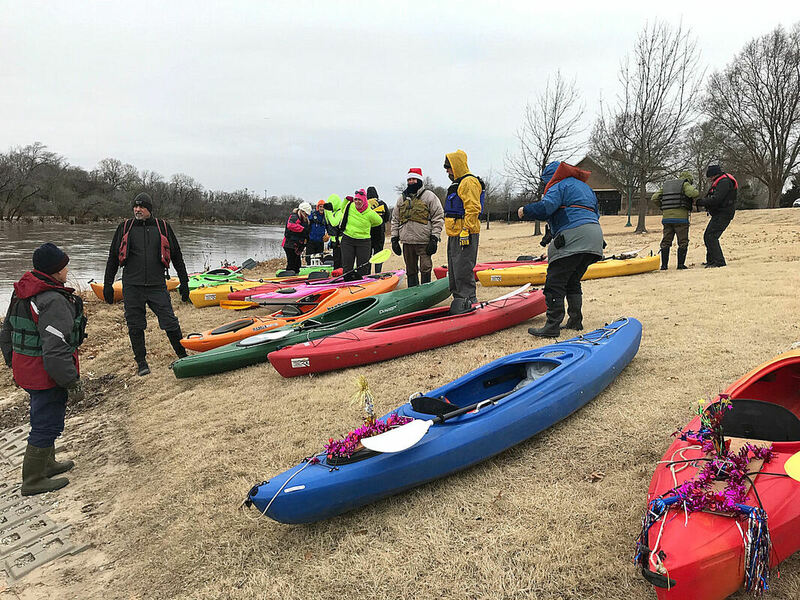 On Saturday, January 27th, 15 persons paddled a river course from the Rainbow Bend river bridge to the Gueda Springs bridge, while some continued their river journey later on to Arkansas City. The weather conditions were favorable with a nice sun warming up this late winter day. The river flow at Oxford (above Rainbow Bend) was 460 cubic feet per second while at Arkansas City, the flow was 650 cfs. While the water flow was adequate many shallow sandy shoals were encountered on the route. 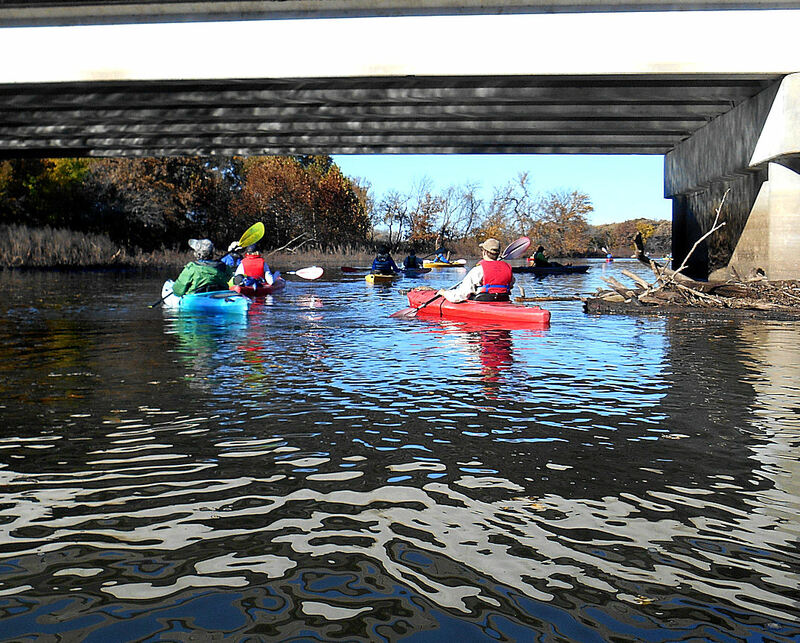 The Saturday-only paddlers exited the river at the Geuda Springs river bridge. 7 persons continued on down the river to camp on a sandbar and then finish their river journey at the Arkansas City landing site. 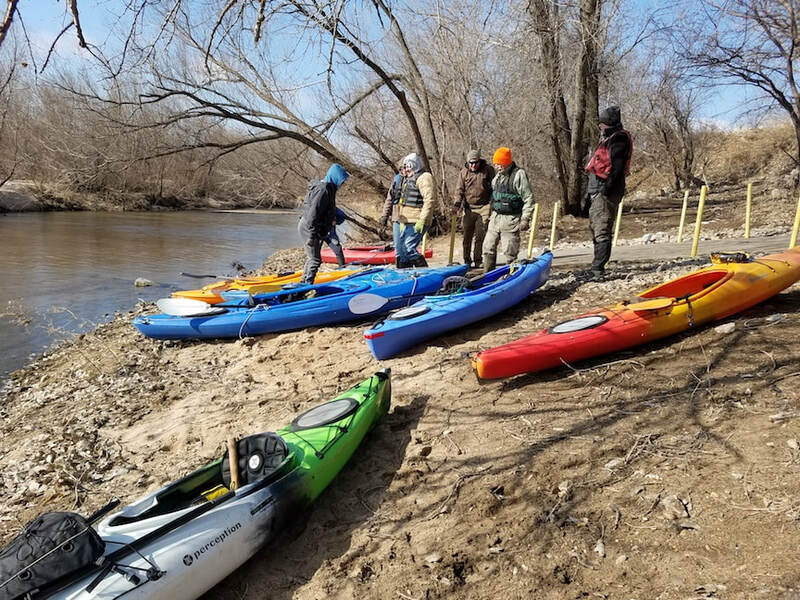 On this New Year's day, 8 veteran kayak paddlers showed up to enjoy this annual river float event......this includes Bill H., Kevin, Mark H., Russ, Steve, Vince, Wally, and Ziggy. Also on hand were Hoyt Hillman and Rick Rodenbaugh who assisted with launching boats and running the vehicles shuttle plus Rick shot some photos. The weather on this day was quite cold, around 15-16 degrees, but the sun was shining and there was negligible wind. The river was running somewhere between 135 and 150 cubic feet per second as measured at the John Mack Bridge at Broadway. 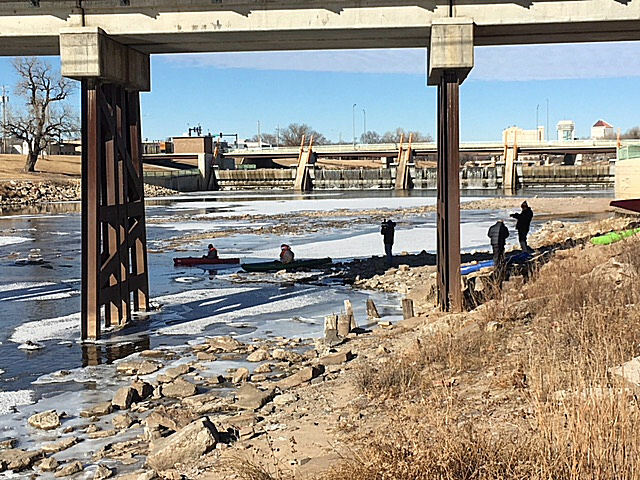 The water below the Lincoln Street dam was not frozen solid so we launched at that site. With a couple of news media persons documenting our launch, we slid over the river ice that was lining the shoreline and were soon navigating down the open river channel. The water in the channels was not deep but adequate in most places for paddling. Also, the river water was quite clear and the edges of the various channels were lined with thin sheets of ice. We initially paddled under the K&O RR bridge, then the bridges at Harry, Pawnee, Broadway streets and the UP RR bridge. After viewing mostly urban structures and development along the river banks, we experienced a more rural environment on the river course from the UP RR bridge on to Garvey Park. We passed some frisbee enthusiasts in Herman Hill Park and Kevin had to paddle over to near the shoreline to retrieve an errant frisbee from the ice for them. Below the UP RR bridge we spotted 3 persons gathered around a campfire on the wooded bank. Landing at Garvey Park was uneventful with Hoyt assisting us. 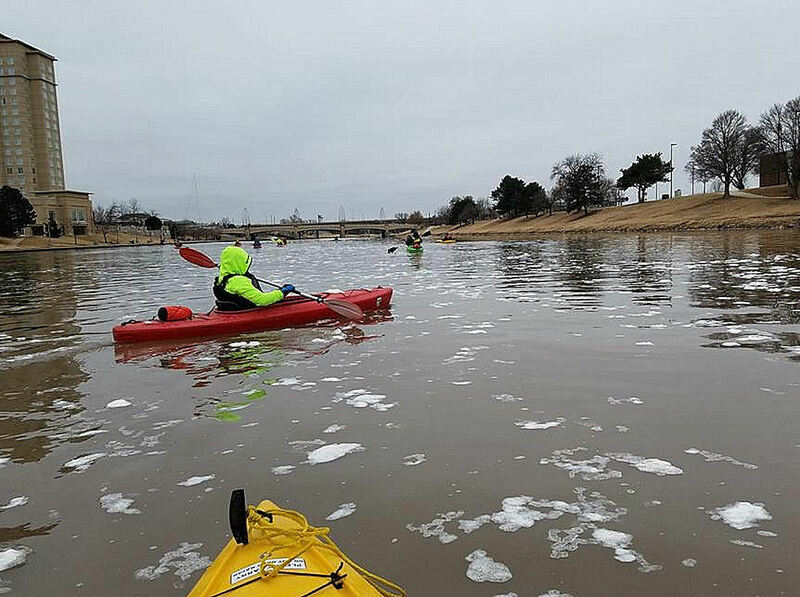 We knocked the skim ice off of our kayaks and paddles, loaded up and headed for our warm homes. On October 28th, the following paddlers showed up on a cold (initial temperature in low 20s) but sunny morning: Brian, Donna, Justin, Mike, Rod (from Concordia), Vince and Wally. 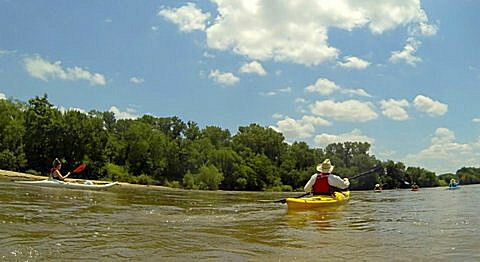 Although most of the sandbars and river banks were lined with vegetation, this paddler floats by a high sand bank. Shown in this photo is Wally in his little yellow kayak and Brian in his very long hybrid kayak/canoe. The Saturday only paddlers completed their river journey by exiting at the Sterling K-14/96 river bridge. The river generally has a single moderately wide channel, but pictured is a smaller channel on one side of a large sandbar island. Such narrow channels with swift flowing water were challenging and fun to navigate. A couple of the paddlers, Wally and Vince, were the only campers who completed the full river journey by paddling down to the west Nickerson K-14/96 river bridge. As an interlude on Saturday night, they pitched their tents on a very large island----a sandbar covered with small willows and salt cedar vegetation. 16 paddlers participated in this Twilight Float. We followed a route on the Little Arkansas River from Woodland Park to Meed Island and back......a distance of slightly less than 3 miles total. Vehicles did not need to be shuttled as we launched and landed at the same site. The early evening was pleasant,with mild weather and there was little wind and an adequate river water depth to float in. After a good launch of the 16 paddlers on the Little Arkansas River that runs along southeast corner of North Woodland Park, we found the paddling downriver to be easy and relaxing. Our river route took us under the 18th Street bridge, by North High, and under the 13th St. (Minosa) bridge. 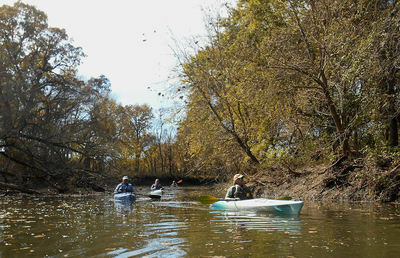 We then skirted Meed Island by paddling around the main and northwest channel of the Little River. Meed Island is a 3 acre undeveloped park of the City of Wichita and is quite overgrown with big trees and lots of underbrush. It is only accessible by wading or boating across the river. At the southwest end of the island we changed our course to paddle up the very 'remote' and narrow southeast channel. There were a few tree limbs hanging above the water that we had to duck under or around. A few older homes located on the east bank of the south channel had old boat launches and/or decks next to the water. 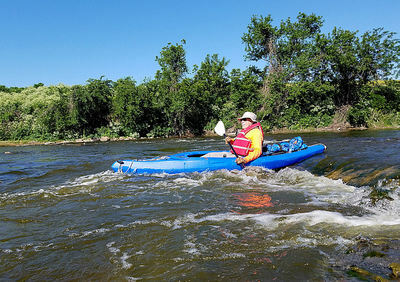 The return journey up the Little Arkansas River was easy paddling with almost no facing current. 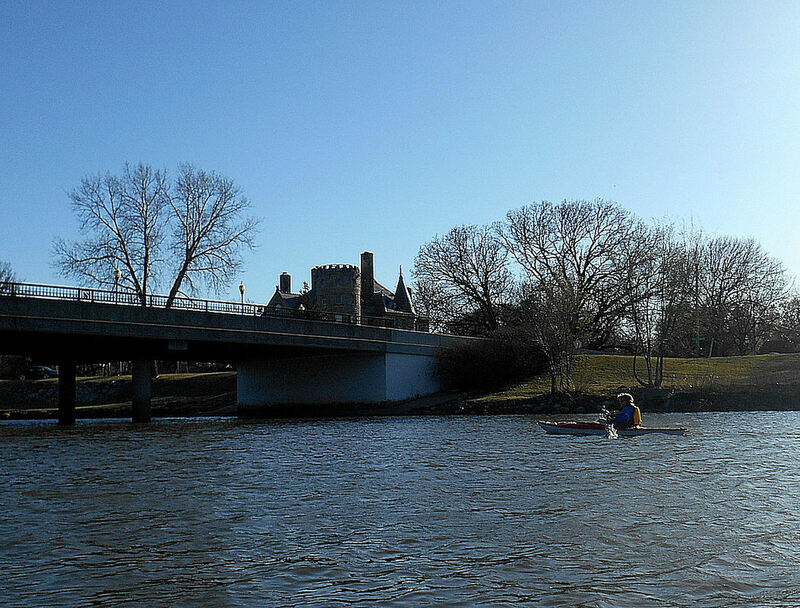 One paddler even went on up the river to about the 21st St. bridge and then returned. Landing and loading the boats was a smooth process. 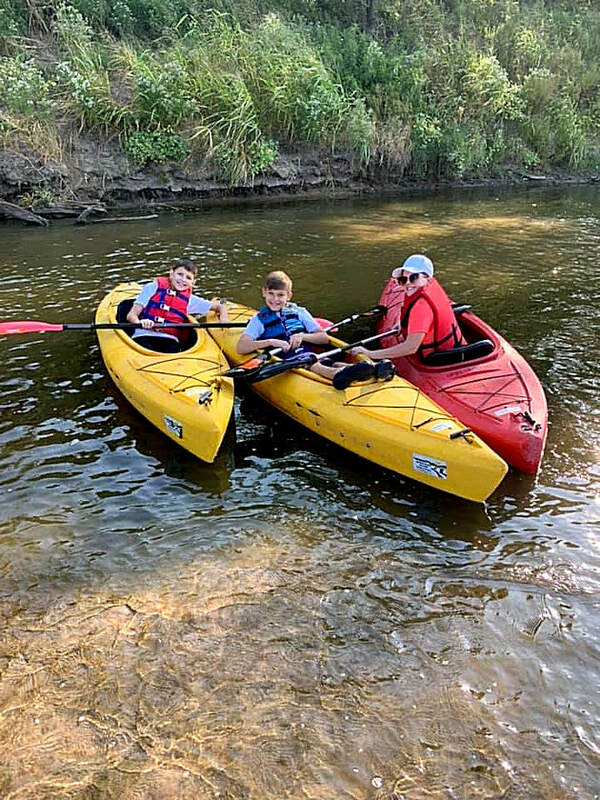 A recently retired couple who made the float were pleased with their introduction to paddling kayaks and indicated an interest in joining future river floats. 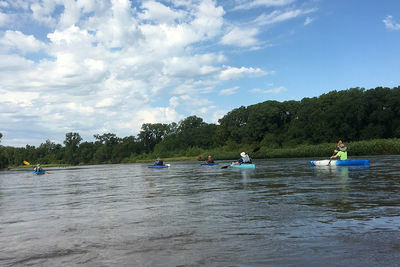 The float route was from the K-55 river bridge over the Arkansas River located east of Belle Plaine (Burley Bend access site) to Cave Park in Oxford. The launch site at Burley Bend has a nice gravel surfaced parking lot and the landing site at Oxford has even better paved roadways and ramp. On the morning of the float, the cubic feet per second at Derby was 302 and at Oxford, 492. The increased amount at Oxford was largely due to the water flowing into the Arkansas River from the Ninnescah River, located north of Oxford. After shuttling most of the vehicles to Oxford, we returned to Burley Bend and launched boats. The actual path down the bank to the river bed was fairly steep due to recent high water eroding that area. Also, at the bottom of the access path we had to pull our boats over a fairly narrow and shallow channel of water to the main channel of the river. 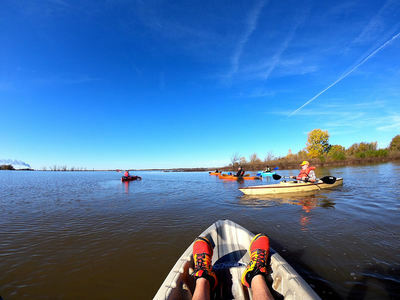 12 paddlers in 10 boats (1 tandem, 1 canoe) had a good weather day for the float. 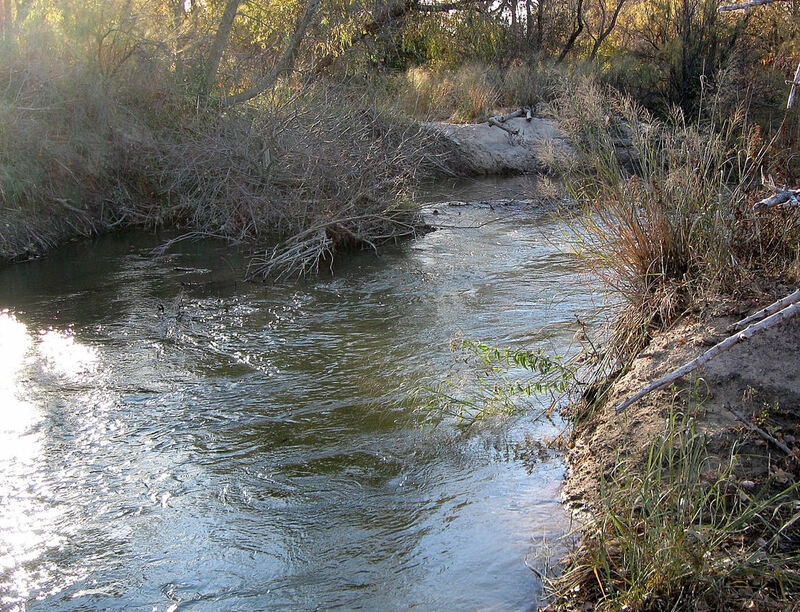 The river water level was a bit low due to the late summer flow and lack of any significant rainfall upriver. Most of the river course, at least down to the mouth of the Ninnescah river, had some shallow areas that we had to dodge around or slide over. We spotted some eagles and water birds, and a few fish were jumping about the water. Connections regarding common work places and homes and friends were made between the folks as they paddled down the river. After a brief morning rest stop along the first half of the river course, we continued downstream to a sandbar located just above the mouth of the Ninnescah River where we pulled onto a sand bar and had our lunch break. After lunch we continued on down river where we observed several very old capped oil well pipes jutting above the water level in the river and old pilings that supported the old drilling rigs. We reached the old Oxford Dam which stretches across the river in a line of cement rubble. We paddled without problem through a fast flowing water gap located to the south side of the old dam. 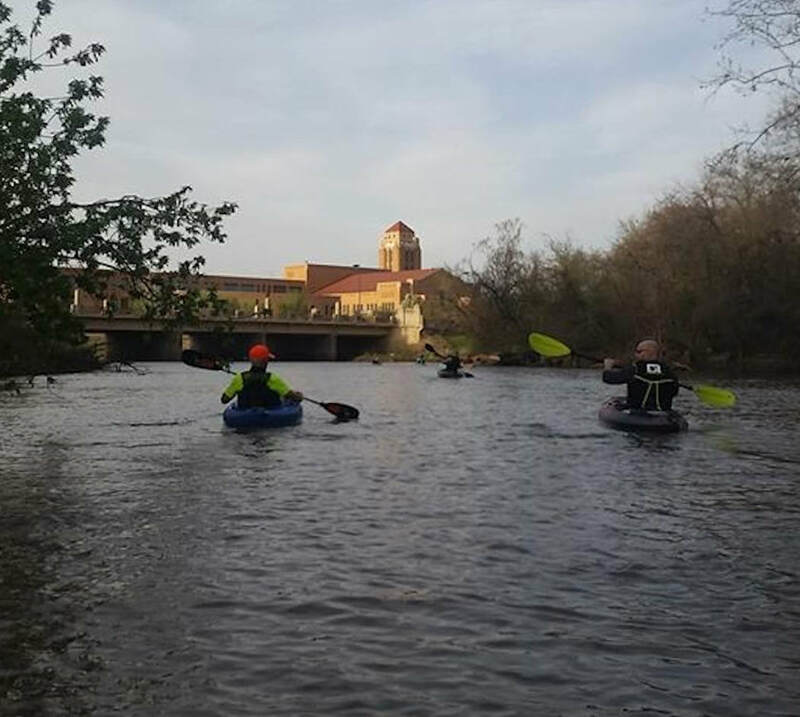 The paddlers continued on down the river taking advantage of a bit of increased water flow. There was one particularly interesting water channel that cut through a big sandbar located in the middle of the river. This channel was 40-50 feet wide, had cut banks on both sides that were 2-3 feet high, and a water route through the sandbar that was several hundred feet in length with a nice flowing current. 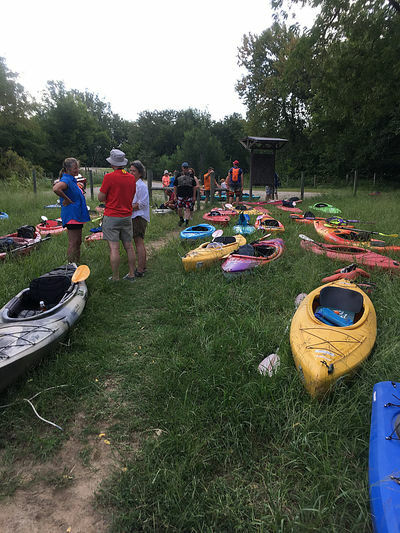 By early afternoon the paddlers reached the ever-friendly landing ramp at the Cave Park in Oxford and successfully completed their river journey. 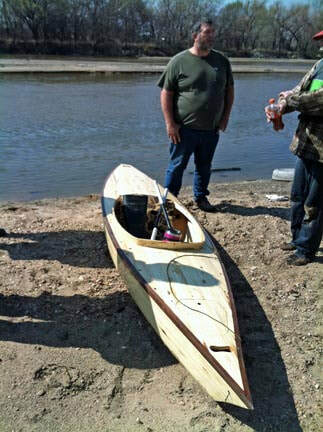 Regarding the canoe below: Mike from Belle Plaine made this beautiful canoe out of old cottonwood pallets! This writer was able to paddle in the canoe for most of the river route and found that it handled very well.....it was well-balanced and proportioned and pleasing to look at! This float was re-scheduled from the rained-out session originally set for Wednesday, August 9th............and the float on the 16th looked kind of 'iffy' due to a good rain shower in the early afternoon. By 5 p.m., the weather had cleared and the Wednesday Twilight Float was on! Around 20 paddlers showed up, plus the little boy whose age was just under 5 years old. He was a rider in his dad's kayak. 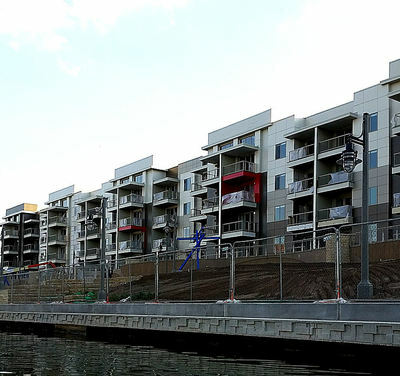 The launch site was just below the Bitting Street bridge over the Little Arkansas River (along 12th St.) and the landing site was near the Wulf Tennis Courts in the South Riverside Park. A time-saving shuttle was possible as some folks first drove cars to the landing site and caught a ride back to the Bitting Street bridge area. 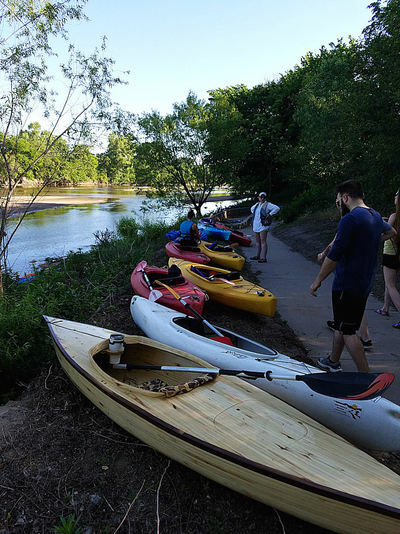 The paddlers experienced an uneventful launch of 20 single kayaks from the old cement landing platform (1930s vintage) onto an gently flowing Little Arkansas River. The sun was peeking through light overhead clouds and there was a slight breeze that helped provide an enjoyable time for this Twilight River float. 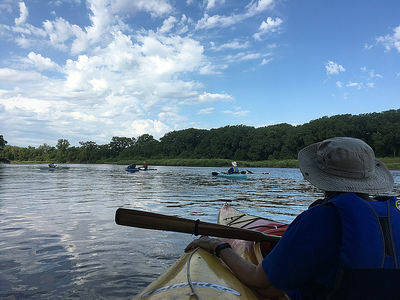 Some participants worked on refining their paddle strokes, others just gently cruised and visited with fellow paddlers and did some sightseeing of homes, parks and wildlife along the river course. One paddler even retrieved a floating ball from the river water that had escaped from a couple who were playing with it on the riverbank. 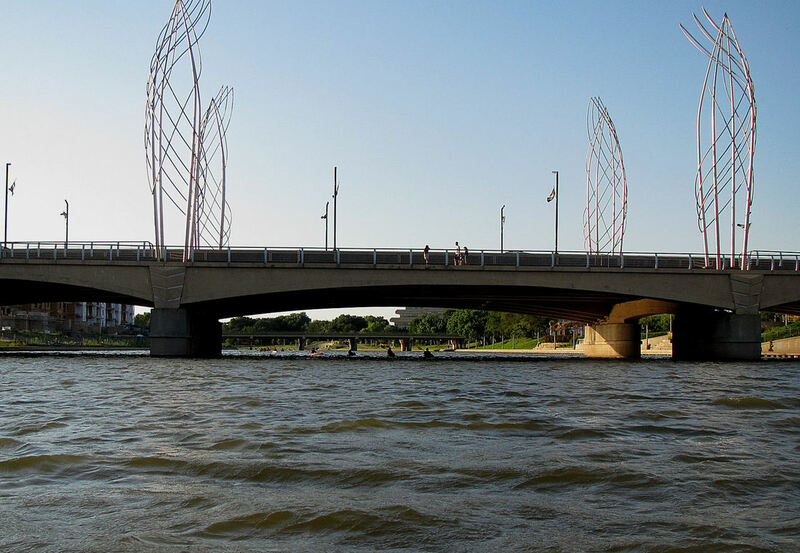 This writer was asked by a couple of paddlers 'what the signs meant on the upstream and downstream sides of the Murdock Street bridge (see images below). The signs seen on the side of the bridge when paddling downstream read, "Un-Powered Boats Not Permitted Beyond This Point". The signs seen on the side of the bridge when paddling upstream read, "Powered Boats Not Permitted Beyond This Point". We paddled on by ignoring the signs as we always do. The signs are from past years when the Little Arkansas River was partitioned for either powered boat use (below Murdock bridge), and rowing and paddling boats (above Murdock bridge). Now it is time to take the signs down (City of Wichita take note!). Once we paddled past the sentinel Murdock St. bridge and the Nims St. bridge, we all made it to a floating dock and landed dry and high. Another Twilight Float successfully completed! 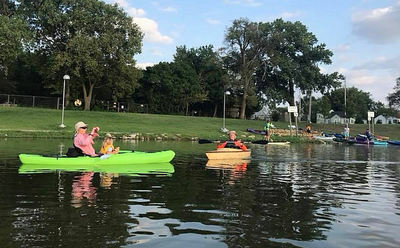 15 paddlers joined this 7.5 mile-long float from the Ridge Road bridge over the Arkansas River to the Arkansas River Park in Wichita. Kyle, Bob, Mark S., Julie, Will, John, Mike, Kaye, Armin, Sylvester, Jodie, Mark B., Philip, Quintin (a guest paddler from Hannibal, MO.) and Vince were the featured river paddlers of the day. ​Most participants gathered their vehicles at the landing point where we left 3 vehicles for a later shuttle back to the launch point.......then we drove the other vehicles loaded with all involved folks and their boats up to the bridge at Ridge Road.....a reverse vehicle shuttle and a time saver for a timely start. What a great day for being on the river! 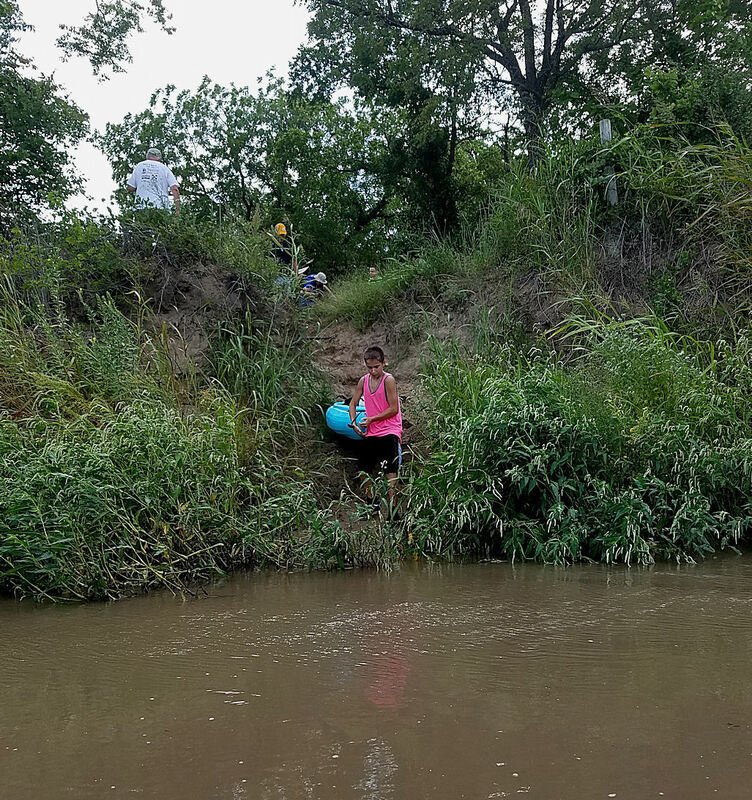 It was much cooler (lower 80s) and the sky was lightly overcast with clouds......and the river water was running 272 cubic feet per second (CFS) at the Maize river gauge.....a little low on the CFS but otherwise a fairly good combination for a successful river float. 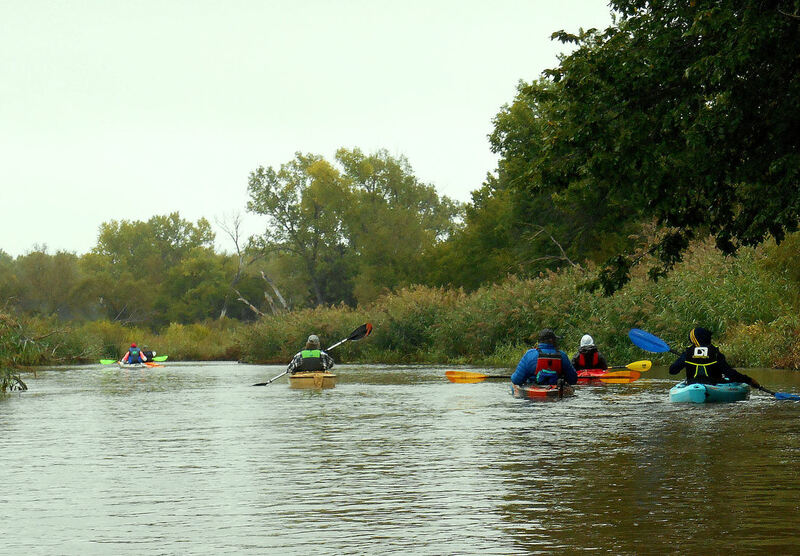 All kayaks (and 1 canoe) were launched by 8:30 a.m. and we started our journey to the southeast. A fairly nice flowing current assisted our progress downstream......an occasional shallow area impeded our progress only slightly and some paddlers briefly walked their boats over those few offending areas. Lots of birds were observed and the trees and other vegetation along the banks of the river made a nice background for the camaraderie that developed between many of the participants. We passed under the 53rd Street bridge and found a sandbar where we landed for a rest stop. 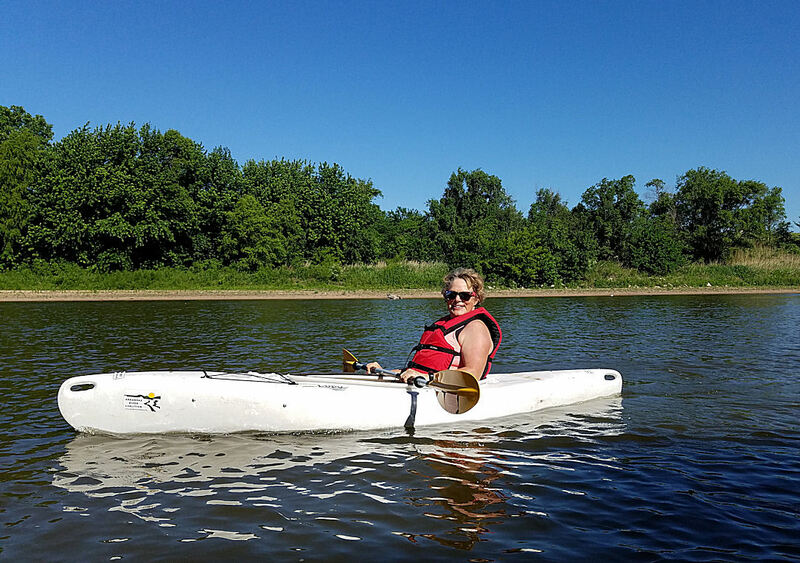 After refreshing ourselves with rest, drinking water and new conversations, we paddled onward past Mount Trashmore (one of the largest sources of methane gas in Kansas, besides cows that is!) and under the multiple bridges of K-96. 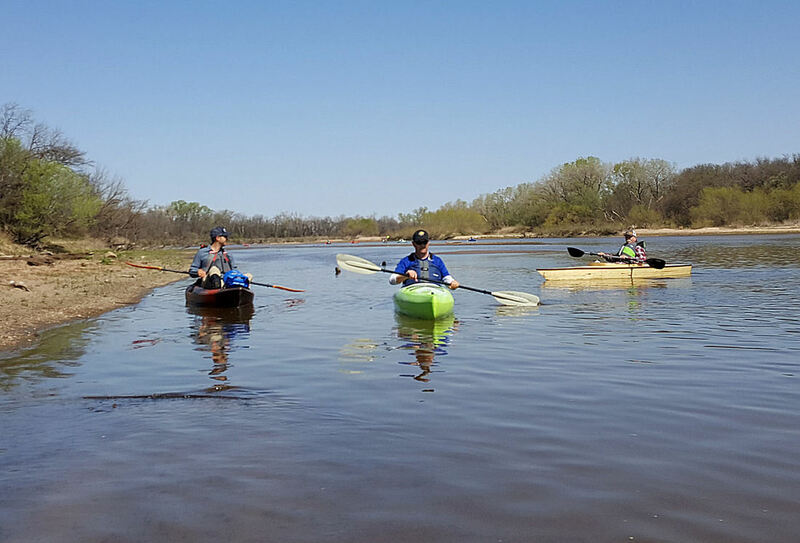 We approached the Arkansas River Park around 11:45 a.m. and managed to shorten the process/path of carrying boats. The reverse shuttle was run and goodbyes were offered and accepted by new friends and acquaintances. 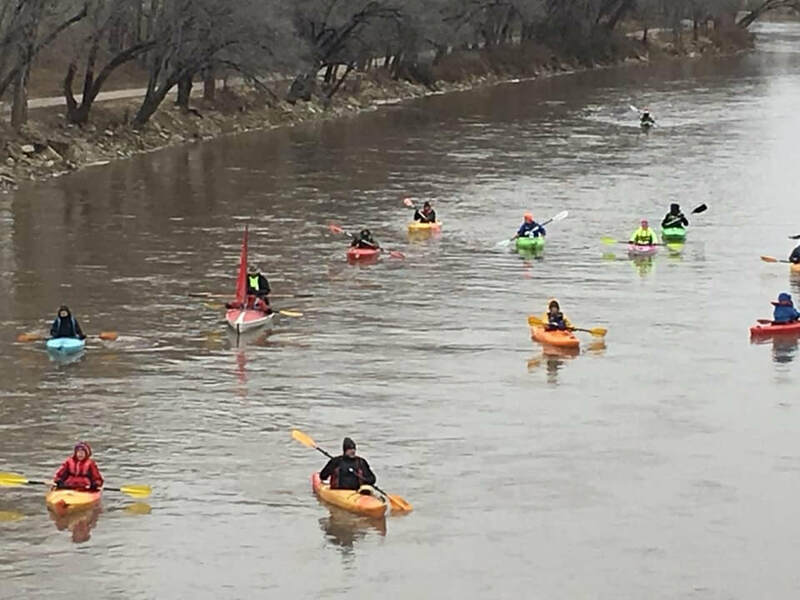 ​Around 32 paddlers launched kayaks from a sandbar above the red pedestrian bridge in Sim Park and had a warm and somewhat windy (but satisfactory) river float, landing near the Lincoln Street bridge and dam. 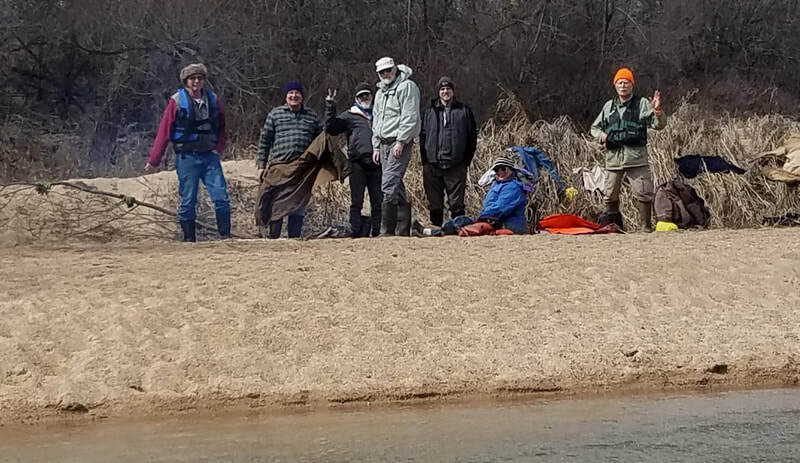 43 persons showed up on this nice, relatively cool day for an Arkansas River Coalition river float. There were 4 youth, several couples and many singles and retirees making up the flotilla. 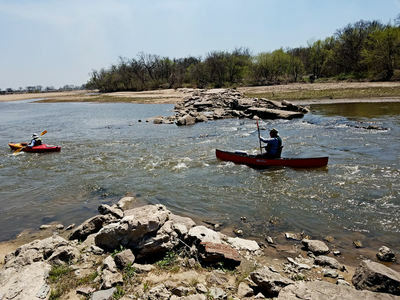 The river level was running a bit higher making the process of paddling and easing over submerged sandbars and obstacles much easier (722 cubic feet per second at John Mack Bridge river gauge, as compared to the usual 400 to 500 CFS flow rate during most summers). 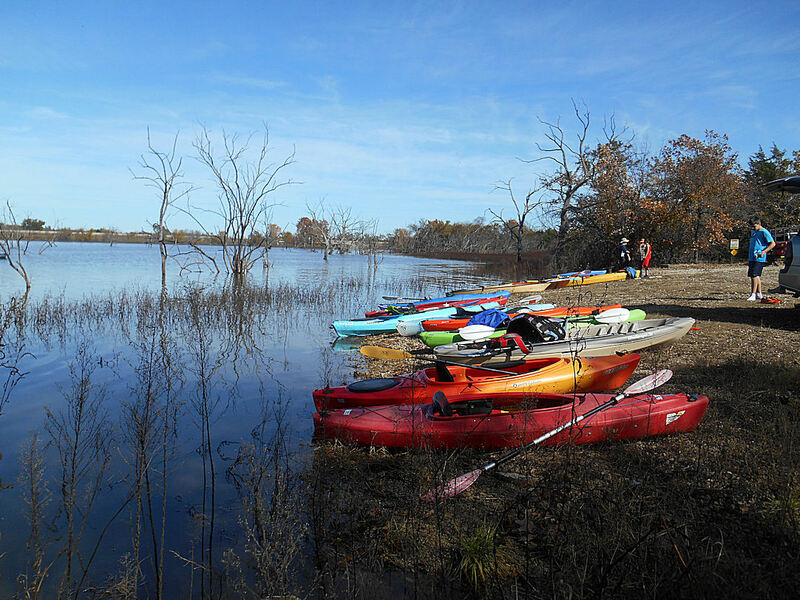 Many paddlers showed up with new kayaks indicating an increased interest in this water recreational activity. ARC provided 16 loaner kayaks to those who were trying the sport out for the first time and for a few returnees. There also were 3 canoes with a couple of those canoes carrying a youngster each. After running the shuttle of vehicles and around 9 a.m., we launched from a fairly steep embankment located just south of the Water Center in Herman Hill Park. After launching, it appeared that first-timers and returnees were having a good time and were able to paddle smoothly down the river. borrowed kayak, but was able to recover and continue on down the river. 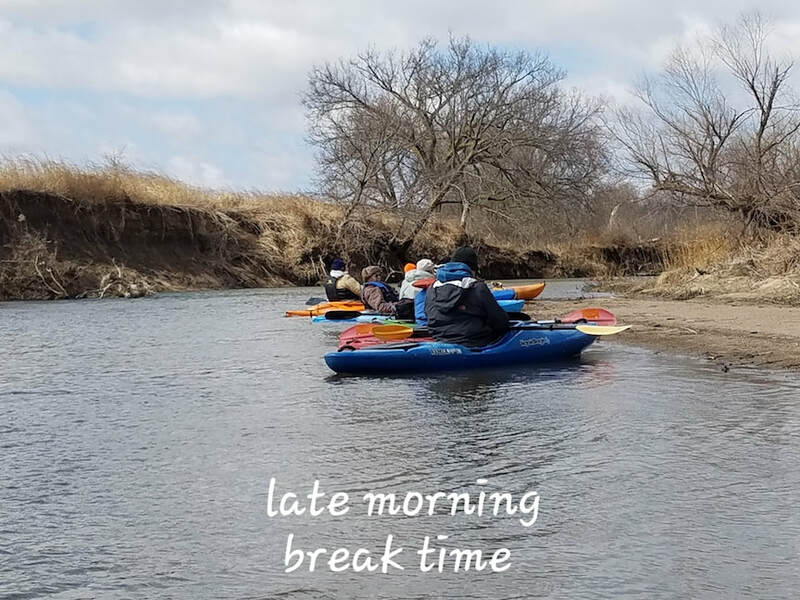 Around 10:30 a.m. we had paddled at least half way on the water course and we stopped on a sandbar for an extended rest period with some snacks and lunches being consumed. The rest of the journey went smoothly and all boats had landed at the 71st Street Canoe Launch around by 1 p.m. Another successful river float under good weather and water conditions! On Saturday, March 25, 2017, seventeen paddlers met at the edge of the Arkansas River next to the Yoder Road bridge.......Oh, and we can't forget the presence of ole' Lucky, the friendly black dog who is a veteran of many river floats in his canoe! The weather was cool and damp.....it had rained the evening before and that was a plus as it added some extra runoff water to the river channel. The water was running at 162 cubic feet per second (as reported by the USGS river gauge at the nearby Haven Road bridge). The launch of 14 kayaks and 2 canoes went well for all but one paddler. Unfortunately this paddler capsized his kayak within a few hundred feet of the launch site.......his clothing was soaked so several of us assisted him back to the nearby launch site where he was able to warm up and change into dry clothing in his vehicle...........and then....he decided to call it a day and head for home. Order was restored and most paddlers easily adjusted to a routine of paddling a few strokes to keep the heading of their boat aimed downstream, and then let the moderate current do the 'pushing' work for awhile. 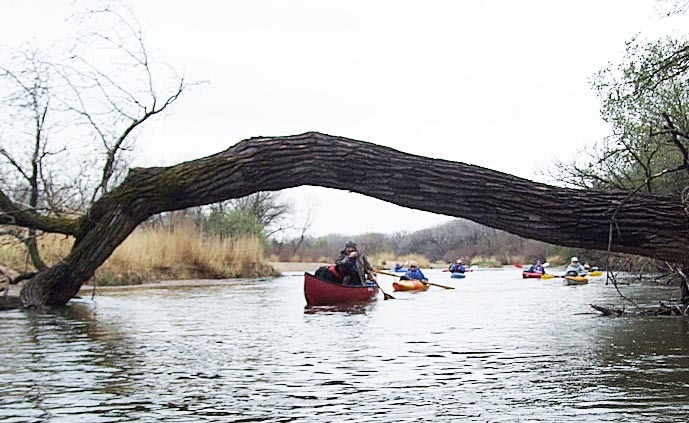 All the paddlers guided their boats under an interesting large, arched tree that bridged a narrow channel of the river. Introductions and conversations between new paddlers were made on the 'fly', so to speak, and the camaraderie developed as the river miles passed by. We paddled by the mouth of Cow Creek and a good water flow from that source helped lubricate the river channel. 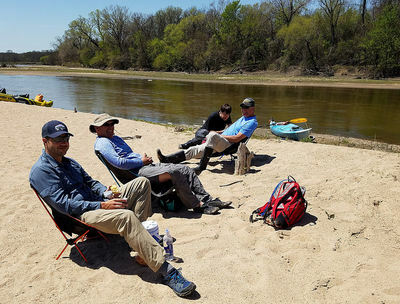 After about 4.5 miles of easy paddling, a suitable sandbar was selected for the noon lunch and rest site. A fire was quickly built and became the center of attraction for the paddlers to offset exposure to the cool, damp weather. After the rest and lunch stop, we were on our way again. We did have a brief stop at the Haven Road bridge to enable a paddler to end her river float (according to her pre-planning effort) and drive away in her vehicle that had been parked nearby. 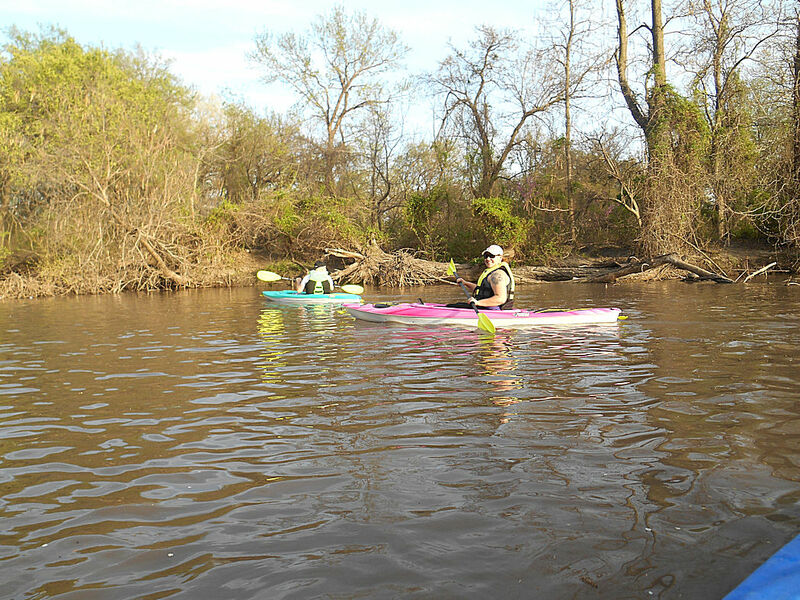 We continued on down the river with much visiting between paddlers. 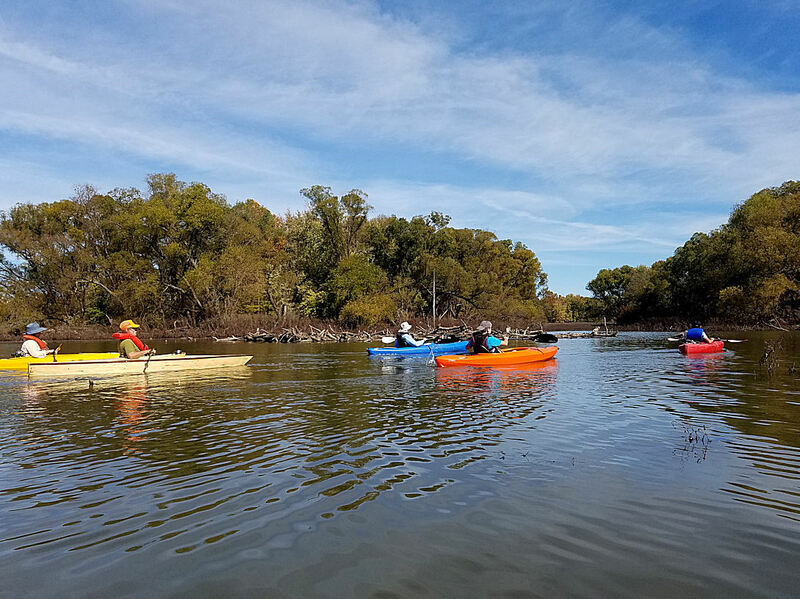 The participants were able to view the natural habitat of tall cottonwood trees and other foliage on the banks, plus to observe numerous signs of beaver activity. By 2:30 or so we arrived at our destination at the Worthington Road bridge. 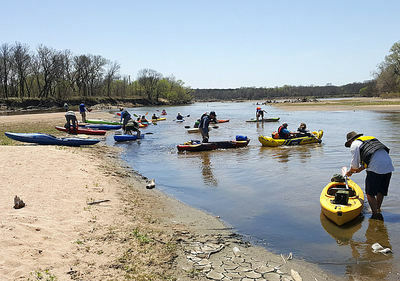 The day paddlers finished their river float, loaded kayaks and gear into their vehicles and made their exit. Seven paddlers, who planned to continue on their river float to a downriver campsite, first ran another vehicle shuttle to the Mt. Hope Road bridge. Due to recent rebuilding of that bridge over the Arkansas River, they found that easy access and parking had changed from previous times and was limited. They worked out a plan to park one shuttle vehicle at a nearby farm home and other vehicles in Mt. Hope. 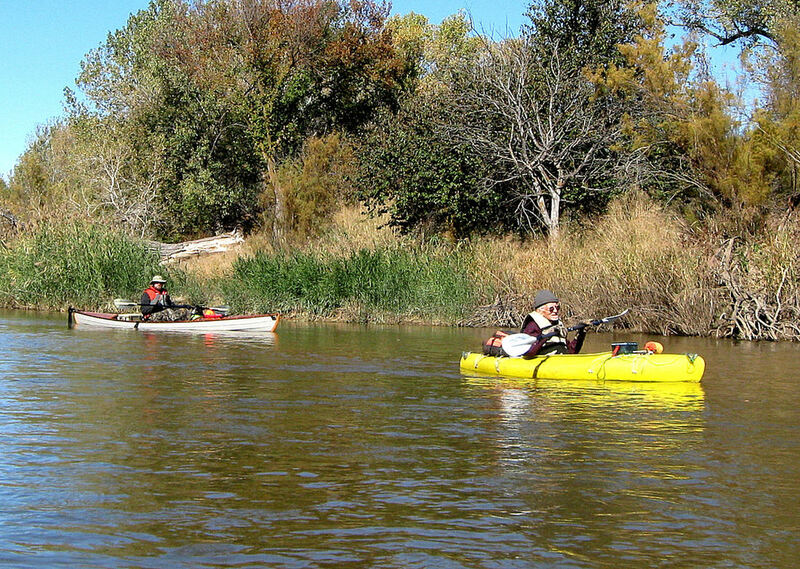 Back on the river, the 'overnight camping' paddlers made quick float time to a fairly nice island in the riverbed------it had a good landing site, some sandy beach, tall grass and small trees. The wood supply was plentiful. Tent sites were selected and the camp building activity began. A fire was quickly started and a few logs were established as the perimeter and the seating area for the fire pit. Hot meals and drinks were then prepared before the daylight faded. Next, as darkness set in, and by the glowing coals and flames, the stories and adventures were shared. A fairly early bedtime was observed. By early morning, the fire was re-kindled and the warming process began. After breakfast, tents and gear were packed back into the kayaks and the seven were off for a fairly short float to the landing point. The weather was slightly foggy and the mood was quiet and contemplative. A few turkeys were spotted flying down from a tall roosting tree along the river bank......then several vultures were spotted on a nearby sandbar picking over the carcass of some critter........the vultures flew into a nearby tree and they warily observed us floating by. We landed at the Mt. Hope Road bridge on a nice sloping river bank. We did have to haul our boats and gear a block-long distance to our vehicles that we had retrieved earlier from distant parking areas. Another successful Arkansas River Coalition river float! 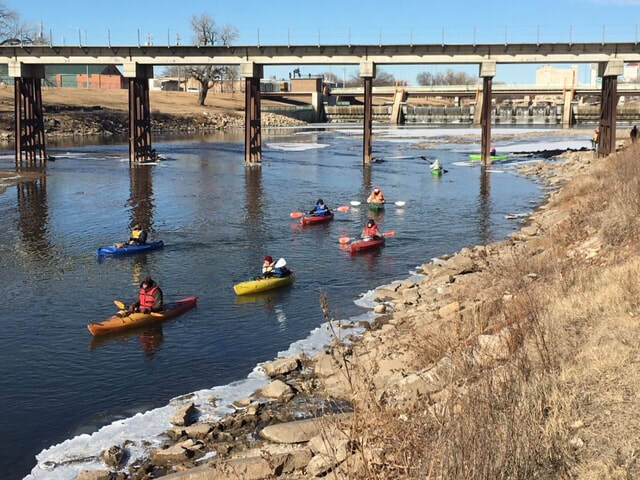 With a sunny but cold morning start, nine paddlers met at the South Alden Bridge over the Arkansas River to begin their river journey. Ann, Armin, Bob, Cory, Mark, Michael, Randy, Vince and Wally were the featured paddlers on a float journey that turned out to be an excellent outing----weather and water-wise! Alden South Bridge has a nice roomy, well-maintained parking area and an easy sloping access route next to the county road bridge to the nearby river. On the 25th, the river looked deceptively 'small' at that narrow channel access point. 94 cubic feet per second water flow was showing at the Nickerson gage when we launched our boats. Even with the initial appearance of a 'small' river channel, the water was clear and flowing with a good current and resulted in a very enjoyable float. A brief word about cold/cool weather safety: Hypothermia can occur if for some reason a paddler becomes wet from immersion in the cold river water. Wally, Vince and others, each bring a change of clothing, protective warming blankets and wrap-around warming 'bivies' to immediately protect and re-clothe a wet paddler. Also, Wally and Vince bring a throw bag (rope & canvas bag), fire kindling and fire starter fluid, plus first aid kits, all for safety and warming purposes in case of a paddler getting wet due to their boat capsizing, or if they are involved in a minor accident. Back to the river-----We ran a fairly fast vehicle shuttle and were on the water around 9:30 a.m. As mentioned above the current was running reasonably fast so we could paddle a few strokes to maintain our heading and then let the current carry us along. There were some quick turns and we did have to avoid a few shallow sandbars, but our progress was rapid. We had to make a portage around a fallen tree at one point, but Randy demonstrated how to 'slide over a partially submerged log'. We also ducked under a fallen tree that was above the water level about 30-36 inches or so. Bob was the leader most of the float route in the morning and he reported seeing deer, turkeys and a beaver from his leading vantage point. By noon we had stopped on a sandbar for lunch. A small campfire was built mostly for 'looks'. Coats and extra clothing was removed as the warm sun increased the temperature to the 40s. After lunch and a brief rest we paddled on down the river without problems.....most of the paddlers ran the short 'rapids' under the K-14/96 river bridge south of Sterling where the day paddlers left the river and headed home. 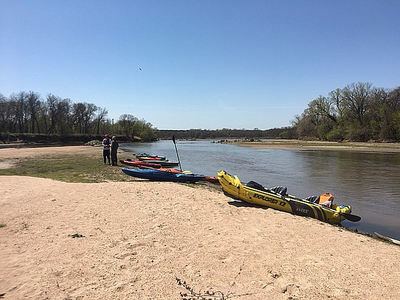 After running the second phase of the vehicle shuttle and loading camping gear in our boats, five paddlers continued on down the river in search of a suitable camping site. ​We paddled about 2 miles further from the K-14/96 river bridge to our new campground. All of the paddlers spotted the group of five deer on a sandbar on this leg of our journey. At our sandbar campground, we gathered firewood and assembled some larger logs around the fire pit for our seats. Tents were quickly erected......Randy, the 'hardy' camper, pitched a single fly as shelter for his sleeping area. 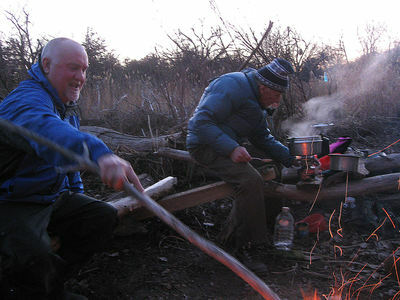 By sunset a good warming fire had been started and the campers gathered around to light their small stoves and to cook stews, soups and other warming foods and drink. We continued the fire watch into the evening accompanied with the appropriate stories and descriptions of past camping experiences. Most of the campers were in their sleeping bags by 9 p.m. The evening cooled down to a nighttime temperature of around 25-26 degrees. The usual calls from owls and coyotes were heard as we dozed off. 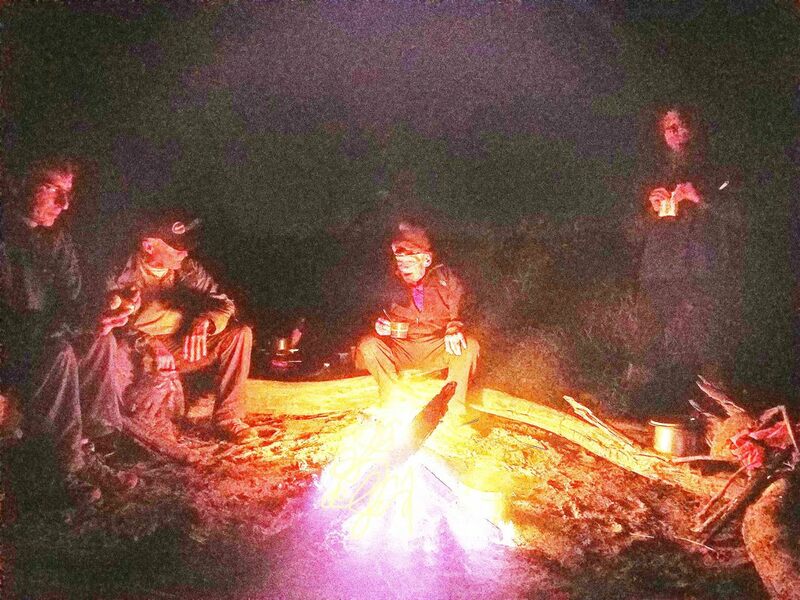 By 6:30 a.m., most campers were up and gathered next to the warming fire built by Vince. While drinking warm liquids and eating breakfasts, we could hear a flock of turkeys roosting in a big tree down river, starting their morning 'gobbling' noises. Packing our camp gear back into our boats, we got a good start around 8:30 a.m. The water in the mostly narrow channels was running nice and clear. 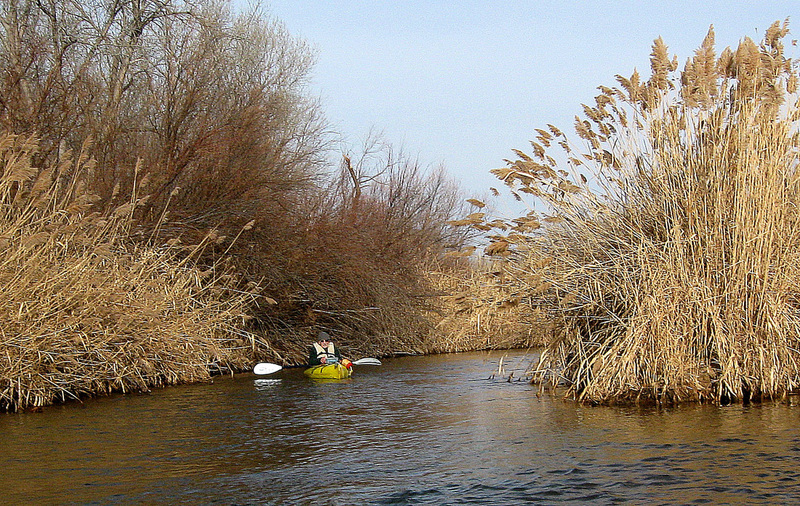 The sandbars along this section of the river were covered with a lot of tall common reeds. 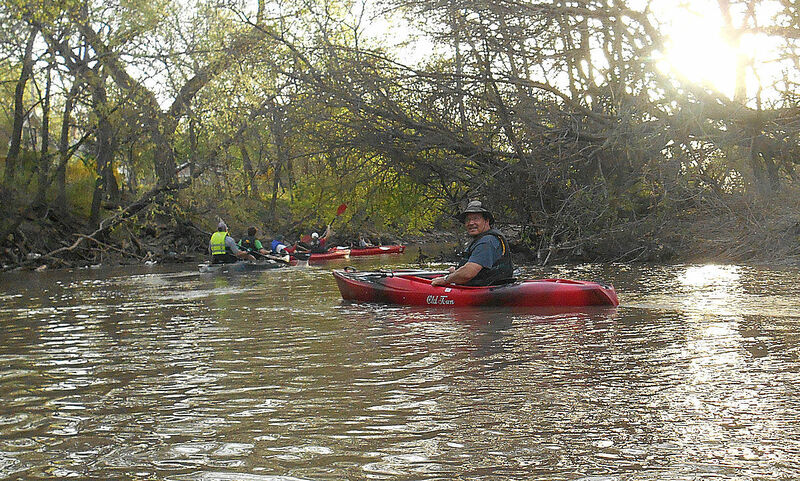 Wally took the lead at one point and paddled ahead, spotting as many as four small herds of deer by the river. 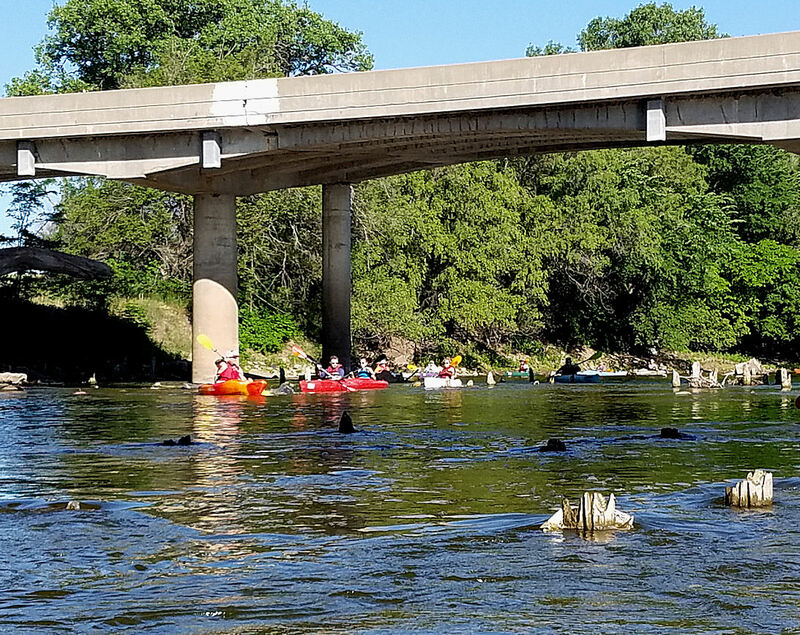 We all landed safely under the K-14/96 river bridge just west of Nickerson and were loaded up and heading home by about 10:30 a.m.
What a great day and what a turnout of paddlers! Over 60 folks, young and old, families and singles....and even a dog.....took part in this enjoyable river float. 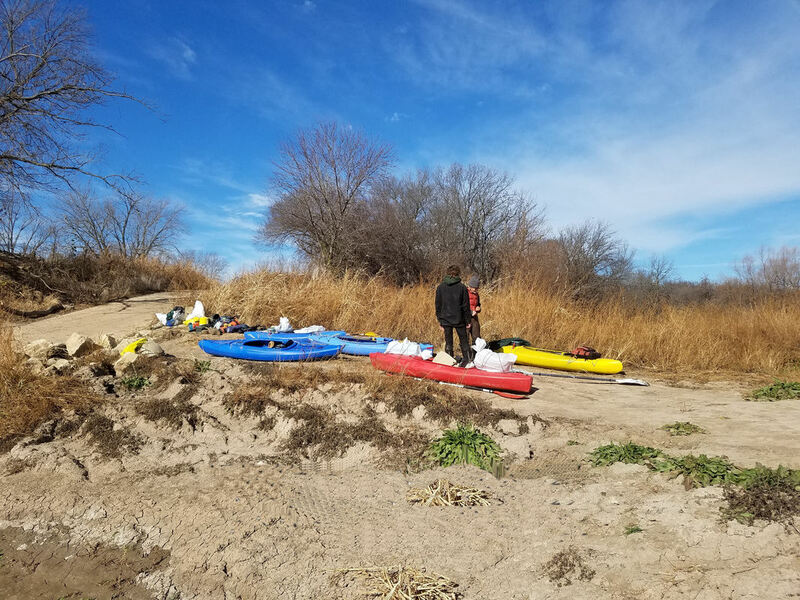 There was quite a variety and array of colors of kayaks and canoes lining the bank at the 12th and Bitting area launch site on the early afternoon of January 1st, 2017. 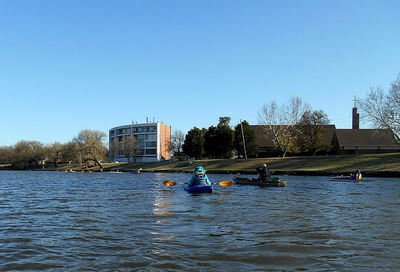 A fairly warm and sunny day minus any nippy winds brought out a lot of enthusiastic kayakers and canoeists. There was even a kayak that pulled a floating decorated duck decoy......the paddler of that kayak was outfitted in a red wig and funny hat. 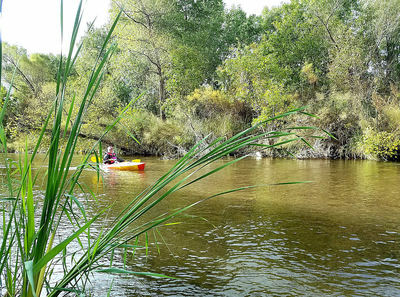 A 'floating tropical island' with a small palm tree and paddled by an 'islander' also provided a rare spectacle on the Little Arkansas River water. Then there were some boats with colorful wind propellers or small flags, a paddler in a tutu and another wearing a clown's headgear.....and just a lot of cheerful folks to add to the festive occasion. There were so many paddlers at the launch site that, by the time the last boat was put in the water, the first boat in the water was probably nearing the landing site at the South Riverside Park.....and the passing cars and walkers at the adjacent roadways and parks were treated to quite a sight of over 60 watercraft paddling down the river. 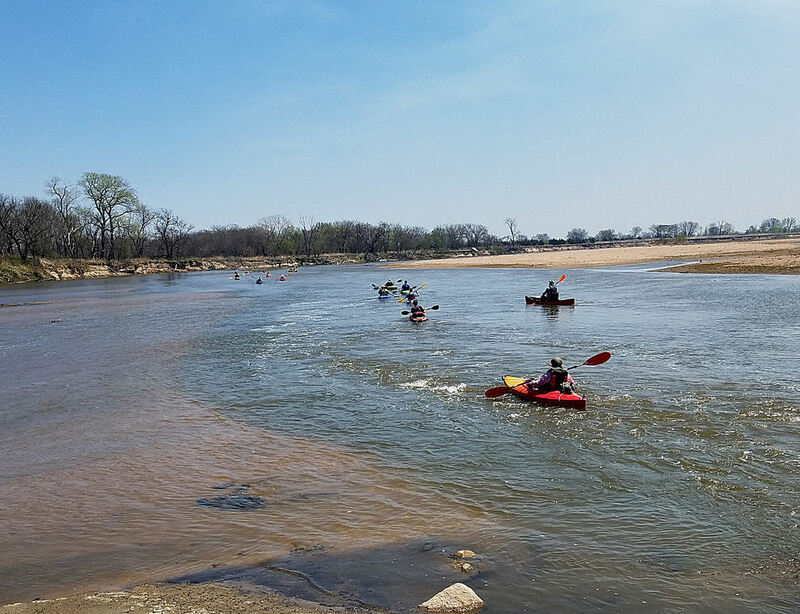 The 2017 Arkansas River float season was kicked off with a rousing turnout of enthusiastic recreational paddlers! Six paddlers showed up for this wintery river float. April, Donna, Kevin, Kyle, Monica and Vince were dressed for the predicted cold and windy day. 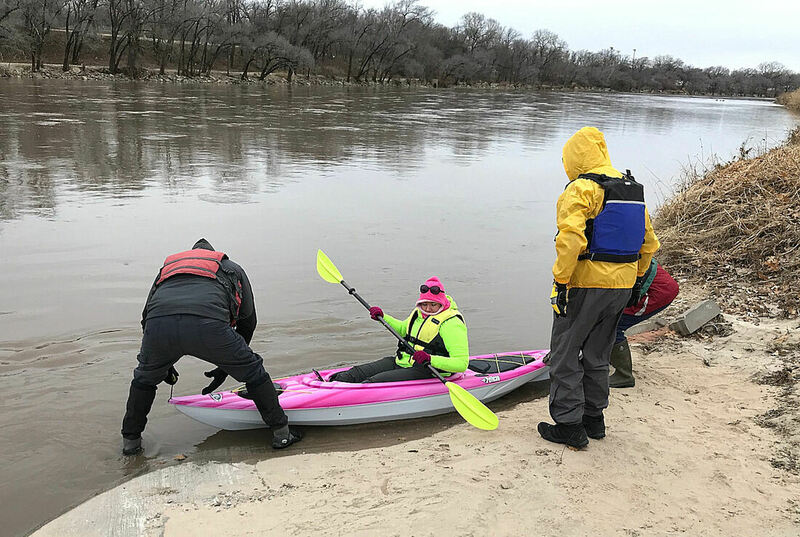 Although the Saturday morning temperature was hovering around 32 degrees, a weather forecast of strong south winds prompted the paddlers to choose a shorter river route. 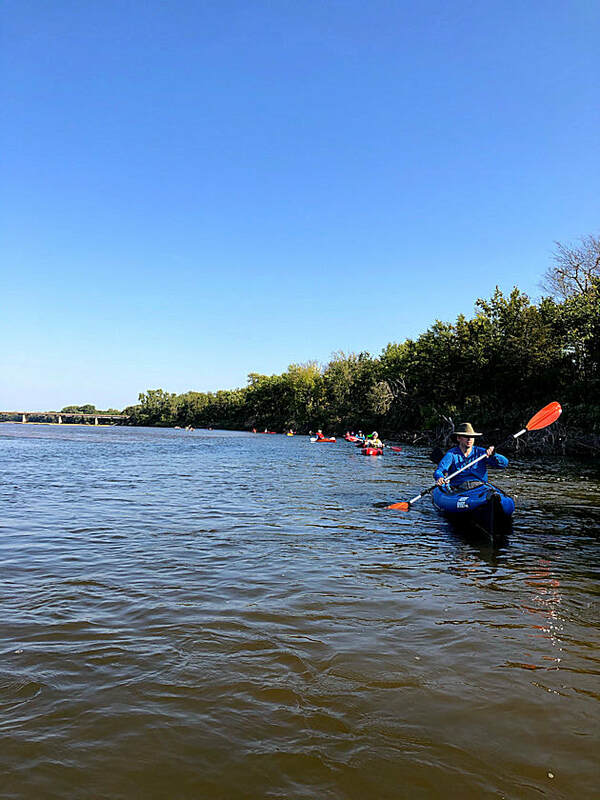 Rather than starting at the 71st Street canoe launch, we opted to go further down the river to the Mulvane river bridge. 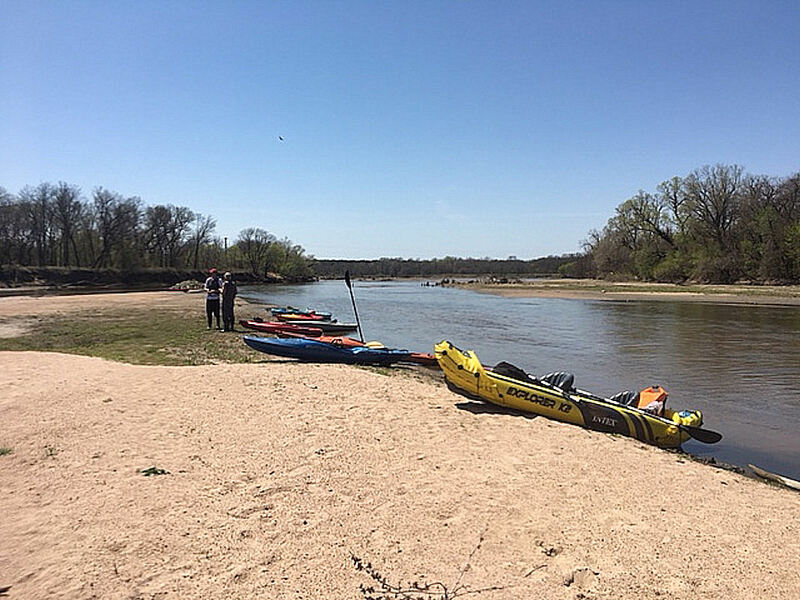 After a short shuttle to the landing site at the Old Goat Ranch, located south of Mulvane, (and assisted by a driver who was not paddling with us) we headed back to the east end of the river bridge located just near Mulvane. 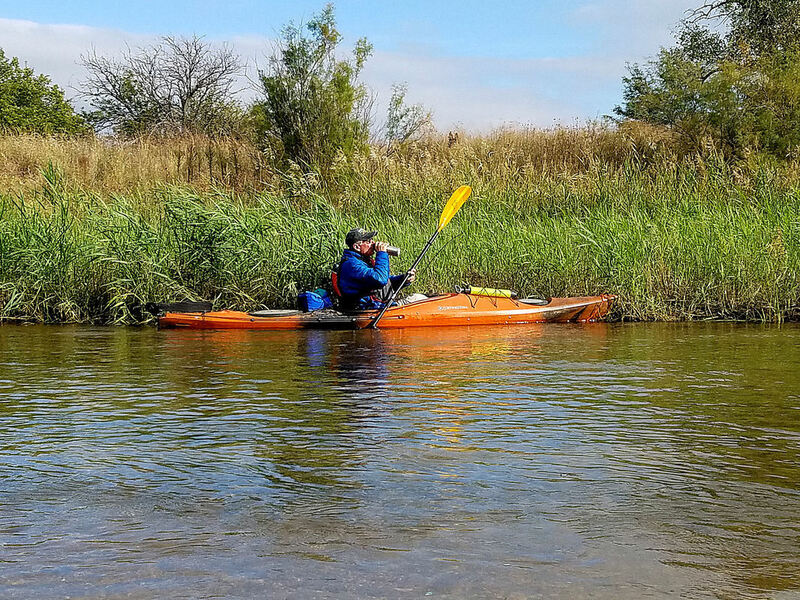 Following the fishermen's path down a somewhat rocky and steep embankment and across a fairly wide sandbar, we found ideal water for launching our kayaks. 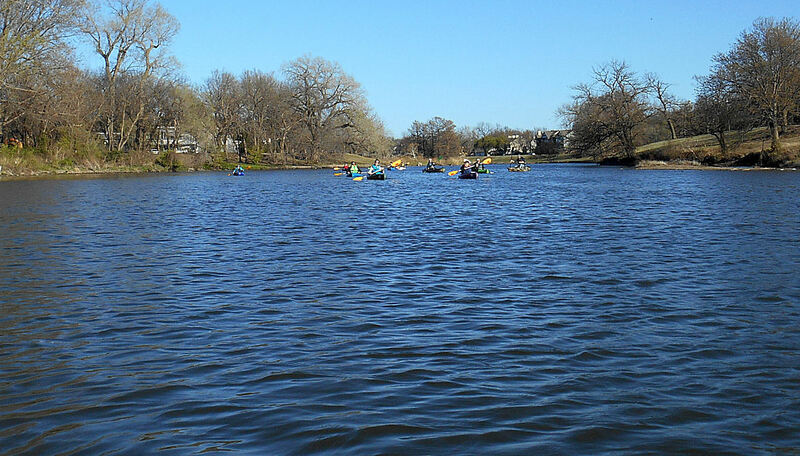 Our launch of the six kayaks was quick and we were on the water paddling briskly but without any serious headwinds. We observed a few hunters along our float route. 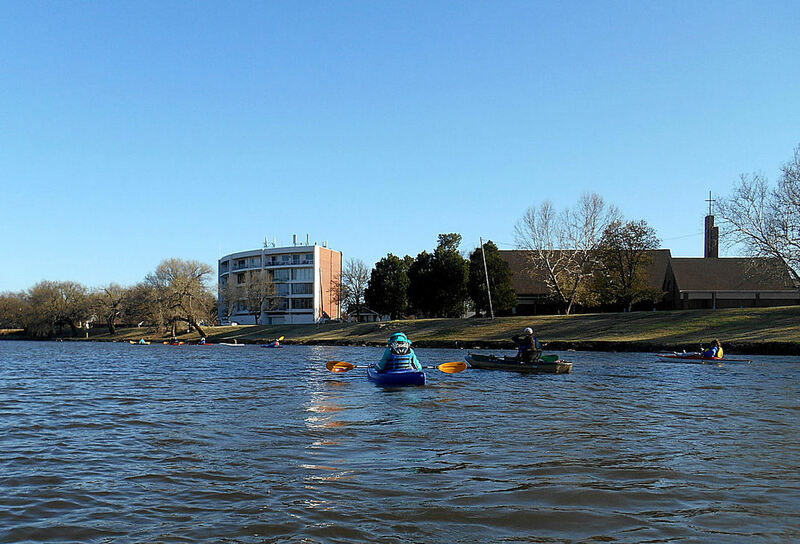 The float was easy paddling and enjoyable and the warmly dressed paddlers had no complaints of the weather and water conditions. 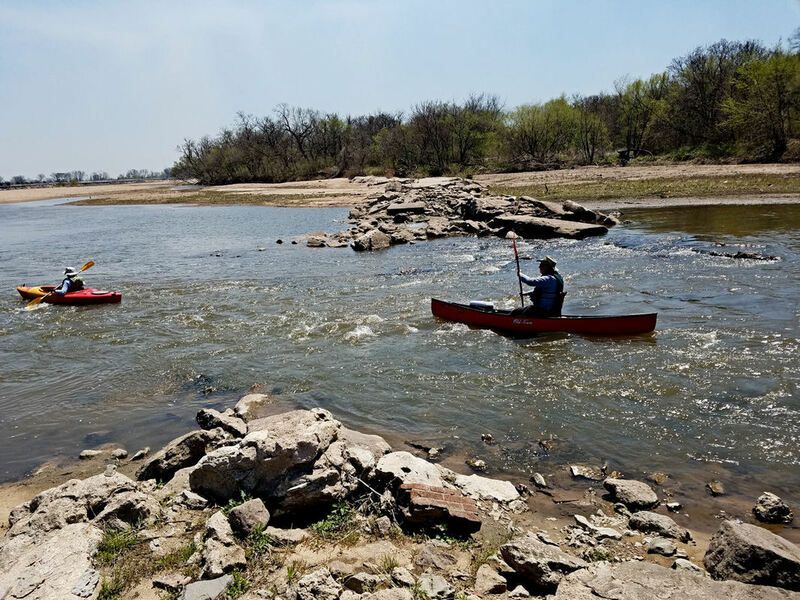 We faced a growing but not difficult headwind as we lined up paddling the last southly mile and a half river approach to the Old Goat Ranch. 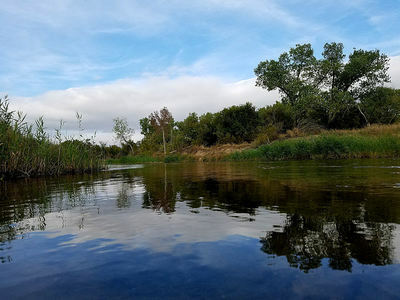 One paddler found a 10-point buck deer that had apparently been shot, but the critter made it as far as the river's edge where it met its demise.It apparently had fallen into the water and was eventually hung up on a snag. As we neared the Old Goat Ranch we paddled around the long easterly curving river until we reached a nice sandbar about 5 miles from our origination point. 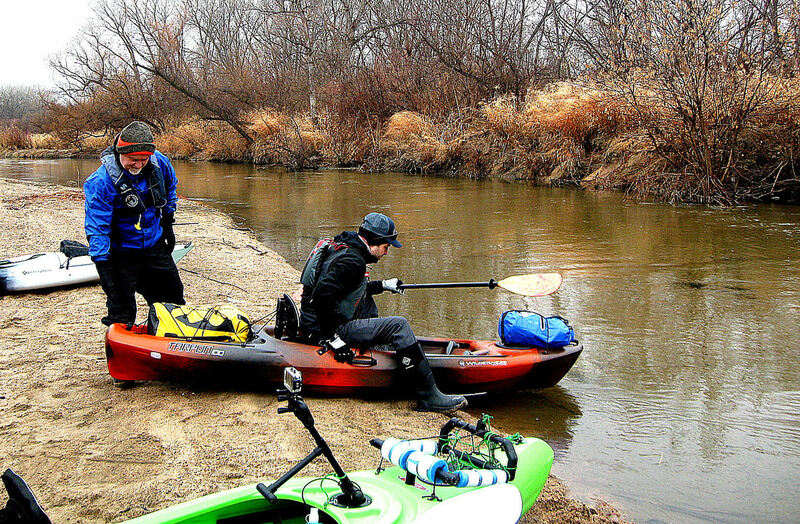 We did have to assist each other in carrying our kayaks about 2 blocks from the river's edge to our parked vehicles. 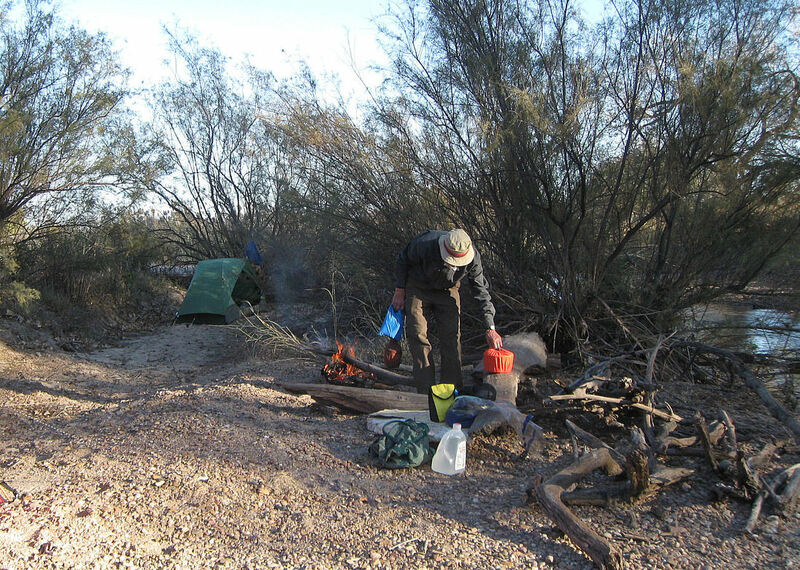 After loading kayaks onto the vehicles, we drove a scenic, winding pathway to another site on the Old Goat Ranch where Bill, the owner, had prepared a warming fire for us. We all relaxed and ate our lunches while visiting for awhile. 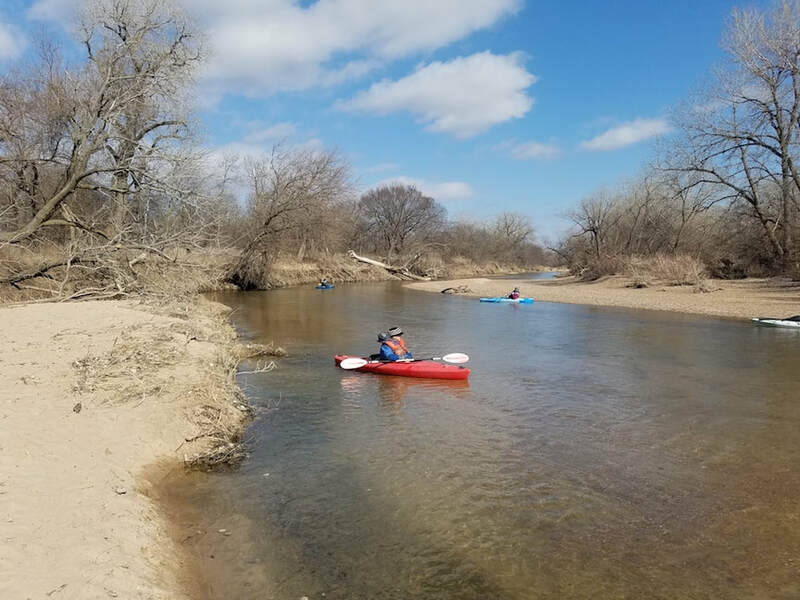 The three day-paddlers then headed for home while the other three, with Bill's guidance, went on a hike through the scenic wooded sand hills. We also drove back to a point near our kayak landing site where we observed two buck deer in close proximity within the underbrush. Later, back at the camp site we pitched our tents and prepared for a night of camping. The evening was cold due to a fairly strong wind, but the campfire kept us warm and served as a social center for sharing important stories and observations. In the morning, Vince built up a good warming fire, even though the temperature was actually mild. 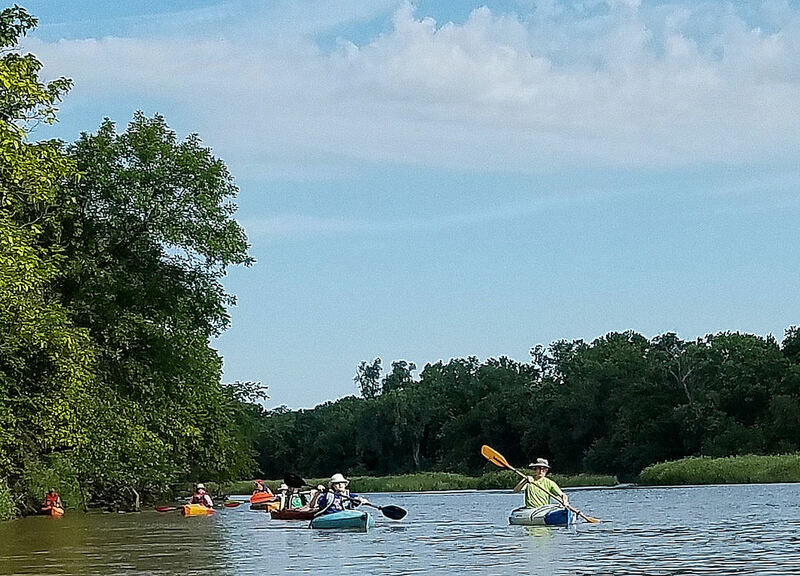 Following our breakfast, we packed our camping gear and ran a shuttle to the Burley Bend river access site east of Belle Plaine on K-55. 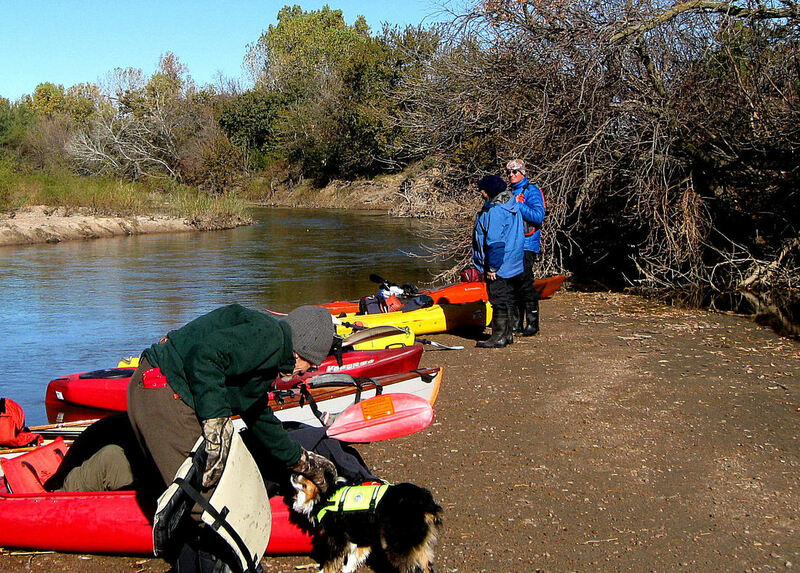 Then back at the Old Goat Ranch we quickly launched our four kayaks (as Bill had joined us), and paddled the rather remote and tree-lined river route to the south. We traversed the 'rock gardens' segment of the river (a rocky bottom area about 3-4 blocks long) without any major groundings or difficulties. 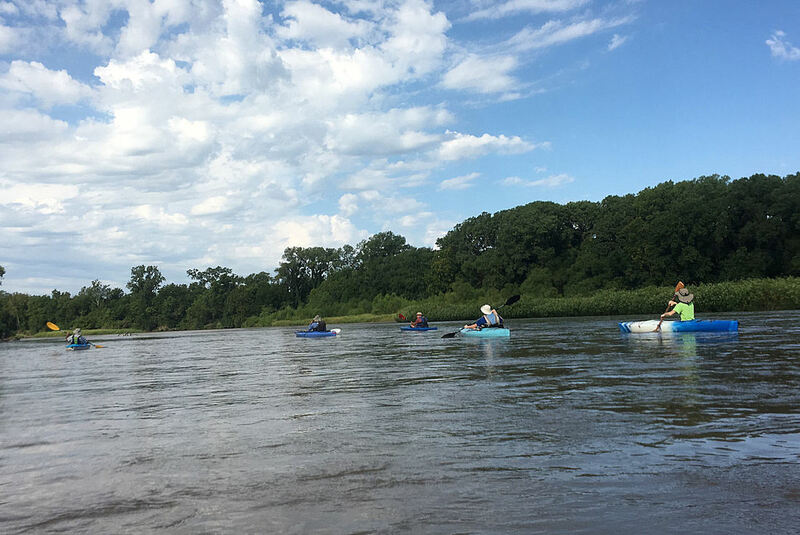 We finished the 5-mile float in good condition and made our landing just south of the river bridge, loaded our kayaks, and called it a successful river float. The float on the second Saturday in October was the first weekend float of the ARC fall/winter/spring season. 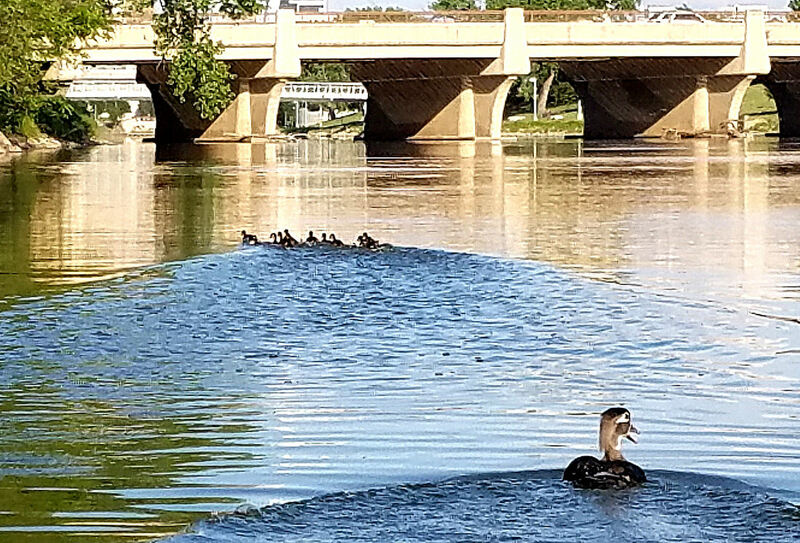 Friends, both old and new, were arriving well before the appointed time (friends don’t keep friends waiting, to borrow a phrase from Mike Berry) at the K-96 Highway Bridge south of Sterling. The gathering vehicles bore license tags from several counties . . . new friend Gwen Ellison joined us from Cherryvale (MG) in SE Kansas about three hours away. After unloading equipment and boats, a canoe and 15 kayaks, vehicles were shuttled to the take out at the river bridge south of Nickerson. 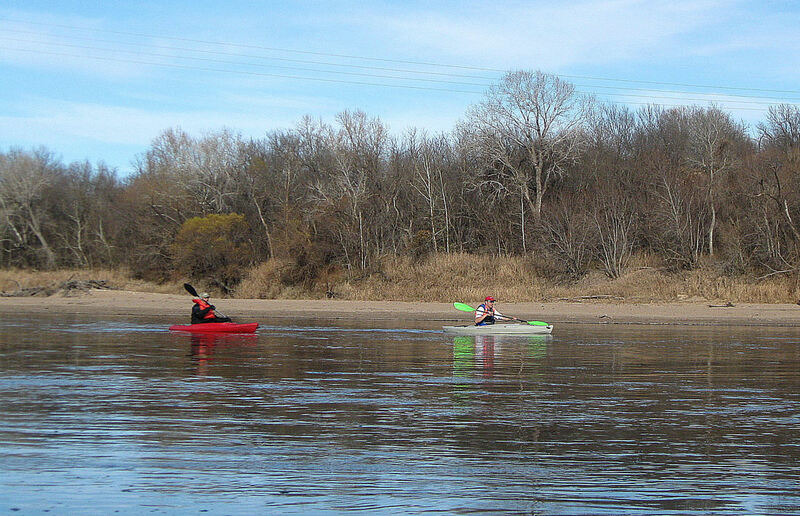 Weather and water conditions were perfect for the nine-mile paddle to Nickerson. Jackets, warranted at launch time, would soon to be shed as the day warmed. The first challenge was the decision whether to launch above the ‘rapids’ at the bridge or to avoid all hazzard by launching down stream of the turbulence. Most of the group accepted the challenge and enjoyed the thrill of maneuvering through the fast-moving water, riffles and small waves. All successfully began the trip without mishap. The river below Sterling was a delight to paddle. Lush trees and vegetation, with just a hint of fall colors lined the banks. In this section the river is narrower and has some sharp turns, strainers and occasional tangle of snagged driftwood obstructing part of the water course. A couple of obstructions, large trees fallen across the river, required a landing and short portage around or a ‘limbo stick’ maneuver to go under. Sweepers, tree branches hanging down over the water, are common. At least one unwary paddler drifted into a sweeper and was swept clean out of his boat for a cool swim. Due to recent rains, the river was up slightly and flowing with a current estimated to be about 3 miles per hour. By lunch time we were five or 6 miles into our trip and looking for a sandbar for the lunch break. After a leisurely lunch and time of rest and relaxation all were refreshed and eager to return to the river. With the push of the river and a few paddle strokes we arrived at the takeout rather early, soon after two o’clock. As the ‘Saturday only’ folks departed for home, a co-ed group of seven ‘overnighters’ continued on down river. After a few miles of drifting and paddling the search for a suitable campsite began. Because profuse growth of invasive reeds (Pragmites australis) along the water edge often obscures the sandbars beyond, finding the perfect camping spot required a sharp lookout. A suitable spot was finally found. In the absence of large piles of driftwood, as on the Lower Ark below Wichita, all hands set to work gathering downed wood in the adjoining wood area, soon making a woodpile large enough to supply the evening campfire, the warming fire in the morning and leave a courtesy pile. 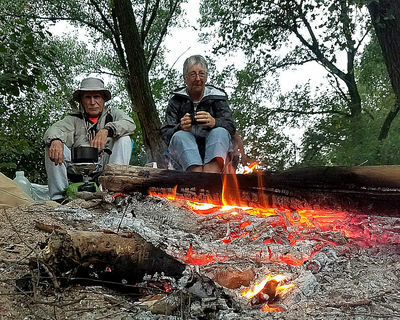 After the chores of setting up camp and supper, the campfire was lit for an evening of conversation and story telling or just contemplation around the fire. 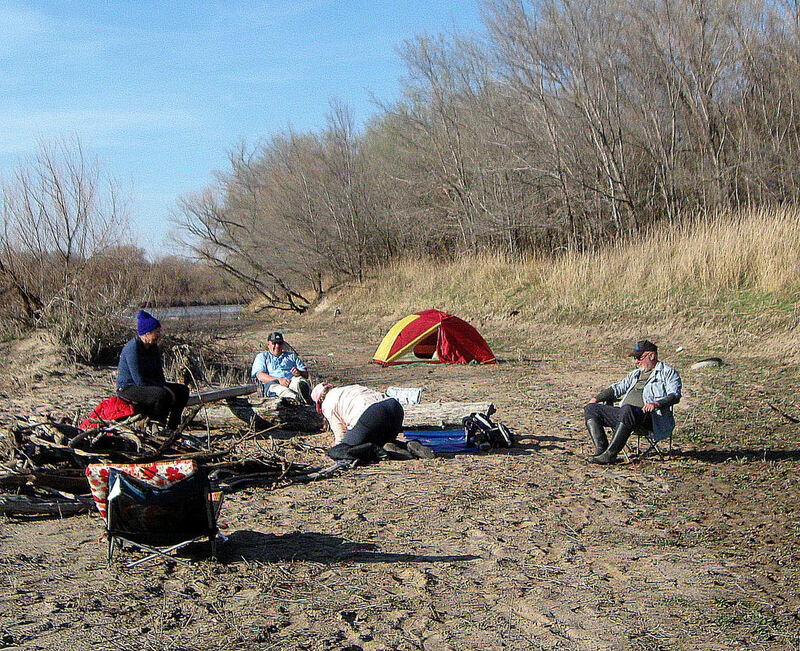 Arriving late Sunday morning at the take out under the 4th Street Bridge west of Hutchinson, we were greeted by three locals who had camped the night near the bridge. They were intrigued by our enthusiasm for canoe/kayak camping on the river and the possibility of participating in a future ARC float. 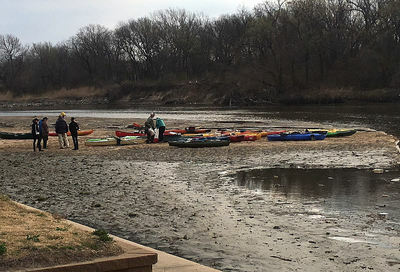 Following the morning river bank cleanup performed by a large crew of volunteers, 17 persons had gathered by noon at the recently completed Cowtown boat launch ramp. 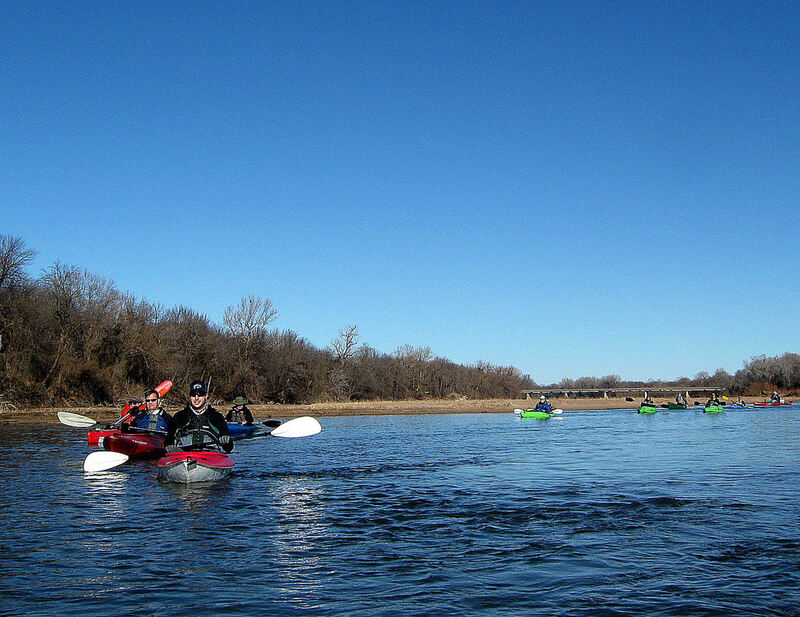 The weather was sunny and warm with the river float conditions as close to perfect as one would want them. 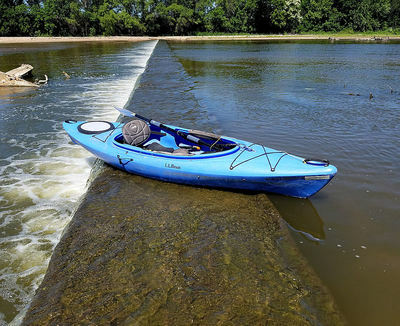 The launching of the kayaks was made without problems from the new, sloping ramp. By the time we reached the Seneca Street bridge the slow river current became almost negligible. On the river bank, many other folks were walking, sitting, biking, and skateboarding and observing our slow procession. 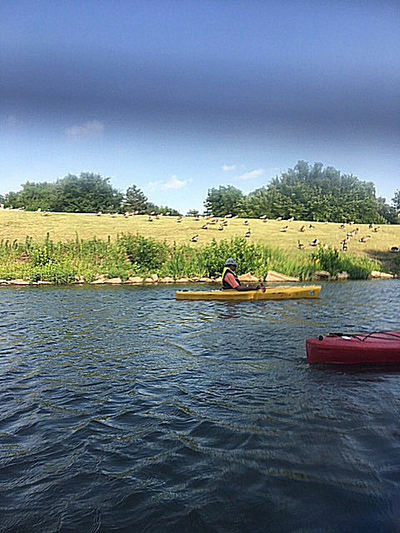 Some of those folks took advantage of the colorful parade of kayaks past the Keeper of the Plains and the Exploration Place by wielding their cell phone cameras and taking many pictures of us floating casually by. We faced a nice breeze as we rounded the river bend and drifted under the 2nd Street bridge. 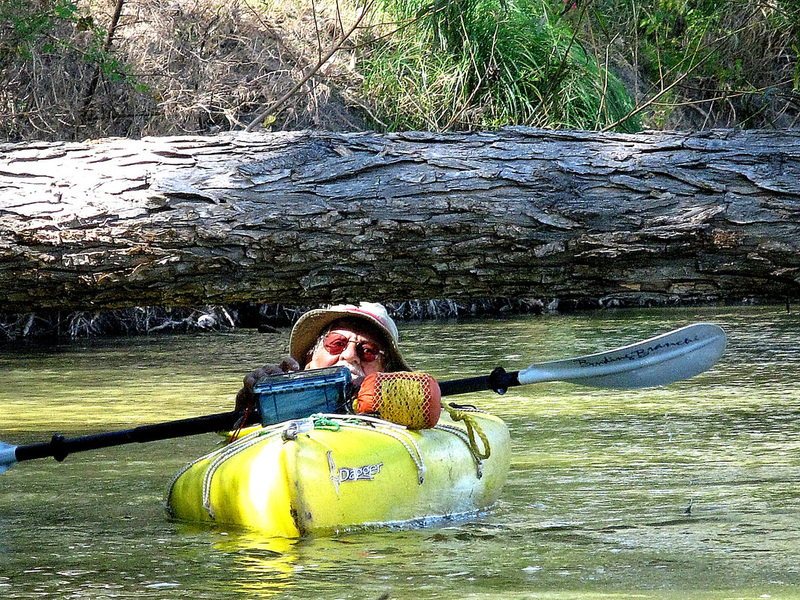 Each paddler kept their own pace with some just lying back and dipping the paddle occasionally. 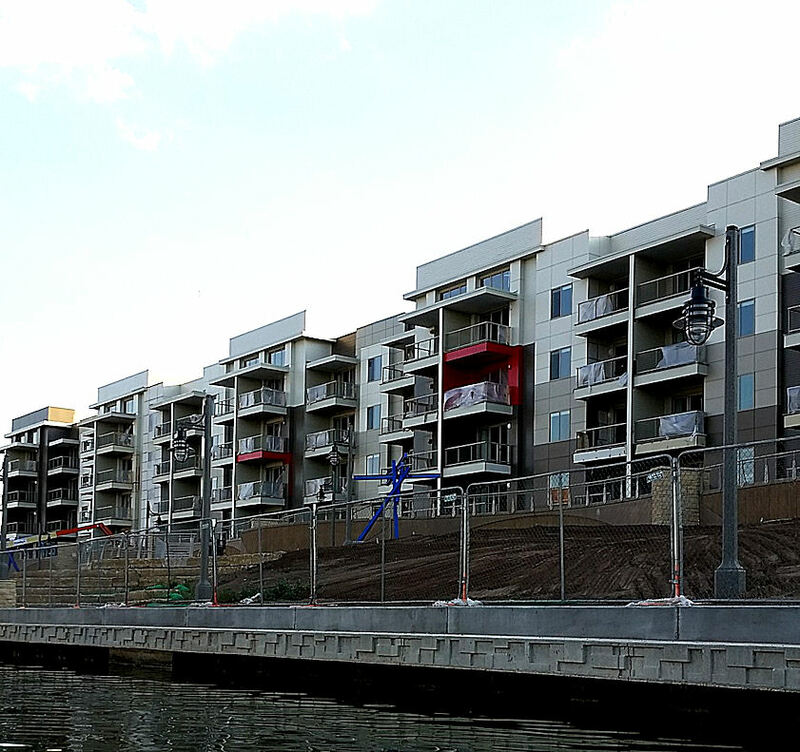 Our landing place soon loomed on the east bank above the Lincoln Street dam. We each unhurriedly pulled up on the sloping ramp and more than a few wished that the float had not ended. 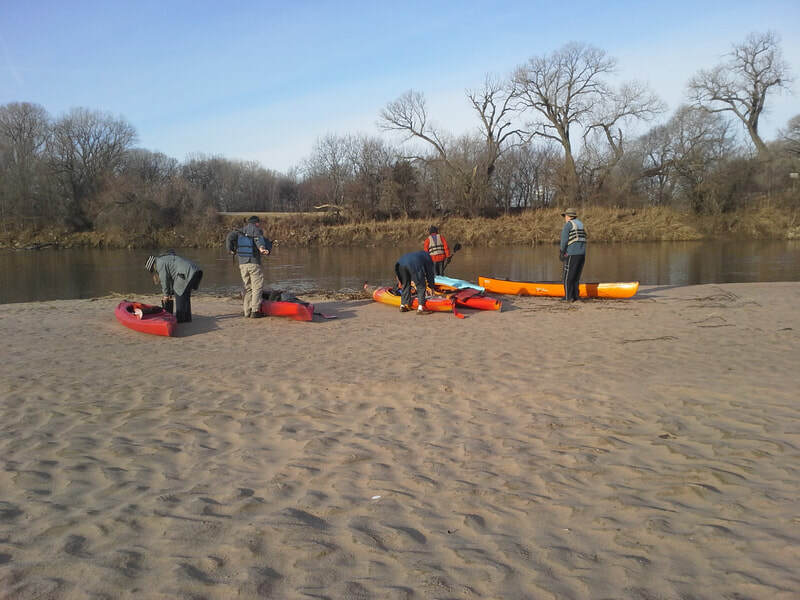 Kayaks were removed from the water, loaded onto cars and trucks......and we were off until the next river float! This float took place on a beautiful late afternoon and evening. We launched our boats on the Big Arkansas River at Garvey Park and landed just above the 47th Street South river bridge. 25 persons participated in this river float with 20 boats launched including 3 tandems and 1 single kayak holding a parent and child. There was good water for paddling, a bit higher than normal and flowing a bit faster that usual. 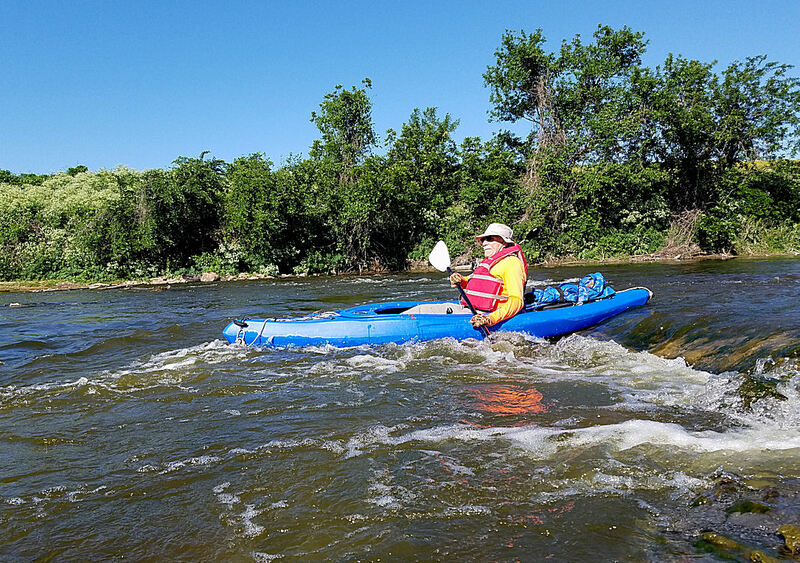 We maneuvered through several rocky areas with fast flowing water creating ripples and small waves.After negotiating one rocky, fast water area, one paddler was heard to comment, "That was kind of scary!" 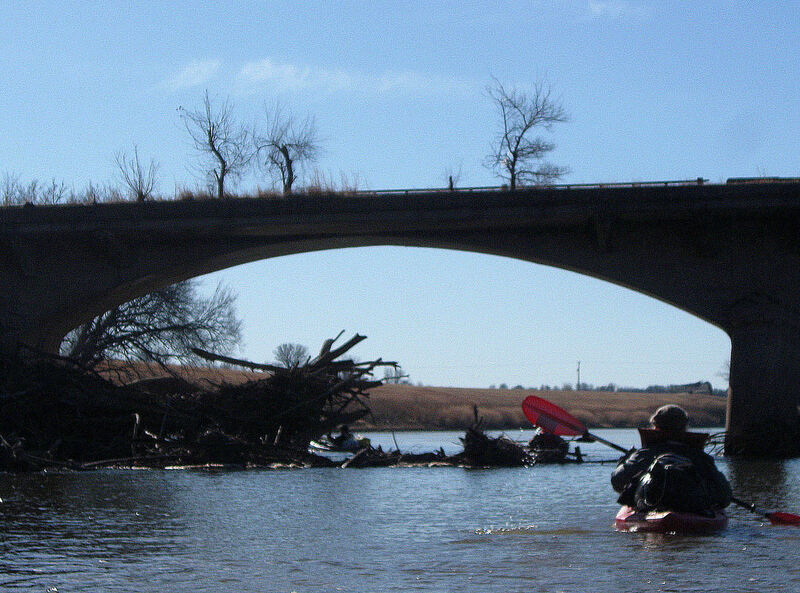 We paddled beneath 4 bridges including the north bridge of the Kansas Turnpike. This bridge was under renovation and had some piles of rock in the water beneath it. The landing site had a muddy bank due to recent high water so it had been covered with wood chips. Also a small, temporary landing platform had been built. The boat landings went reasonably smooth as the paddlers and their boats were not bunched up, but separated by at least a 30 to 40 minute spacing from first boat to last. A couple of paddlers in a tandem kayak overshot the landing due to misjudging the fast current near the bridge. They were retrieved by being towed by rope line back up to a landing site under the bridge. The Ark River Coalition is concerned about the safety of all of its participating paddlers. 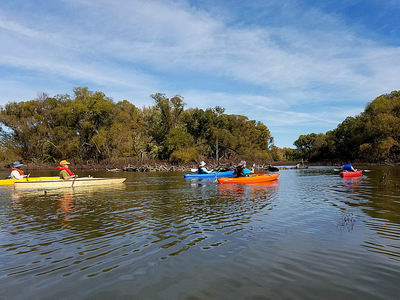 On this Sept. 29th river float, a small number of participants did not read or follow the notice that the float was not for beginning paddlers. Three ARC experienced paddlers had to assist and retrieve some apparent beginners from rough water in rocky areas and from grounding situations on underwater obstructions. Future paddlers should observe the notices as to the appropriate skills required for a particular float. Due to dusk coming earlier, this was the last Twilight Float of the year. 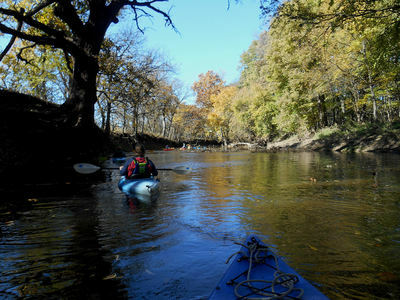 The Ark River Coalition will have one more local river float. 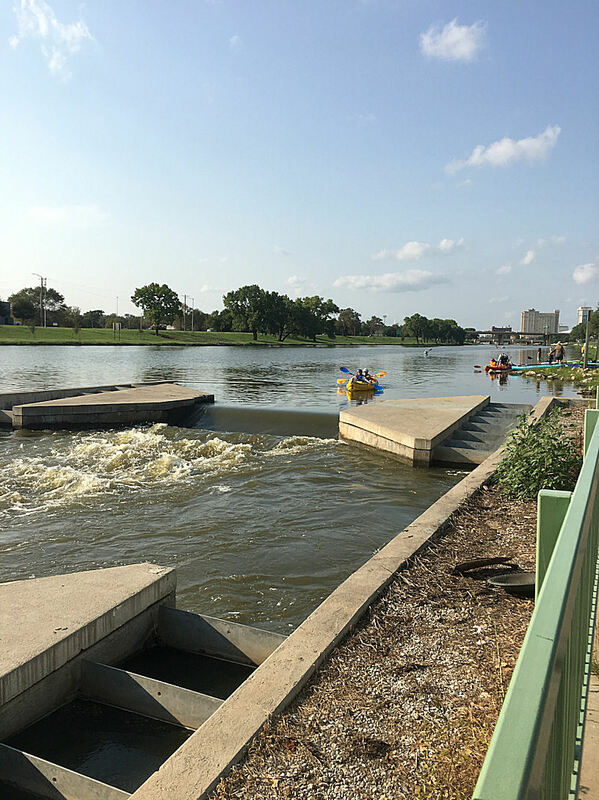 Tentatively, we will launch boats at 10:00 a.m. from the newly completed boat ramp at Cowtown, have a leisurely float on the Big Arkansas River through the scenic downtown Wichita area, and then land at the Lincoln Street ramp. More information will follow later regarding this planned local river float. 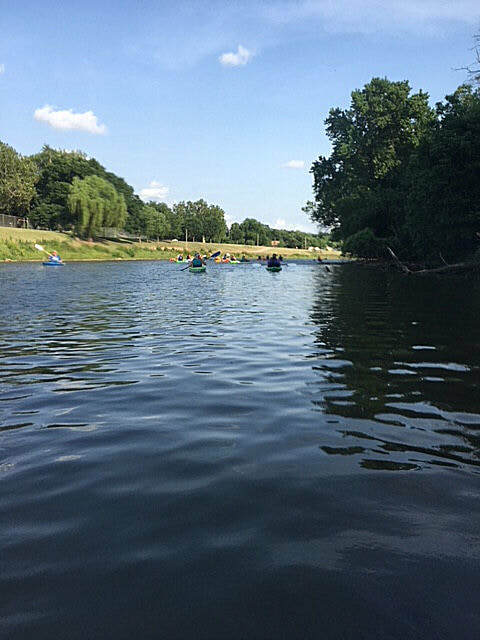 30 participants floated the Little Arkansas River on this early evening. Our launch site was near 31st and Porter Streets. 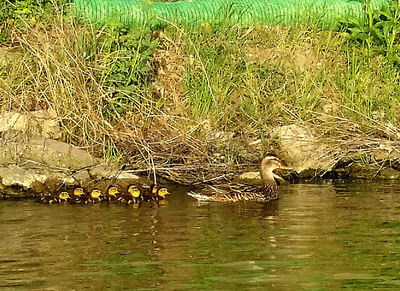 We had 4 youngsters paddling and/or just riding with their parents on the river. The boats were primarily kayaks of various makes, models and colors with the exception of a short canoe and an inflatable 2-person kayak. The late afternoon weather started out with a threat of rain due to heavy clouds and lightning in the area, but the sky soon cleared up for the duration of our float. We ran our shuttle and then launched two groups of the boats. This strategy was used because of the launching area restricted by a narrow path down steps carved in the river bank and leading to a narrow wooden platform that Vince had installed temporarily. The river level was slightly higher than normal and had a mostly gentle current supporting the downstream movement of the boats. 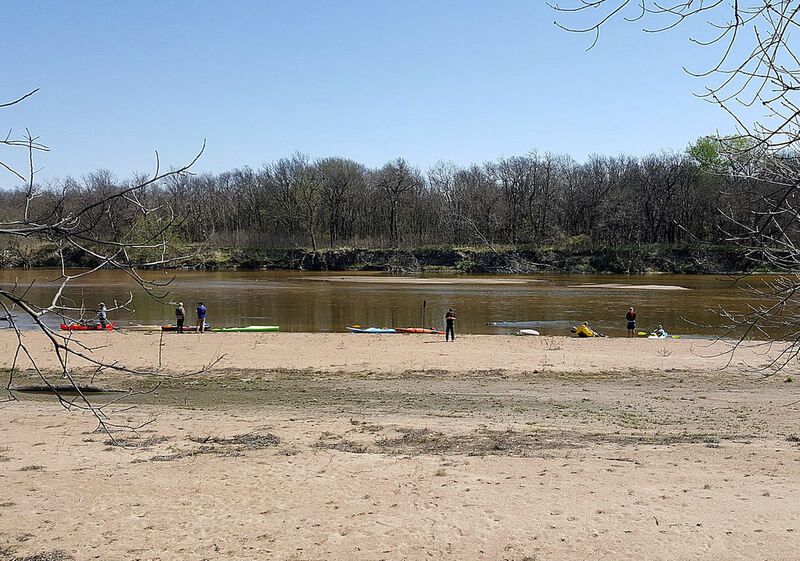 Only one sandbar (or mudbar) was in our river course but paddlers were able to circumvent that obstruction by dodging around some exposed tree roots near one side of the river. The paddlers experienced a peaceful float and observed several interesting back yards of Wichita homes along the tree-lined banks. 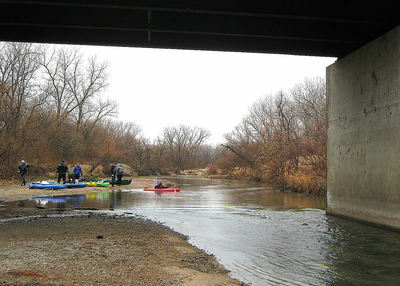 The float course went under bridges at 29th, 25th and 21st Streets before our landing at the North Woodland Park. A bit of mud was encountered on the sloping ramp at that landing site due to the recent high waters, but was only a minor problem. All paddlers were able to claim a good finish of the float without getting wet from rain or spills into the river. 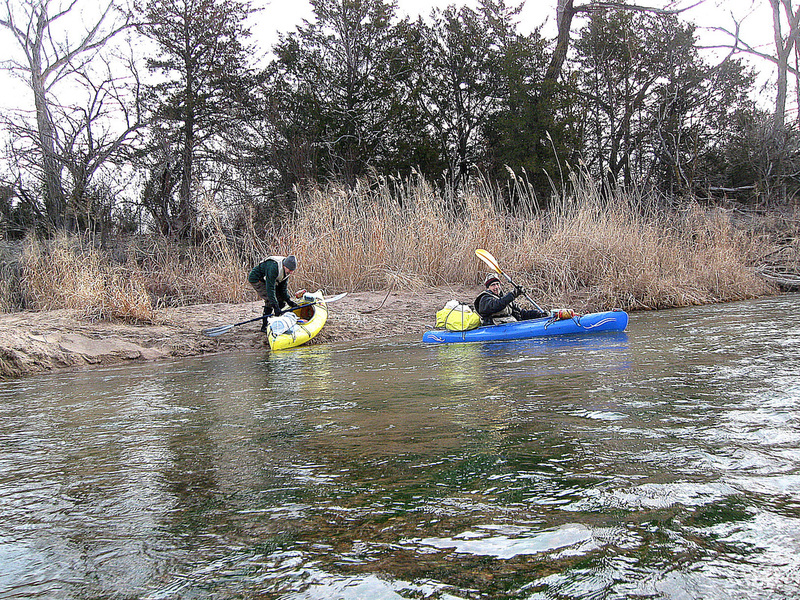 Three paddlers, Max, Kevin and Vince, made a probing float on a seldom-paddled section of the Arkansas River. 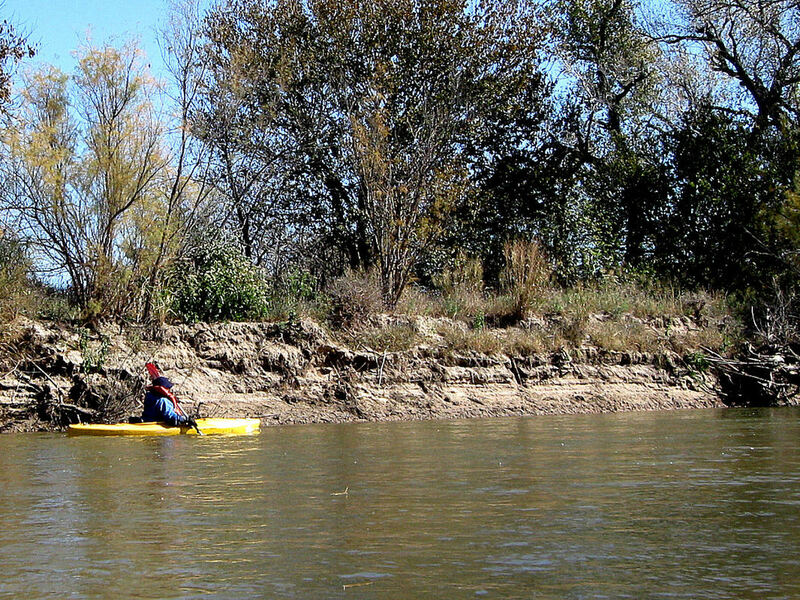 Usually the river bed from Great Bend to Ellinwood is too shallow to float a kayak. This section of the river has had both near-flood level waters and increased run-off flow for several weeks. 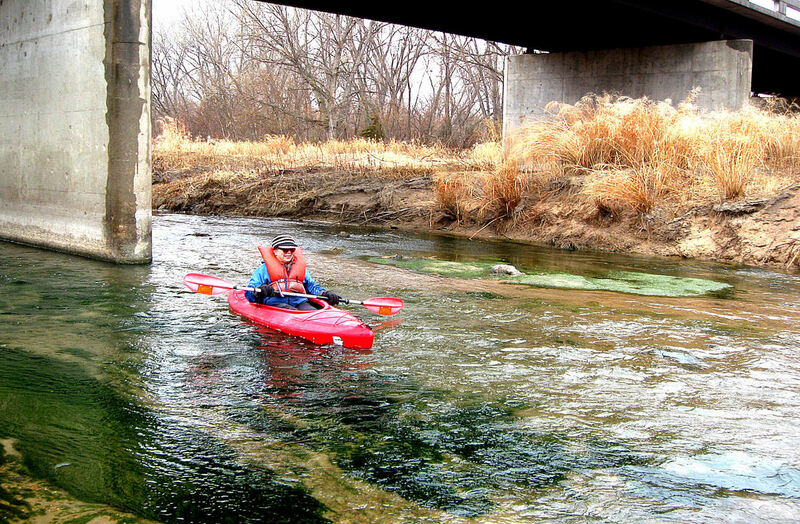 On the day of our float the flow was about 140-150 cubic feet per second (CFS). Expecting a hot day of a 100 degrees or so, we were pleasantly surprised by much cooler temperatures caused by cloudy and breezy conditions. A brief, light rain even greeted us as we launched from a sandy area underneath the US Highway 281 river bridge located at the south edge of Great Bend. There were signs of recent high waters as evidenced by the scoured banks and occasional uprooted trees along the rivers edge. 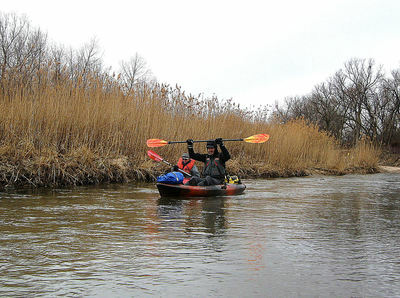 But we enjoyed the nice flowing current and adequate float depth as we easily paddled the first 5 miles of the course. Along the whole float route we observed over 2 dozen deer scampering along the river banks. One doe and her fawn stood at the edge of the sandbar and curiously observed us before bounding into the trees as we quietly paddled on. A flock of turkeys, several blue herons, a muskrat and other birds were also spotted. We made a welcomed rest stop at the Dartmouth Road South river bridge after having made one easy portage around a tree fallen across the river. 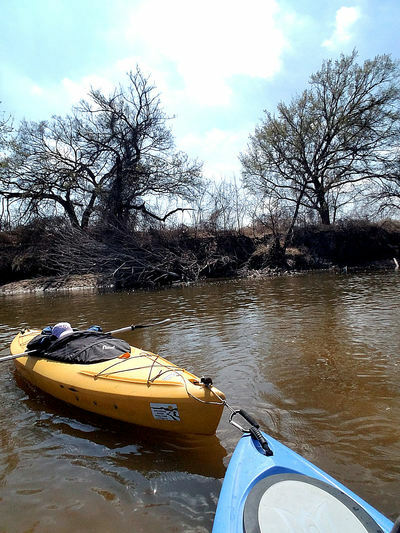 Continuing on down the river, a second portage involved threading ourselves and kayaks through the upper branches of a fallen, blocking tree......this resulted in a dampening of one paddler while trying to re-enter the kayak. Our landing at the newer road bridge located about a half mile south of Ellinwood on county road 105 Avenue was uneventful. Total river distance paddled was about 13 and 1/2 miles and we covered it in about 5 hours...........the float was given a high rating by all three intrepid paddlers! The strangest happening on this river float....I saved for last. As we floated down the river, we heard a loud cracking sound. A large, dead tree that stood over 35-40 feet tall, just crashed to the ground on the bank of the river.......no warning, no strong winds blowing or earthquakes quaking.......the tree just gave up and fell over. 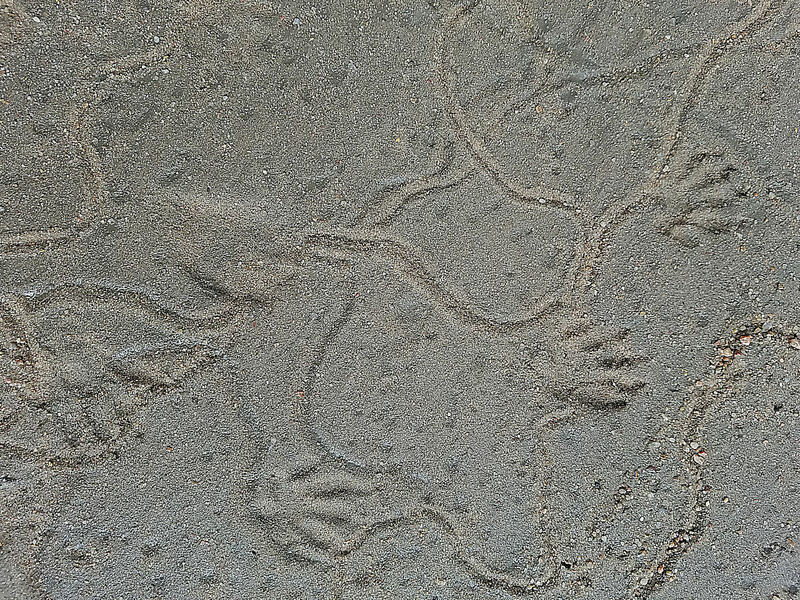 Fortunately, it fell away from the river bed or we paddlers would have been using its wood splinters for crutches! On this warm, sunny day there was a good river water level and a nice flowing current. 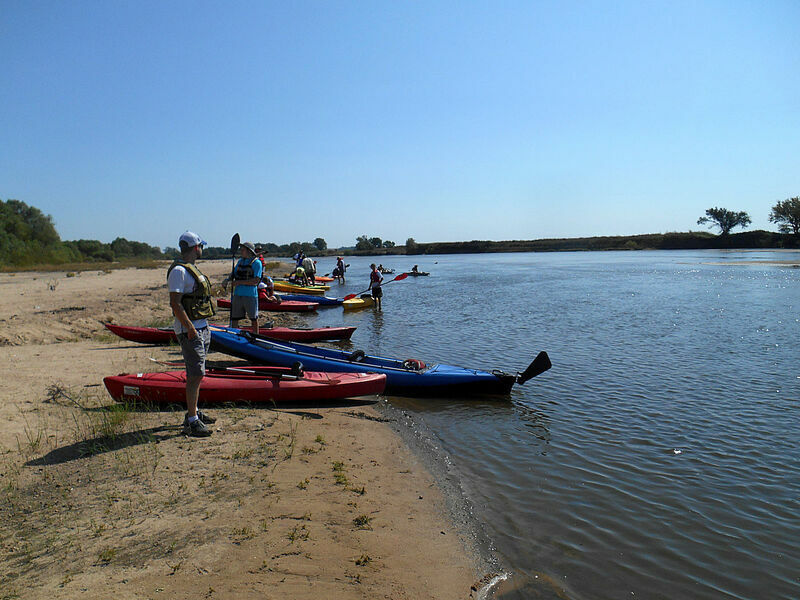 19 total paddlers were present to participate in this river float. After running the prerequisite shuttle, we launched our kayaks from a convenient concrete ramp that was located just below the Lincoln Street Dam. 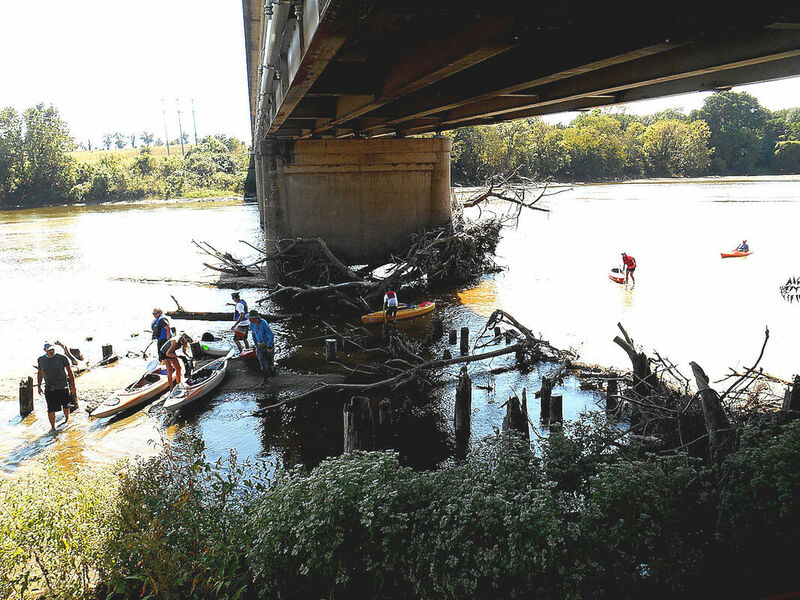 The paddlers had to immediately line their boats up and paddle through the openings between the steel supports of the K&O railroad bridge. One paddler managed to careen off one of the supports, but did not spill into the water. Just below the bridge a paddler lost the plastic blade-end of the paddle-------it sank below the river surface before it could be retrieved. 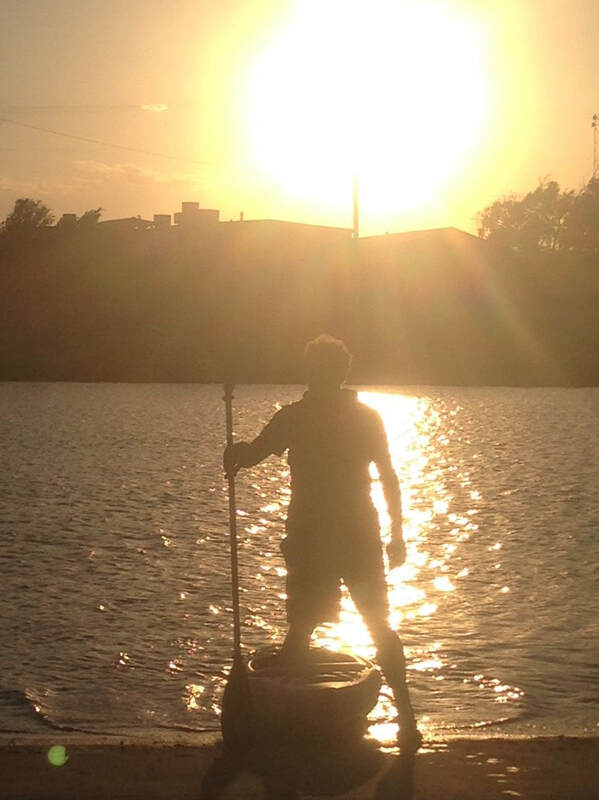 Kevin was floating nearby and immediately gave that one-bladed paddler his intact two-bladed paddle. 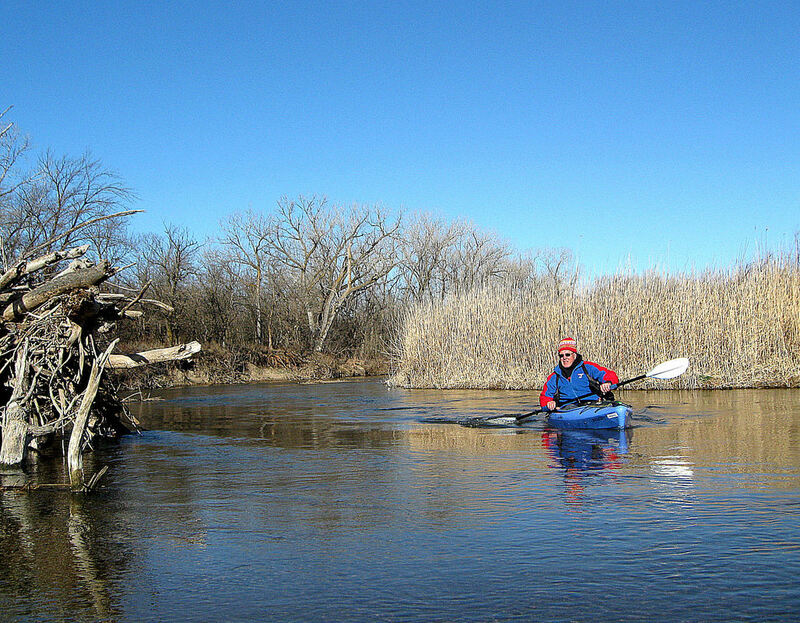 He took that one-bladed paddle and did canoe strokes the rest of the journey down river. 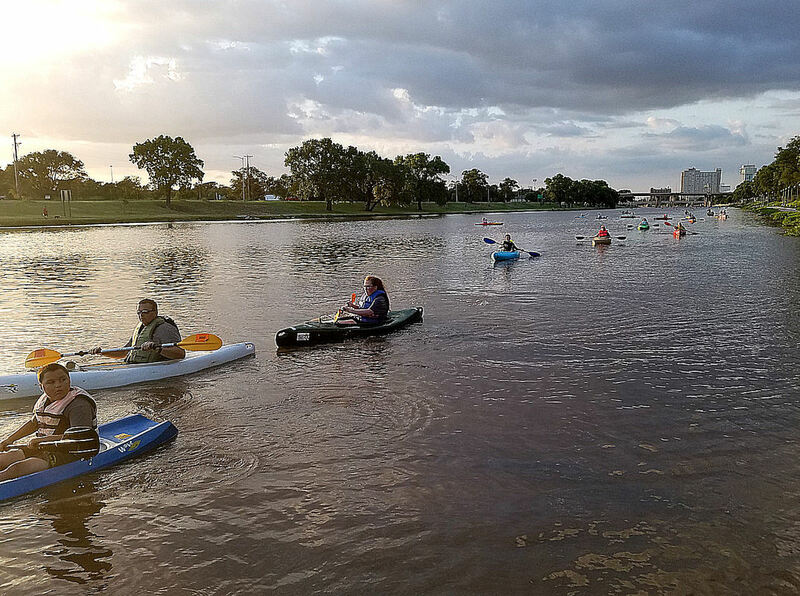 All starting issues were resolved and the paddlers leisurely floated under Harry St. and Pawnee St. bridges without confronting any shallow water or sandbars. Under those bridges we viewed evidence of homeless persons living in those sheltered areas. Next on the float itinerary came the historic John Mack bridge, then a cautious maneuvering under the long span of the Union Pacific railroad bridge, circumventing a few pilings protruding upward through the river's surface. Just below the railroad bridge, the participants viewed an interesting tent encampment that possibly sheltered more homeless folks. 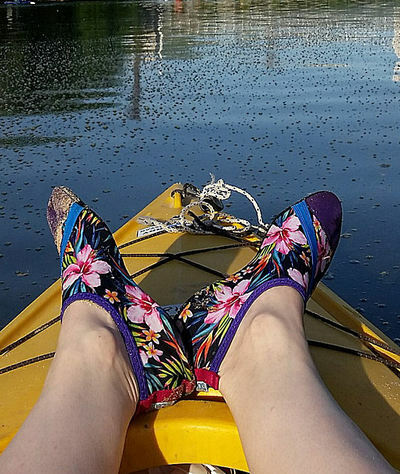 We continued floating along a lengthy, bank-lined wooded stretch. 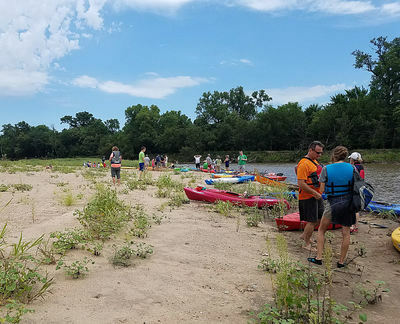 All 19 float participants landed high and dry (well, maybe a little perspiration and wet feet) on a sandbar next to the Garvey Park area. Then it was load-up time and off to the ice cream or cool drink establishments! 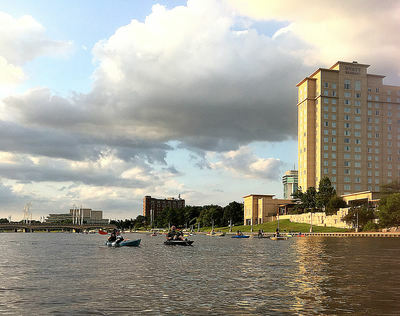 ** Additional note from the website coordinator: The body was later confirmed to be that of Brian Bergkamp who lost his life trying to save a fellow kayaker at the 21st Street dam. 15 experienced paddlers participated in this float. The river was running higher than normal with water covering most of the sandbars and the surface stretched from bank's edge to bank's edge. New and less experienced paddlers were not encouraged to join this float as there were some known and unknown river hazards due to increased flow conditions. 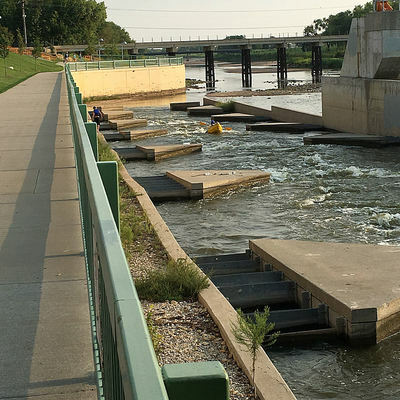 At the time of launching the boats, the Arkansas River water flow was about 3,900 cubic feet per second at the Mulvane river gage..... during normal times it would have been around 400-500 cfs. Under a warm sun, the paddlers were off and running on a faster current than normal (about 4-5 miles per hour) and they generally had the whole river width to paddle without concern of hanging up on hidden sandy shoals. A lot of trash was observed stuck in the overhanging trees and brush piles. As evidence of the recent continuing high river water level, there were many smaller trees and associated roots sagging and fallen along the waters edge. One paddler retrieved a serviceable youth kayak paddle from trapped debris along the river's edge. 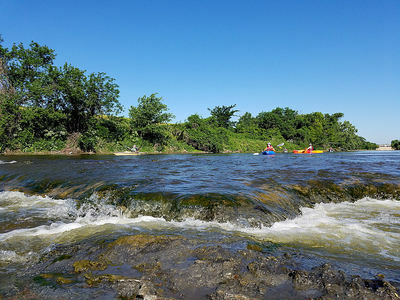 Only a few areas of ripples and choppy water were experienced by the paddlers, generally in the 'rock gardens', the descriptive name for the rocky river bottom area near Mulvane. Making excellent downriver progress, the group stopped on one of the few exposed sandbars located just below the Highway 53 river bridge located west of Mulvane. 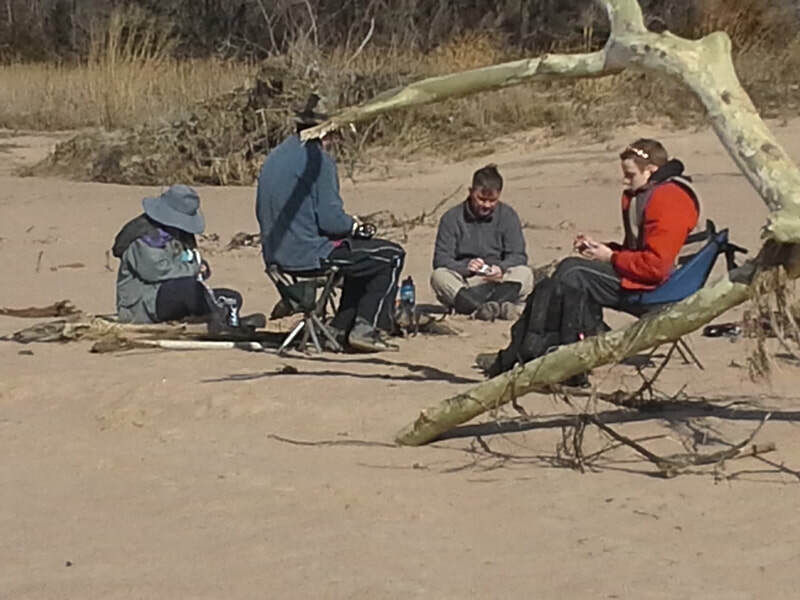 In the shade of a few trees along the rivers edge, we had our lunch break and shared experiences and stories. Max shared information about the book he was writing regarding the Arkansas River. 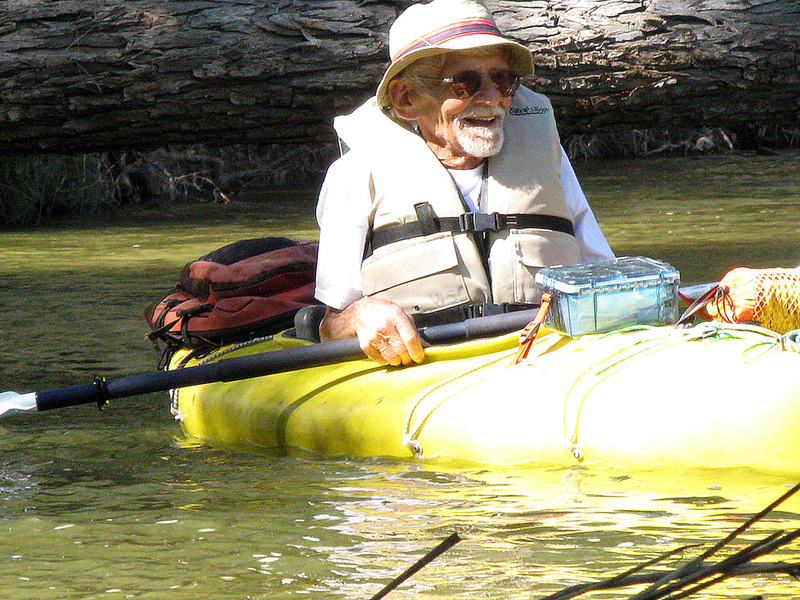 Bill and Bob shared stories about their paddling experiences on other rivers across the West. 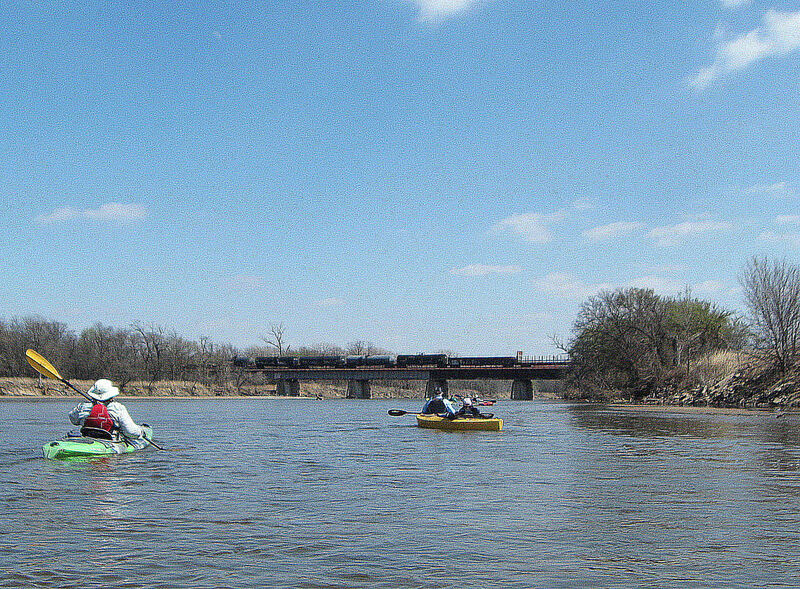 Back on the river after the lunch and rest break, the paddlers approached the BNSF railroad bridge just as a westbound container train rumbled across. After the group paddled a short distance beyond the double-tracked railroad bridge, a unit coal trail was heading east. Raised and waiving paddles from some of the group elicited a train whistle response from the engineer. As we neared our landing point, the southerly wind was blowing at a reasonable and somewhat 'cooling' level. The landing at the Goat Ranch was a bit rougher and slower, but many helping hands made it go as smoothly as possible. Most participants seemed to agree that it was an enjoyable, fast moving river float, although one participant was heard to say....."I think I enjoy paddling during the periods of a normal water level on the river as it is more interesting and challenging to seek navigable channels at a slower pace". There were 14 paddlers, mostly experienced paddlers with one new paddler, on this Saturday river float. A few came from surrounding communities: Joan from Kinsley, Bob from around Marion Lake, Ryan from Pratt, with the remainder from the Wichita area. We had a good start at the West Alden bridge access. The water flow in the river was slightly higher and running with a good current. The weather started out mild with some wind from a southerly direction. Almost immediately after launching our kayaks (and one canoe), we made a portage as a downed tree was blocking the river. It wasn't a difficult portage and we were quickly on our way again. There were many twists and turns on this part of the river and we dodged around low hanging tree branches along the river course. We saw lot of the common reed vegetation growing tall along the sandbars and banks. Occasionally the float leader spotted a deer and waterfowl were common. The float provided a good opportunity for paddlers to visit and meet with others. A short distance past the halfway mark of the float, we had a lunch break at the South Alden bridge and access site. Paddlers sat in the shadow of the bridge, visited and enjoyed the respite. 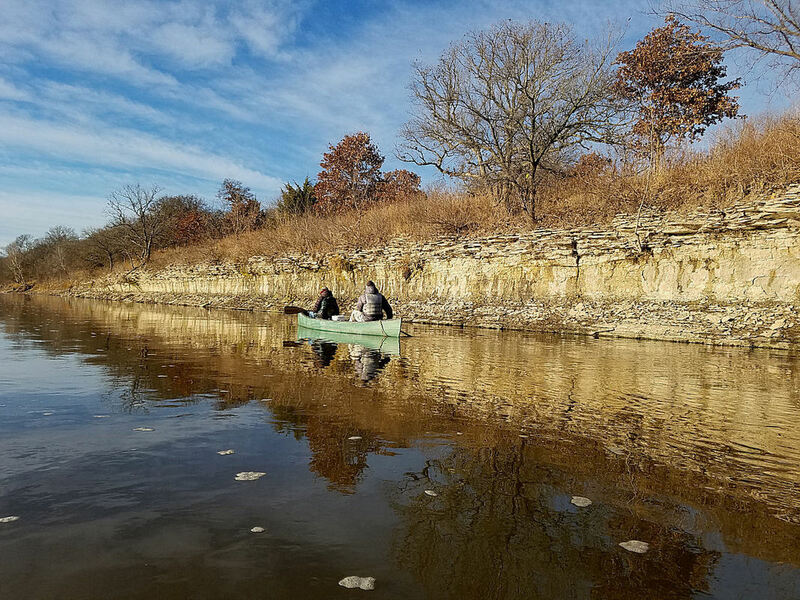 During the lunch break, one of our veteran paddlers, Ryan with the KS Wildlife, Parks & Tourism did some netting for small fish along the edge of the stream. 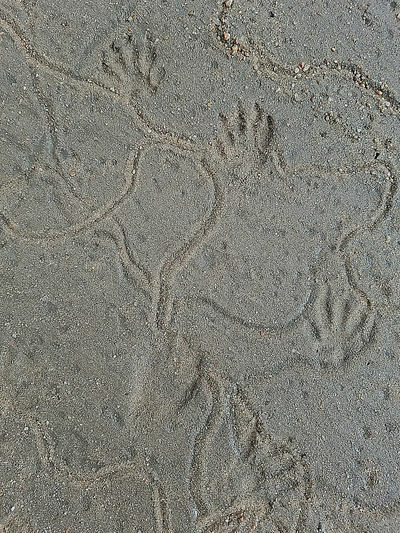 He also provided an informal description of the wildlife inhabiting the area. After the lunch break, we were refreshed and back on the river..........the day' temperature was starting to warm up, but a bit of breeze and an occasional pass under the shade of trees helped keep the heat factor reduced. We had one more portage near the landing site......a couple of the paddlers did get pushed up against the offending tree trunk, but Ryan and Randy waded into the river and pulled them back away from the obstruction. Our landing at the West Sterling bridge was without incident and around 1:30 we were loaded up and heading off to home. This Wednesday evening float was held on the Little Arkansas River, the course running from South Riverside Park (by the tennis courts) to near the Bitting St. bridge & 12th St.
34 paddlers showed up with a few canceling at the last minute due to hotter weather. There were many first timers (including an 8 year-old boy) and a few old timers. We started from the south end of the river course at a later time (around 7 p.m.) in order to minimize the effects of the hot day and strong south wind......and we faced a minimal river current. After a successful launch of the 33 single kayaks and one tandem, we kept river right to avoid collision with a couple of 4-person long boats from the Wichita Rowing Club, who were also on the river course. Kevin started out pulling an extra empty kayak (a result of one of the last-minute cancellations). 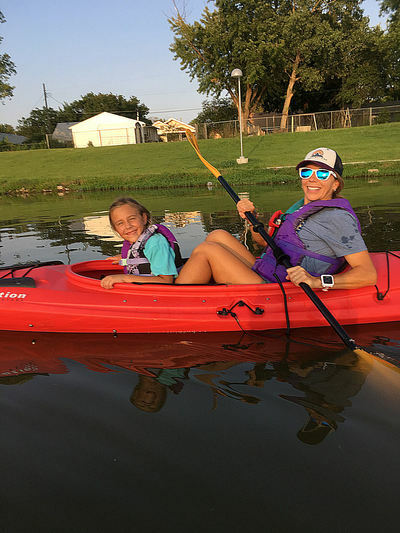 Within minutes of launching, he attached a second kayak to his string, towing the occupant, a young boy, who had difficulty making 'forward' progress. Kevin admits to being 'tired' at the end of that paddling effort. The other paddlers appeared to enjoy the scenic route with views of the riverside homes, plus they visited with each other as they paddled. 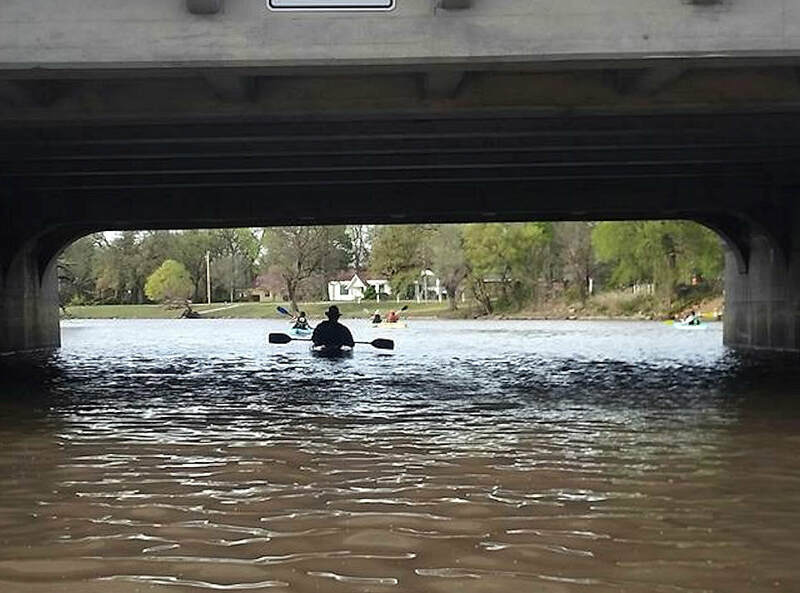 Towards the end of the course, a handful of paddlers went under the Bitting St. bridge and around Meeds Island before making their final landing. All paddlers landed safely (and dry) at the old concrete landing dock near the Bitting St. bridge. This float was on the Arkansas River starting at Garvey Park in Wichita and ending at the 71st Street South Canoe Launch. The river float was intended for more experienced paddlers but not for first-time paddlers. 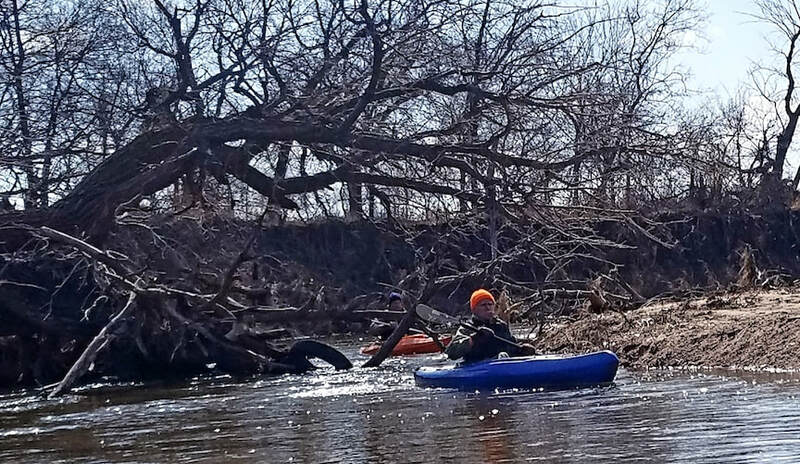 The float involved some moderate paddling skills to avoid the river hazards such as pilings under bridges, rocky areas creating rapids and fast water, and partially submerged pipelines. The paddlers got a timely start around 9:15 in the morning. The river was running with a good current and the water was above normal at 600 CFS (John Mack Bridge river gauge). 19 paddlers in 18 boats floated this interesting course that included some minor challenges of maneuvering around obstacles and through fast water courses. Vince calls it the 'Rocky River Run' as it involves some both man-made and natural rocky areas. 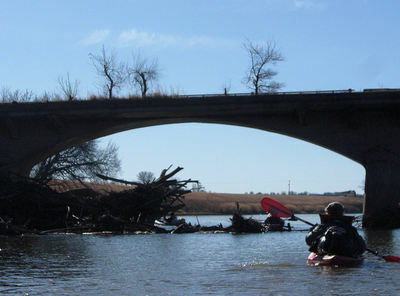 To begin with, we floated around some wood pilings under the twin bridges carrying I-135. Next we were buzzed by a large flock of diving swallows under the Hydraulic St. bridge. The paddlers easily maneuvered through the minor rapids below the Hydraulic St. bridge, but a few boats were temporarily grounded on shallow and sandy shoals just below those rapids. 18 boats were able to just scrape over the rocky river bottom stretch located prior to reaching the Turnpike twin bridges. Then we all enjoyed the longer rocky rapids located beneath and below the MacArthur St. twin bridges...... they were fun, fast and with fairly big waves. On the rest of the float route we followed the typical winding water course in the river bed, floating over a few more partially buried pipelines. Many of the paddlers visited with fellow paddlers as we leisurely floated this section of the river. We spotted a few homes in the Derby area that were close to the river's edge and exchanged brief conversations with a couple of owners who watched our passing. The last one big pipeline, located above the 63rd St. bridge, had a fairly significant drop of 18-24 inches or so. The paddlers had a quick 'thrill ride' over the minor rapids created by that obstacle. Just before noontime, the 19 paddlers all pulled into the 71st Street Canoe Landing, finishing up the 7 1/2 mile river float......and they welcomed the final and only rest stop! 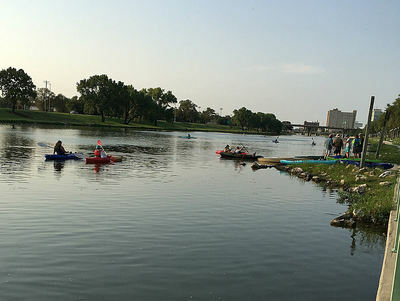 48 paddlers in 44 boats met at Cowtown for launching on a beautiful late Thursday afternoon. There were about six children and teenagers in the group with the adults ranging in ages from 18 to 83. 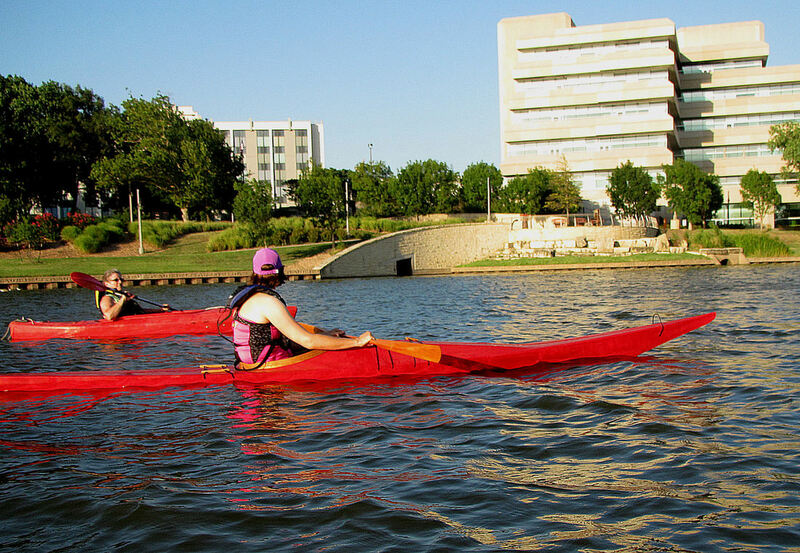 After a successful launching of all the kayaks and one canoe, we enjoyed a leisurely float past the many scenic downtown sights of Wichita. 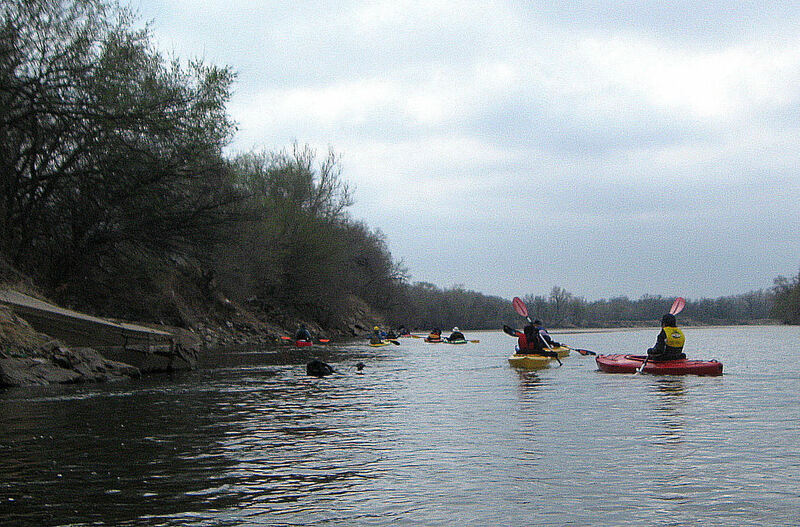 Many of the paddlers used their cell phones and cameras to capture images of the Keeper of the Plains, Exploration Place (jutting out into the river's edge), plus many of the bridges and downtown buildings......and friends photographed other fellow paddlers as they floated in the easy current and still waters of the Arkansas River. 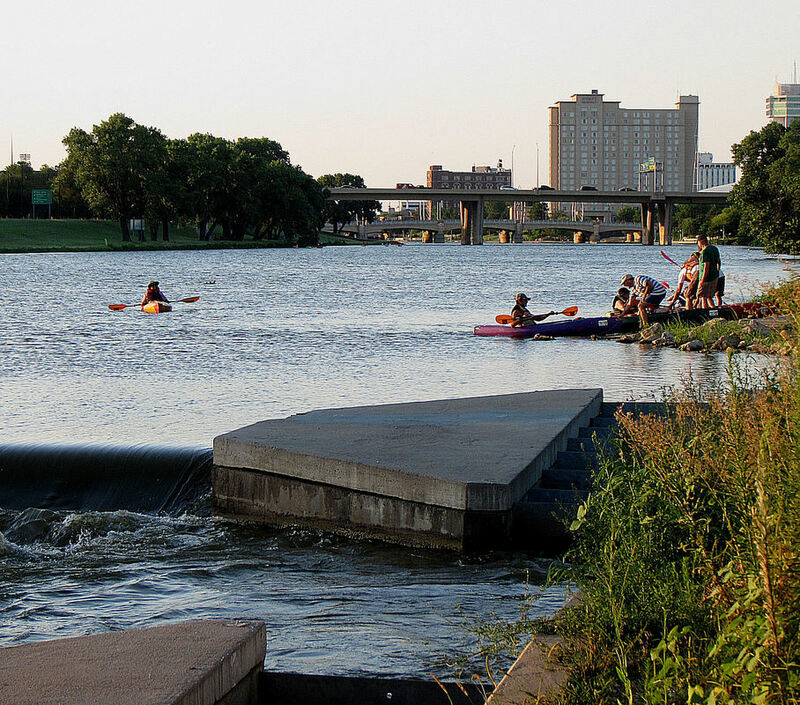 An uneventful landing was made just above the Lincoln Street dam and bridge. 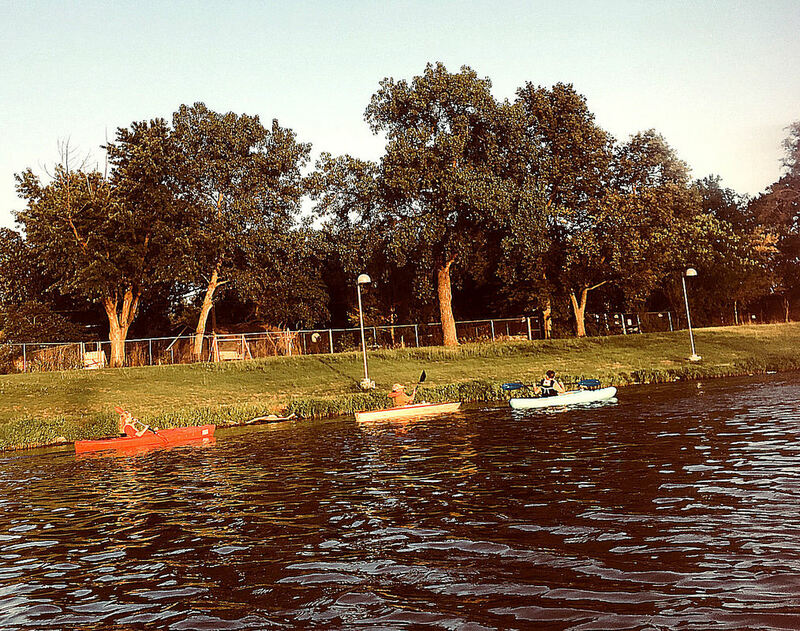 Boats were loaded and gear stowed, while the paddlers shared their views of a pleasant evening on the river. 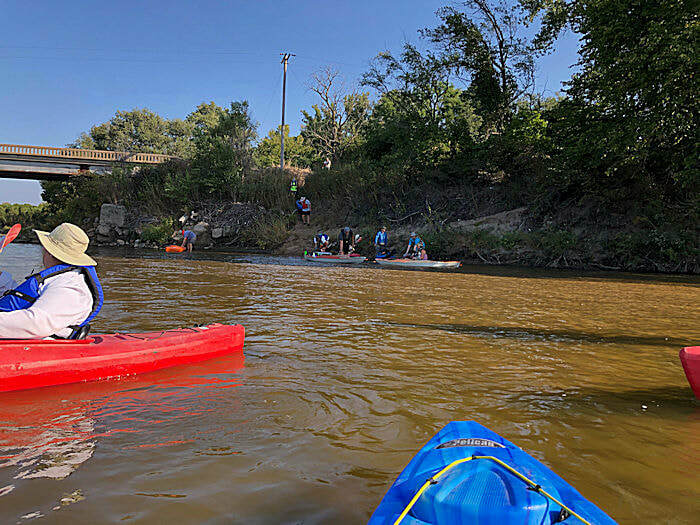 This float, on the Elk River above the Elk City Lake, was unusual in that the venue was outside the Arkansas River watershed. 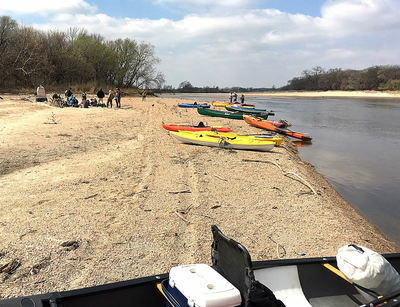 Sixteen participants launched their boats from the gravel beach under the iron bridge about a mile and a half east of Elk City, a very popular fishing place that morning. Despite midweek forecasts which may have discouraged some would be participants, the weather was perfect for a float. Due to earlier rains the inflow to the lake provided a gentle current for a quiet and relaxing float. 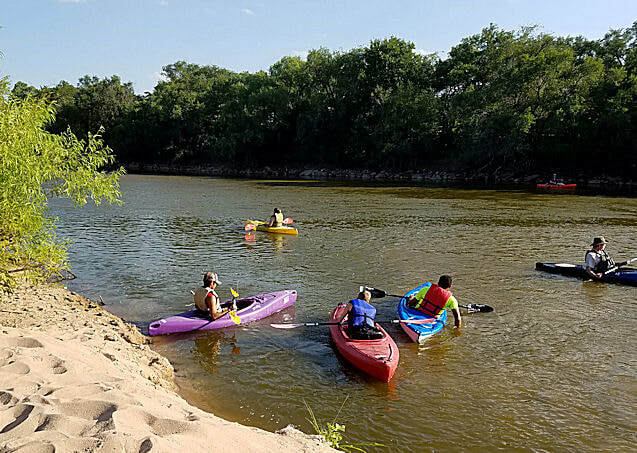 This river with mostly steep banks, in contrast with the miles of sandbars on the Ark, offers fewer opportunities when looking for a place for the lunch break rest stop. We opted for a grassy area that had been enjoyed on a previous trip. But higher water level now made landing, and reentering the boats later, using a fallen tree as a dock, very challenging. Fortunately, all made it without the fatal slip that sends you plunging into the water. Also unusual about this trip was that the optional camping was in the Card Creek campground giving an opportunity for those who do not camp out of their boat to participate. Very special thanks go to Paul and Terry Voth who live in Independence and frequently camp at Card Creek in their camper. They arranged for campsite space for 14 campers who stayed (some in campers) and brought fire wood for the campfire. 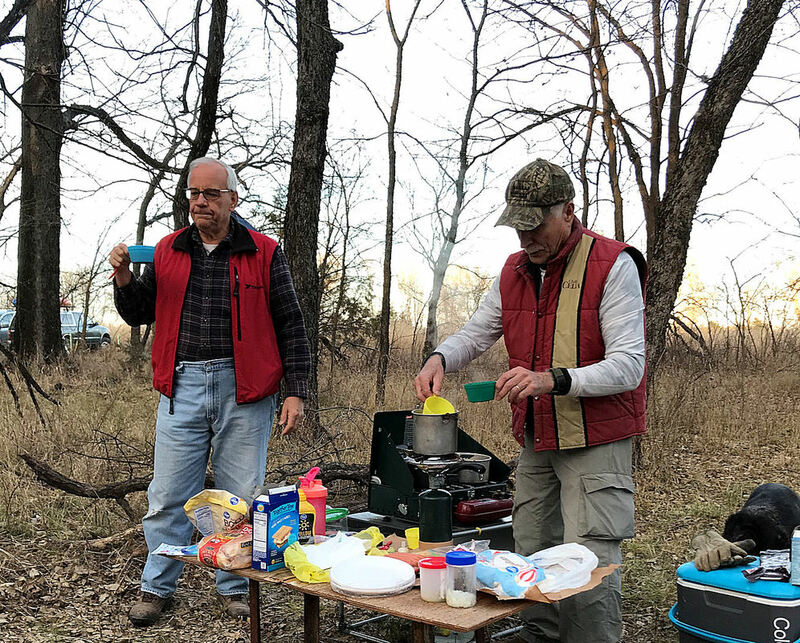 At supper time they provided bass and catfish from the lake, produce of their fishing skills, that were fried, together with potatoes, over a campfire grill and on Coleman stoves, for the most delicious supper ever. A lot of Ramen noodles, canned stew and other heat and eat meals stayed in stuff sacks that evening, maybe to be used on another trip. Next morning their bacon, sausage and donuts again preempted instant oatmeal, granola bars and such. Thank you Paul and Terry. Thank you as well to Moriah who at breakfast shared boiled eggs from the half dozen chickens she keeps in her back yard. course without capsize or pin against an obstacle. Some notes on birds and other wildlife seen during our April 16-17 float near Elk City: I saw several Scissor-tailed Flycatchers on the drive from Wichita. These distinctive long-tailed birdswere newly back from tropical lands for the spring nesting season. Arriving at the put-in site on the Elk River, we were greeted by a large flock of Cliff Swallows building their mud nests on the river bridge, and two adult Bald Eagles. Birds seen while floating the river included many Turkey vultures, Red-tailed Hawks, Red-shouldered Hawks (heard only), Great Blue Herons, Green Herons, a Pileated Woodpecker, Turkeys, several species of ducks, and much more. Early Sunday morning before dawn, Barred Owls woke the camp with a loud chorus of hoots and other, stranger sounds. We saw a great deal of beaver sign, and several deer. Also, a small flock of domestic goats were seen on the high ground above the river banks, doing their best imitation of their larger wild cousins from the mountains. As we paddled on Sunday morning we encountered prehistoric looking Gar fish in the shallows that we could touch with our paddles, provoking little response. One special highlight for me-- on Saturday evening, and again on Sunday afternoon while leaving the area, I stopped by the observation overlook near the west end of the Elk City Lake dam. Both times I spotted a Black Vulture-- in fact I spotted two flying together on Sunday's visit. I've never seen this species in Kansas before-- its range is normally confined to states further south or east. I've since learned that of the relatively few sightings of this species that have been recorded for Kansas, many have come from this very same location-- the Elk City dam is a "hot spot" for migrating vultures, mainly Turkey Vultures, but occasionally including a few Black Vultures as well. The Galena area is another Kansas "hot spot" for the species. On March 26th, the Arkansas River Coalition had a river float that went from Grouse Creek, near Silverdale, KS, to Trader's Bend, in Oklahoma, where the river runs into the Kaw Lake. 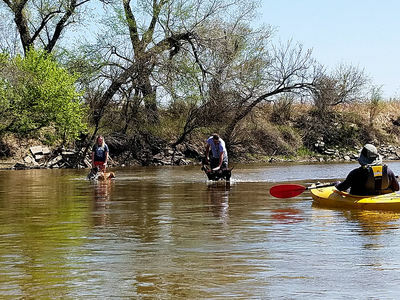 12 paddlers (and 1 dog) experienced a good day of paddling going the 9-mile distance on a river that was running a bit higher than normal. Due to the slightly higher river flow, we were able to launch at Grouse Creek and float the short distance from the boat ramp to the river channel without dodging many obstructions or dragging through shallow water. 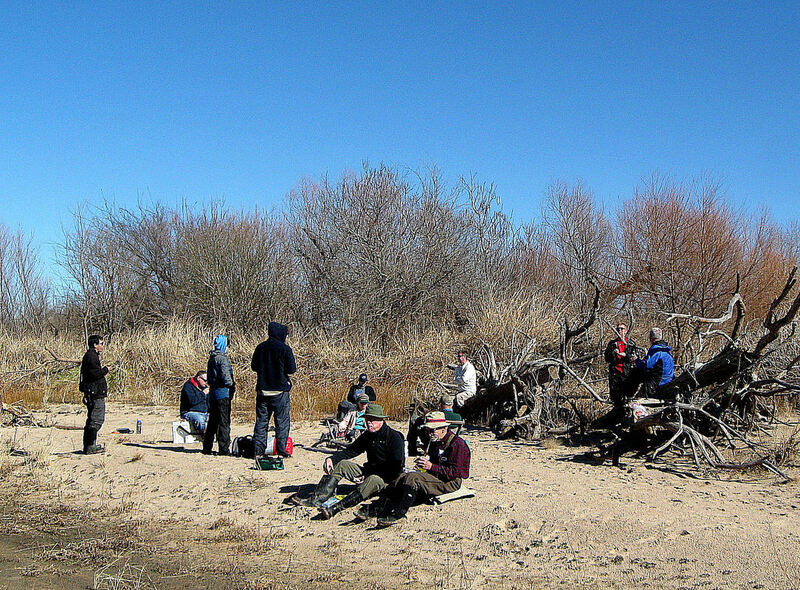 A lunch stop was made on the river bank near where a dry wash entered the river. A fire was built, mostly for effect as the temperature was mild. After resting and consuming a bit of lunch, the paddlers again launched their boats and moved on down the river. Water birds were spotted and some young turkey vultures sat on a sandbar and eyed us as we floated by. As we neared our landing site, our river course shifted to the WNW and into a strong head wind. We all paddled vigorously against the low, splashing waves and blowing northwest wind for about a quarter of a mile. Fortunately we were within a short distance from out landing site at Trader's Bend and we were able to pull up to the partially silted-in boat ramp. 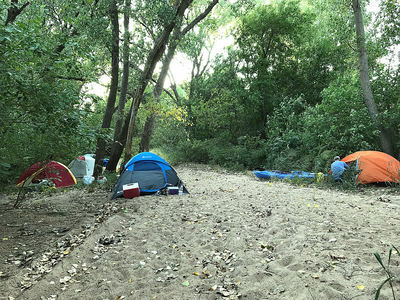 Seven of the paddlers pitched tents at the rough camp site at Trader's Bend, while the remainder of the folks headed back to their homes. A few of the campers took short hikes around the area that included the near-by old archaeological site of a 1700s French trading post. The next morning the campers packed up and headed to Beaver Creek which runs into the Kaw Lake. We had a nice paved parking area and ramp where we launched and landed our boats. The paddlers wound their way about 2-3 miles up Beaver Creek on the backwaters of the Lake. We observed some bird life and nice groves of trees along the float route. About three of the paddlers squeezed through a rocky creek channel to extend the float a couple of blocks further. 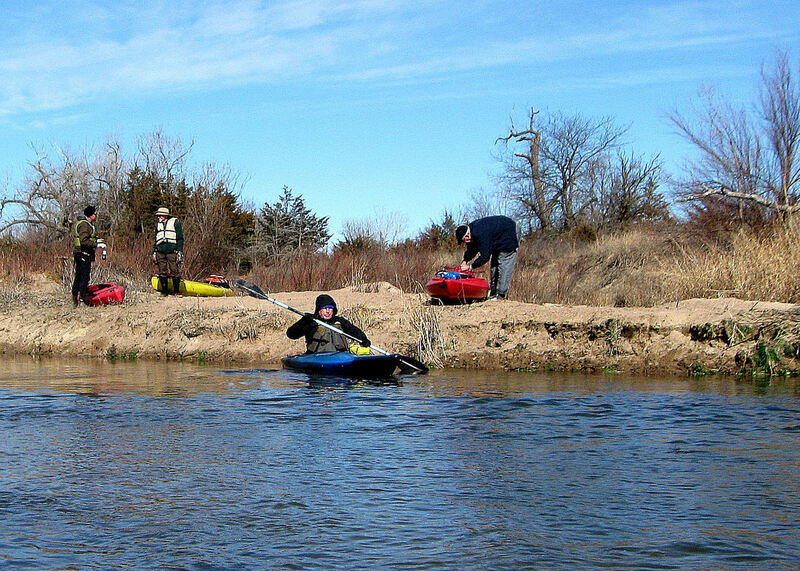 Then it was time to turn back and paddle down the creek where we landed, loaded boats and make our way home to the Wichita area. 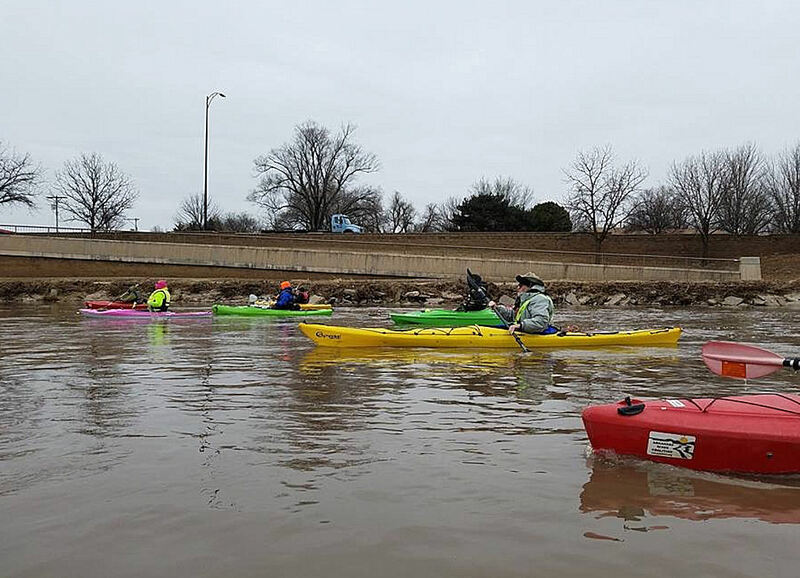 Twenty-four floaters (23 kayaks and one canoe) launched from the 4th Street Arkansas River bridge west of Hutchinson on an unseasonably warm and welcome February day. 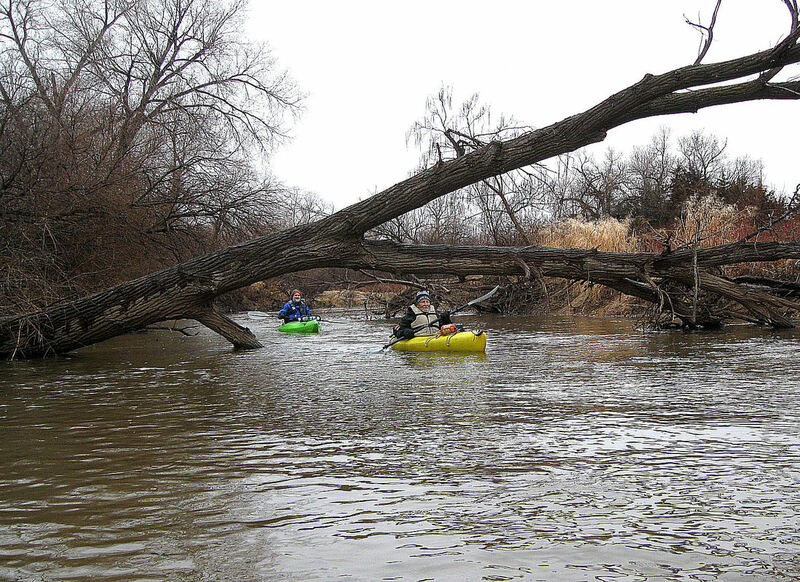 The floaters enjoyed this stretch of the river, which included floating by Carey Park. 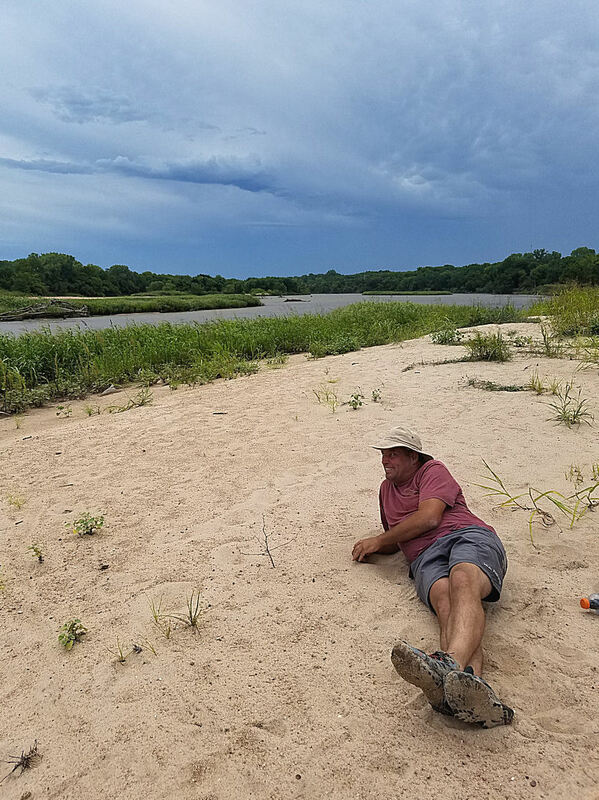 While eating lunch on a sand bar, Ryan Waters (Wildlife & Parks) netted an Arkansas Darter, a tiny fish that has recently been found again in Kansas after spending years on the endangered species list. Vince Marshall (historian) shared his knowledge of an invasive grass named Common Reed (Phragmites Australis) that is spreading along the Arkansas River. 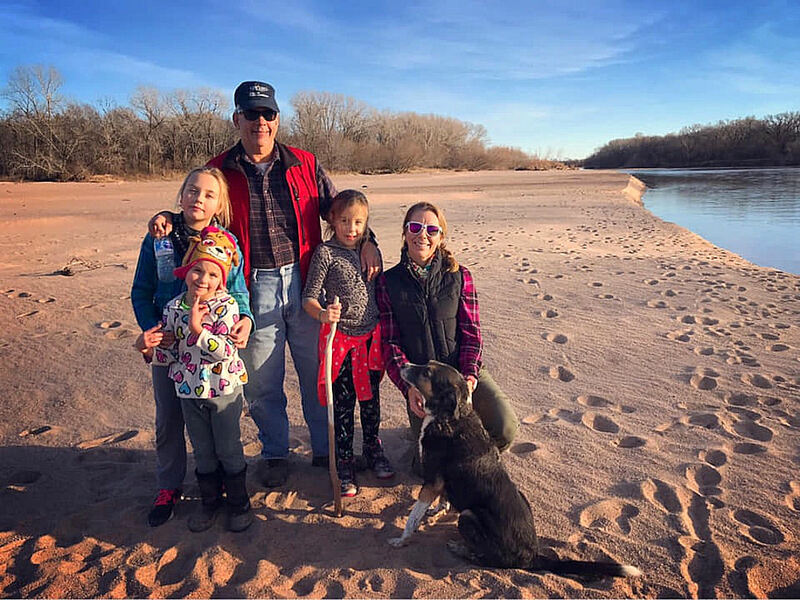 Beaver and deer were sighted, and Steve Seibel, an amateur ornithologist, was peppered with questions about every bird heard and seen that we didn’t recognize. We reached Yoder Road mid-afternoon, aided by an encouraging current and few sand bar delays. 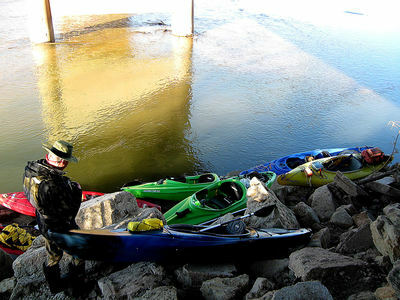 Nine paddlers shuttled to the Haven Street Bridge and floated a little further down river to set up camp for the night. They were treated to a beautiful evening to sit by the fire and share stories and observations. The almost full moon provided plenty of natural light. We watched a large group of turkeys roost in trees down river, listened to owls responding to each other, and later coyotes serenaded us as we snuggled in our tents. We woke to another pretty day on Sunday, and launched just as the predicted wind kicked in. Because it was mostly a tailwind, we were able to concentrate on the wildlife which included a few bald eagles soaring overhead, killdeers hollering as we floated by and belted kingfishers loudly reminding us this was their territory. We were more exposed to the full force of the wind as we hauled our boats and equipment across a large sandy beach at the takeout. That trek had to be repeated several times as we carried dry bags and boats, giving our legs a good post-float workout. Thanks, Wally & Vince, for another delightful kayaking float! 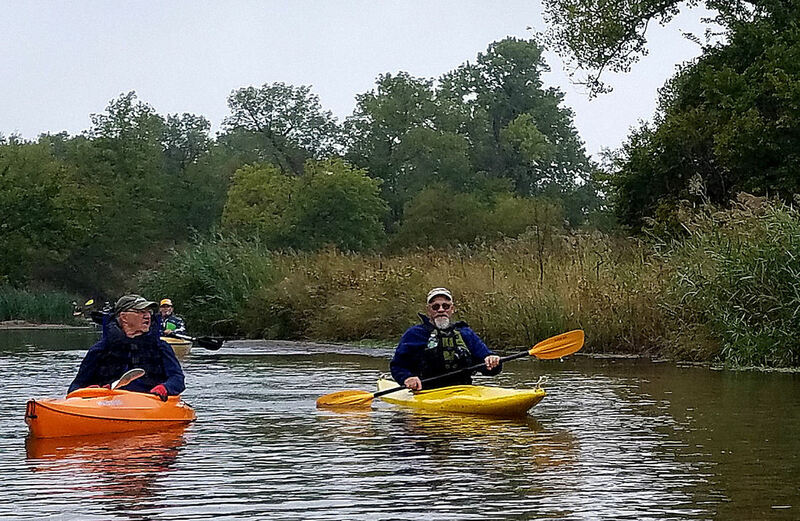 Wally Seibel in yellow kayak, son Steve Seibel in blue. ​On Saturday, Jan. 23rd, Mark, Ann, Bob, Ruth, Wally, Steve and Vince launched their kayaks and canoe next to the West Sterling bridge over the Arkansas River. It was a fairly cold and cloudy day in the beginning, but the water was flowing nice and clear . . . and inviting! This area of the Arkansas has a fairly narrow water channel with lots of tall, common reed growth along the sandbars and banks. 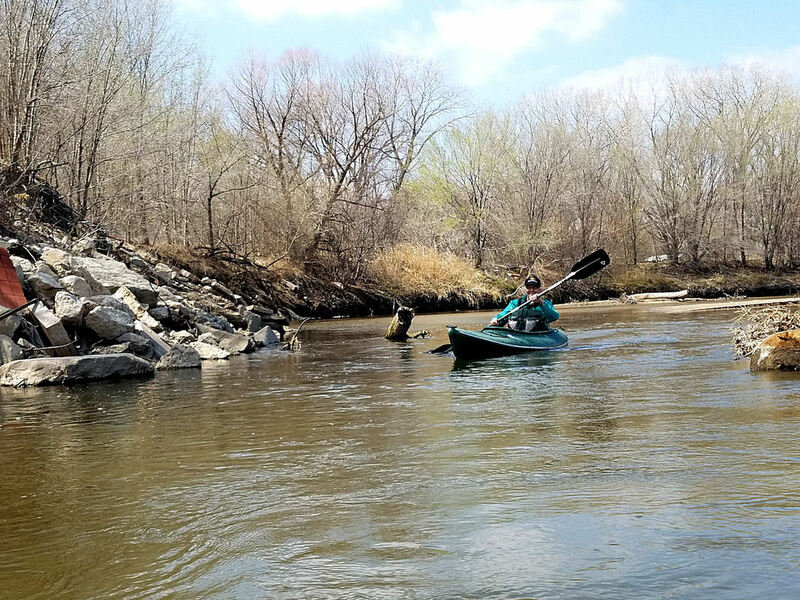 We easily paddled along in the fairly swift current, working our way around occasional limbs and roots of fallen trees located mostly at the river bends. There were even some rocky bottoms and fast churning ripples, often located at the ends of long and wider pools of water, that we experienced. 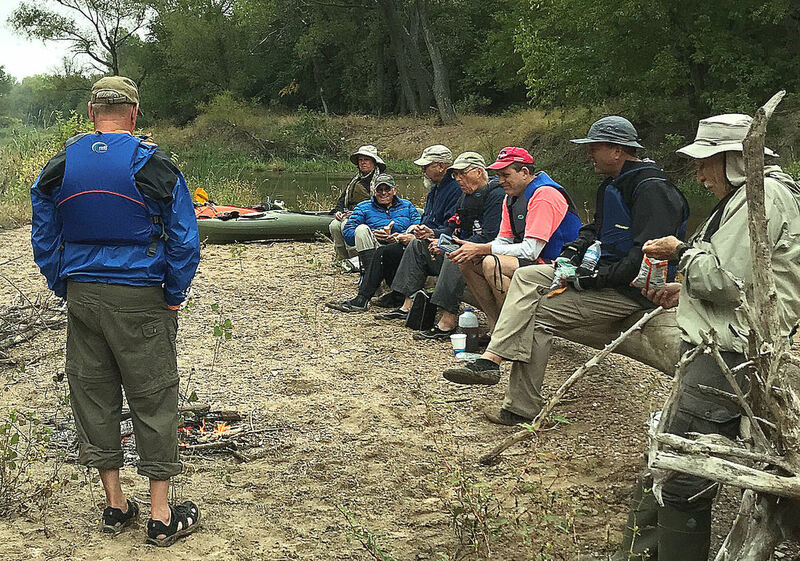 The seven paddlers stopped for the usual noon-hour campfire and lunch. The sun was beginning to break through the clouds by the time we resumed our river journey and the air temperature warmed considerably. After seeing our usual wildlife (deer, waterfowl) along the river banks, we were surprised to spot a camel up on a high bank next to our river course . . . we can only surmise that it was a walkaway from the Hedricks' Exotic Animal Farm located near Nickerson. We arrived at the K-14/96 bridge located just a short distance west of Nickerson where four of the paddlers loaded their boats and headed for home. Wally, Steve and Vince continued a short distance down the river and landed on a narrow sandbar area to make evening camp. 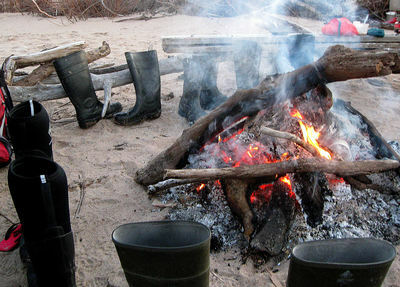 They pitched tents, gathered wood and built a warming fire, settling in for a nice cool evening by the riverside. When Vince woke up in the early morning to build the fire, he was sure that he possessed some royal blood in that his back was a bit sore from sleeping on a pea . . . or something (that 'something' was actually a small wash stone under his sleeping bag!) He decided that for the next campout, he would bring his sleeping matt to provide increased comfort! The three paddlers packed up their camping gear in their kayaks and launched again on the river. 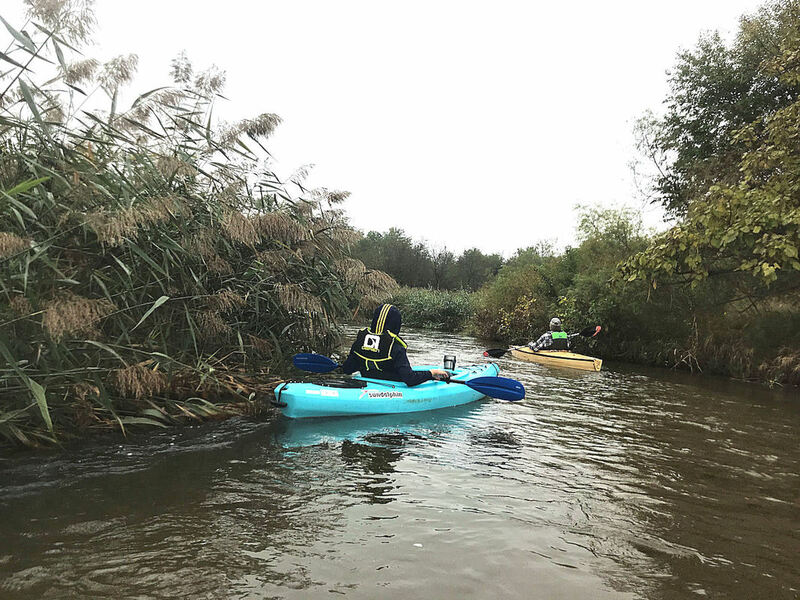 They experienced paddling through several narrow passages that involved dodging tree limbs and roots blocking most of the river channel. One blockage involved a partially submerged tree trunk that Steve was eventually able to work his kayak over, but Wally and Vince took the portage route around the obstruction. 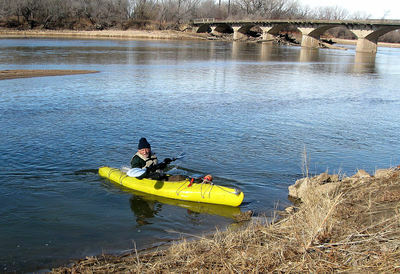 By the early afternoon, the paddlers landed at the West 4th Street bridge located a short distance west of Hutchinson. They later relived and celebrated a successful 17-mile river journey down the mighty Arkansas over the lunch table in a Hutchinson eating establishment.